There's something deeply disquieting about a snow storm. The muffled sounds, the diffuse light, the eerie stillness... beautiful, yet silently deadly. 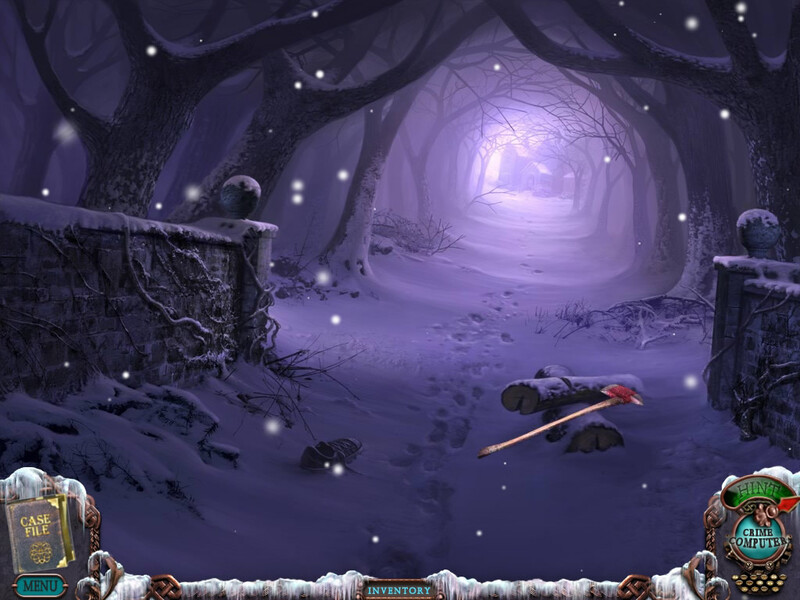 It's in the midst of one such raging storm that you will find yourself in Mystery Case Files: Dire Grove, the much-anticipated follow-up to Mystery Case Files: Return to Ravenhearst. 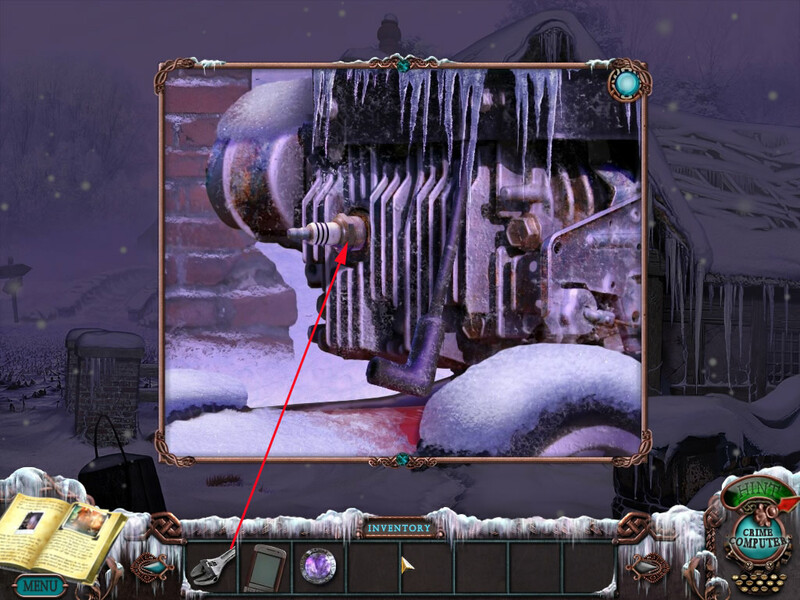 Once again Mystery Case Files has produced a stunning adventure/hidden object hybrid that will send shivers of cold up and down your spine. A quick search of the car reveals no living person, only a handy video recorder and a deeply disturbing note. Continue your explorations and you will begin to come across video tapes scattered in various places, each tape a short vignette into the story of four college students and their trip to Dire Grove. What happened here? Where are the students? Where are all the people? Why is it so darned cold? Perhaps you'd better explore further. 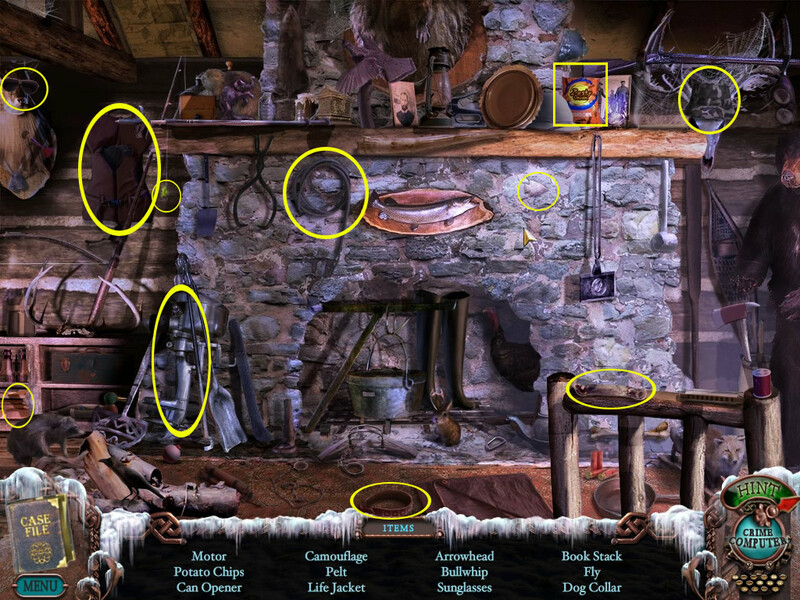 Mystery Case Files: Dire Grove, like its predecessor, is built around three things: point-and-click exploring, puzzle solving, and the classic hidden objects scenes the MCF series is known for. Navigation is simple, just move your mouse cursor around and directional arrows will appear. The cursor changes to a magnifying glass when something needs to be looked at closer, or a hand-shaped cursor if you've passed over something that can be taken or manipulated. 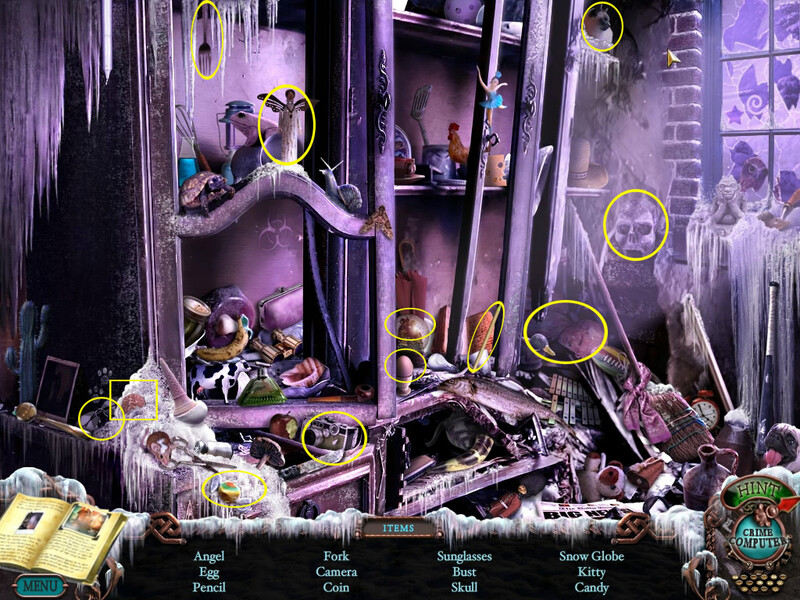 Objects or places of interest will catch the eye with a brief single sparkle, and hidden object scenes are denoted by a shower of sparklies. 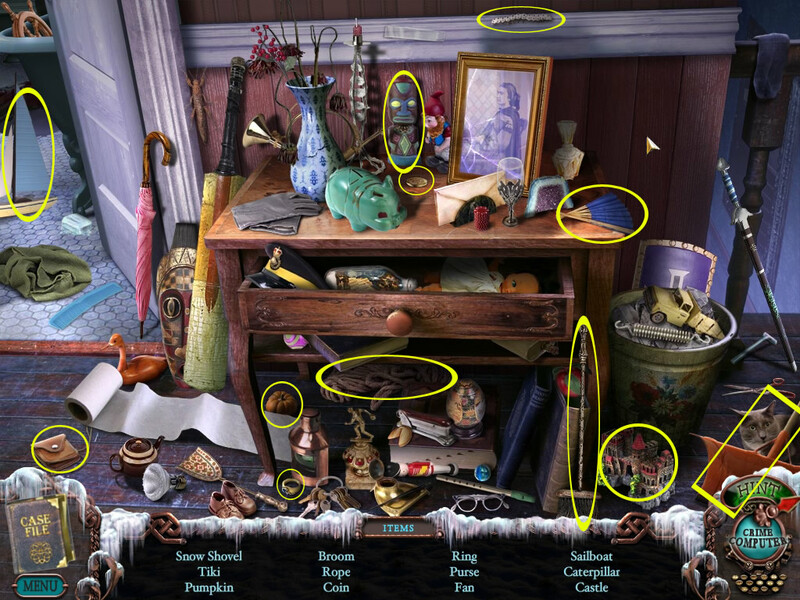 Upon entering a hidden object scene, you will be confronted with a list of items to find, one of which will end up in your inventory and be useful later. It can be surprising, sometimes, which objects end up in the inventory. Some items you will find a use for pretty quickly, and some you will be toting around for quite a while before you discover their purpose. 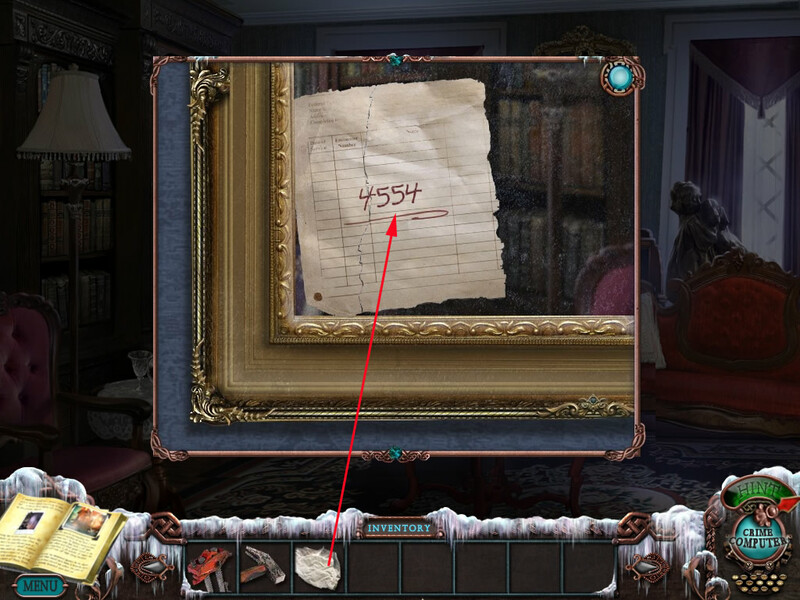 And, of course, there is always the handy Detective's Casebook, which jots down information as you come across it, remembering everything that you might not. 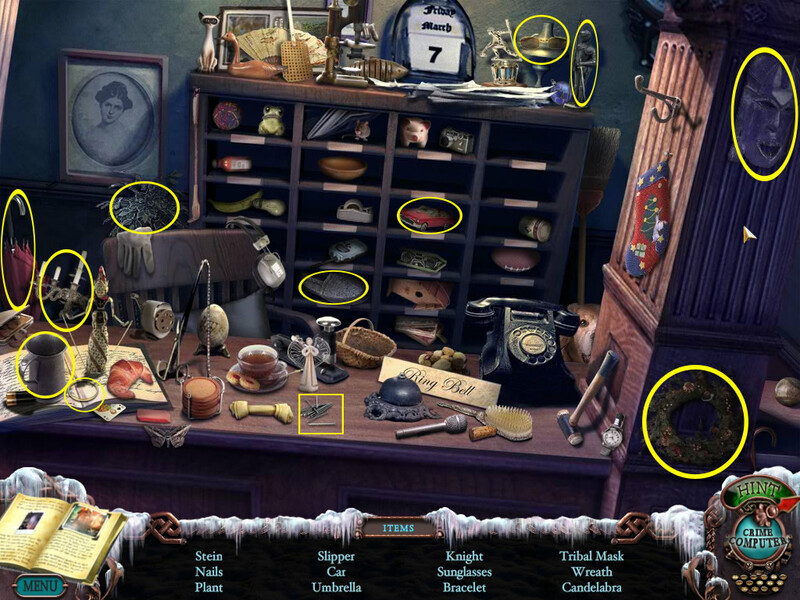 The hint system works with a refilling timer in your mystery crime computer. 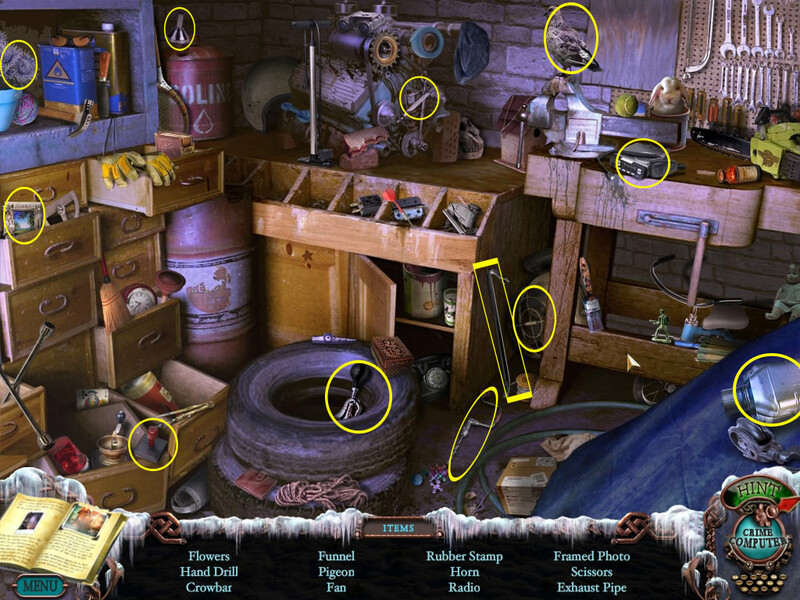 Use them to find hidden objects or to skip certain puzzles. 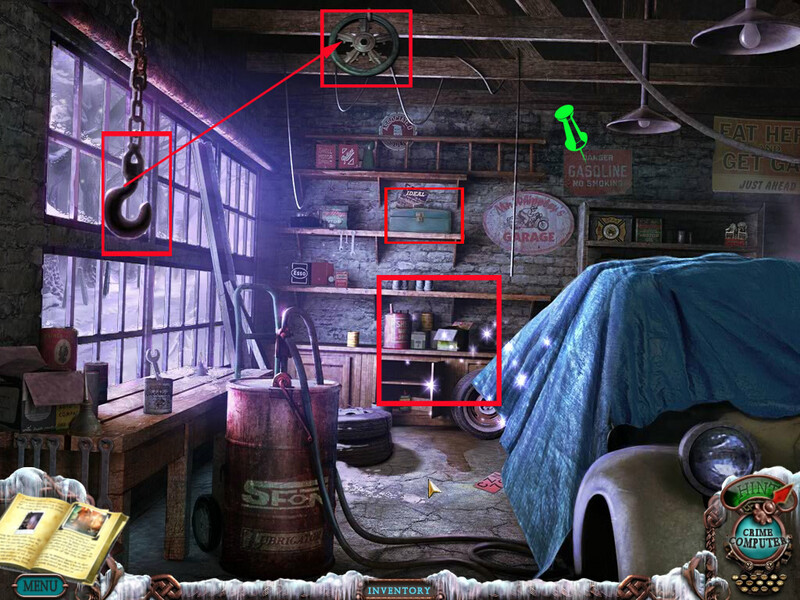 Some puzzles involving found objects or information cannot be skipped, so be warned. 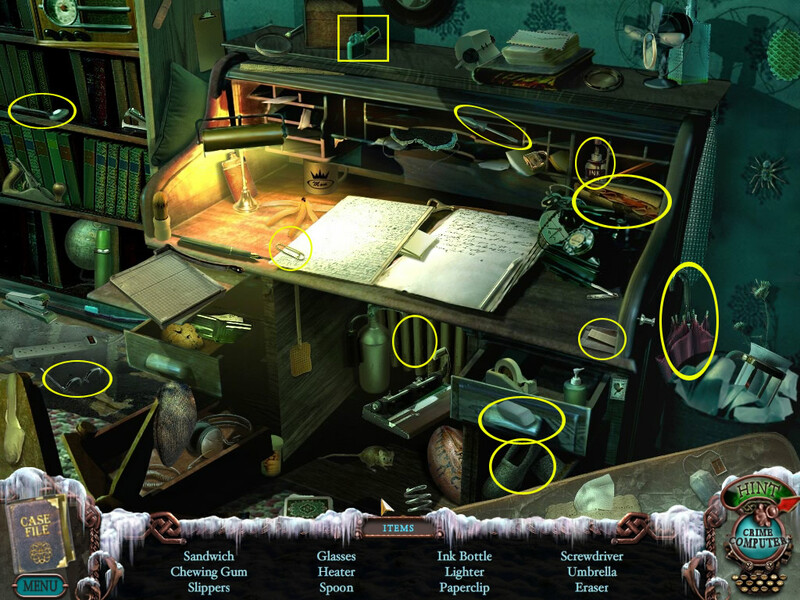 Analysis: Yes, after a long wait, the newest Mystery Case Files is finally here! How does it stack up against its predecessors? Well, let's start with the visuals. The developers have gone all out to make the look and feel of Dire Grove something to behold. The locations, the hidden object scenes, the puzzles, everything is flat-out gorgeous. Bright, vivid, and three dimensional, Dire Grove even manages to capture that eerie diffuse light you get during a snow storm. And boy, is it snowing. The video tapes, incidental sounds, and musical score that ranges from plaintive to creepy to dramatic, all heighten the immersive factor of the game. 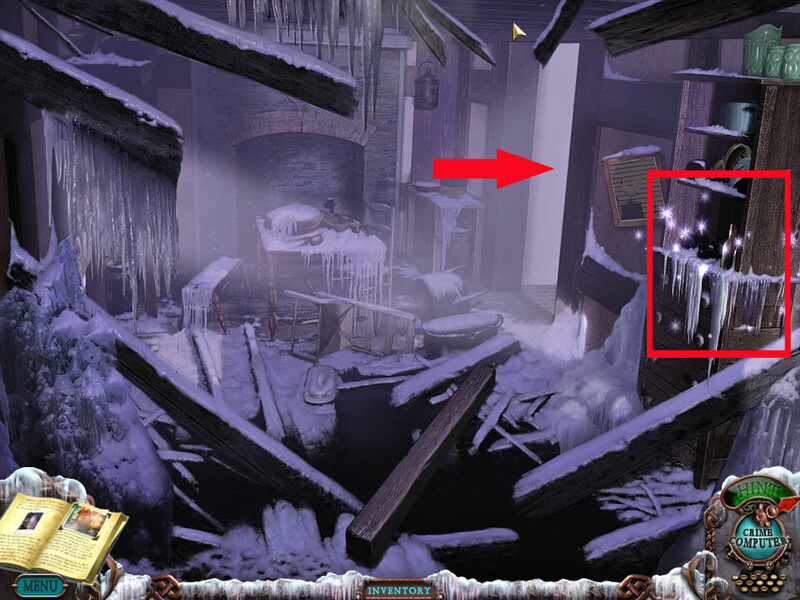 Play Mystery Case Files: Dire Grove for very long and you will begin to feel the cold creeping in. 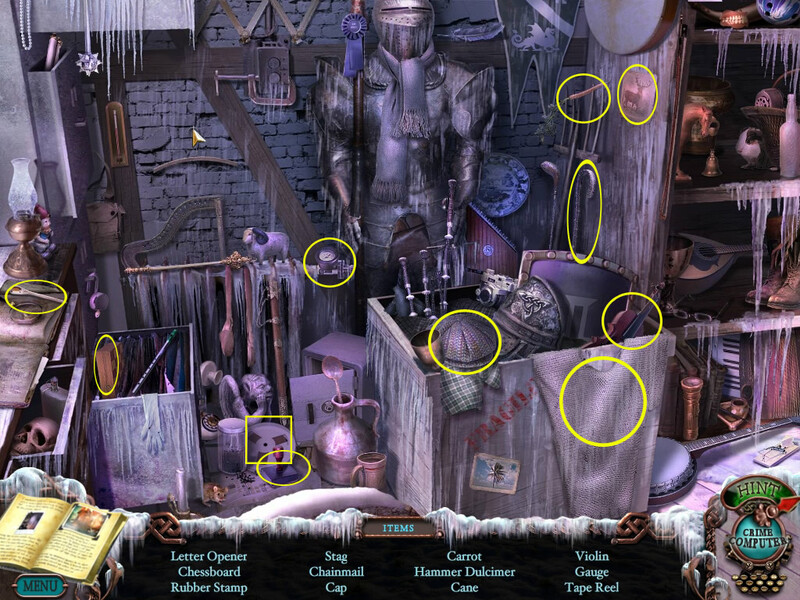 The hidden object scenes, like everything else, are sharp and clear, reducing the graininess and clutter of scenes from previous Mystery Case Files games. Those with older eyes will appreciate the clarity which will reduce eye-strain significantly. The story hangs together well, told in dribs and drabs by the video tapes, correspondence, journals, and other found items as you make your way in and around the town. Yes, it's all a bit Blair Witch Project, but compelling nonetheless. 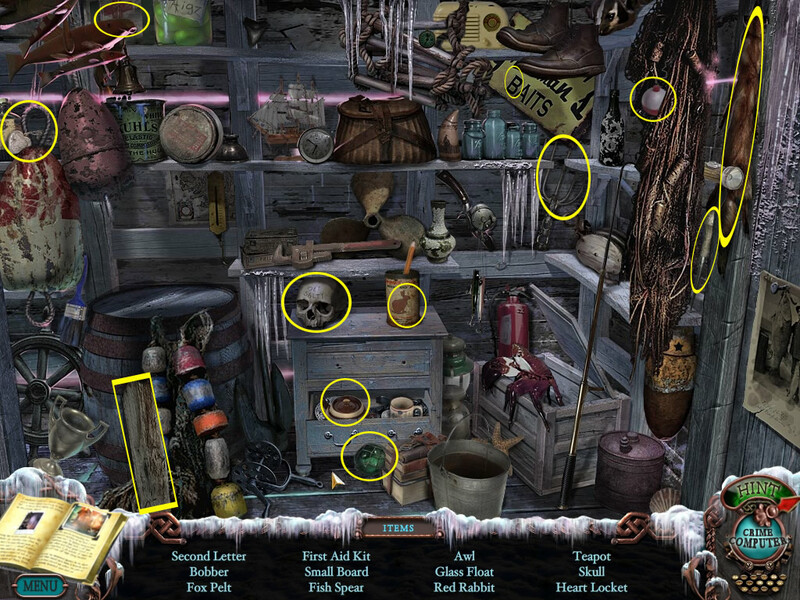 Although the story is original to the game, you can still find slight shout-outs and references to previous Mystery Case Files adventures, especially the return of the lovely mysterious, morphing objects from Mystery Case Files: Madame Fate. See if you can find all of them hidden in the scenery as sort of a bonus side quest. 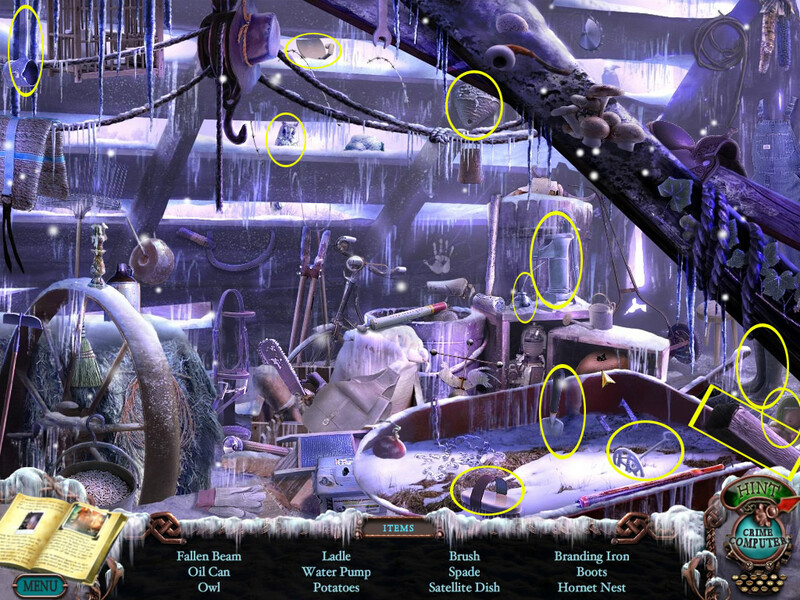 The puzzles... well, here's where Dire Grove perhaps fails to meet expectations. 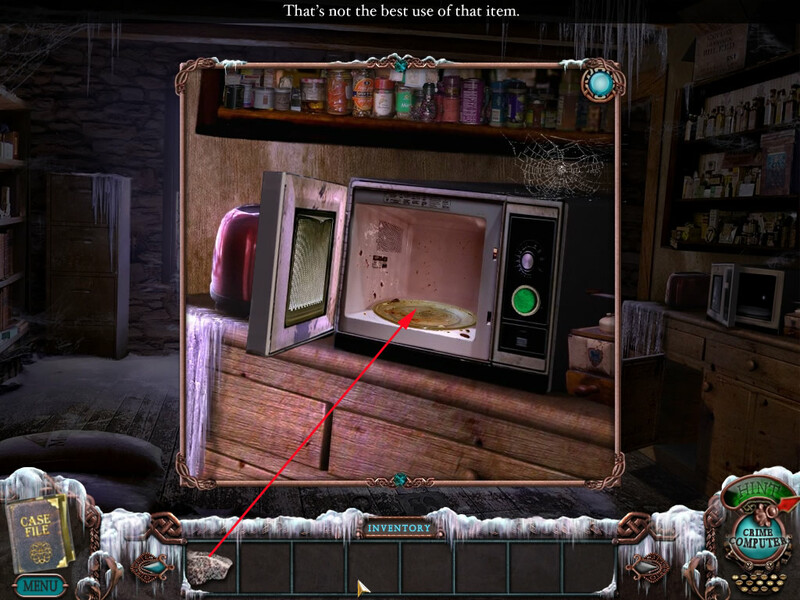 The Mystery Case Files series have long been known for their tricky, original, elaborate puzzles. Although there are some nice brain-teasers here, much of it is pretty familiar. 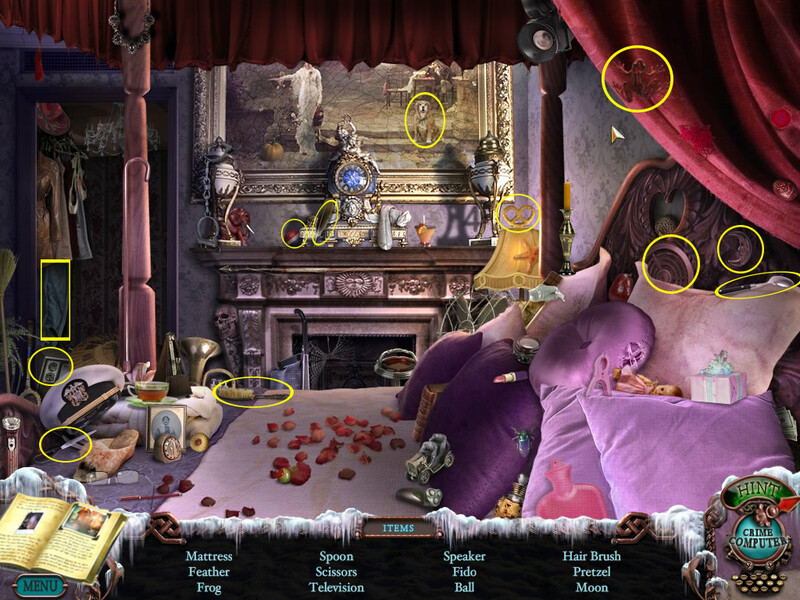 Perfectly enjoyable, mind you, but if you've played a lot of hidden object games, you won't encounter a lot of original puzzle designs. A small off note in what is otherwise an excellent game. 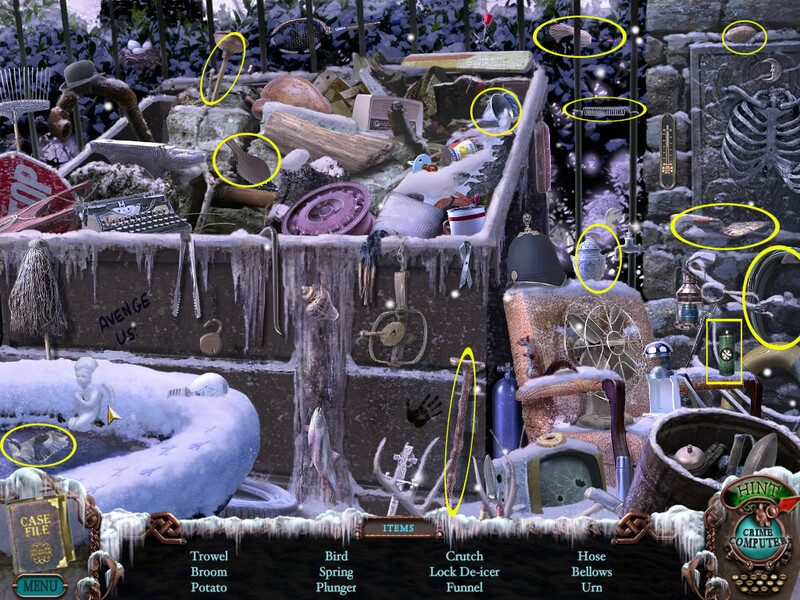 Although Dire Grove is perhaps not as long as Return to Ravenhearst, it still manages to buck the current trend of ever-shrinking gameplay time now seen in most adventure/hidden object hybrids. 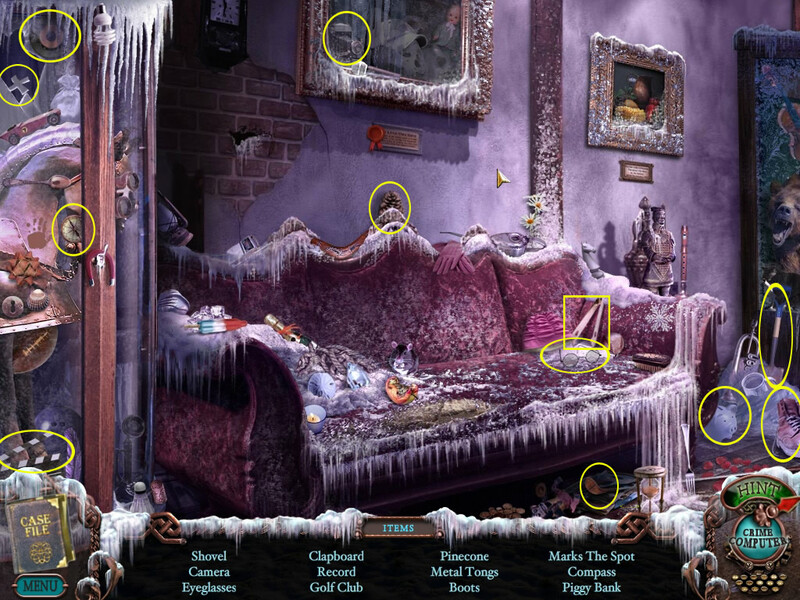 Between the exploration, the hidden object scenes, and the puzzles you are looking at hours of fantastic casual gameplay. Why are you still reading this? 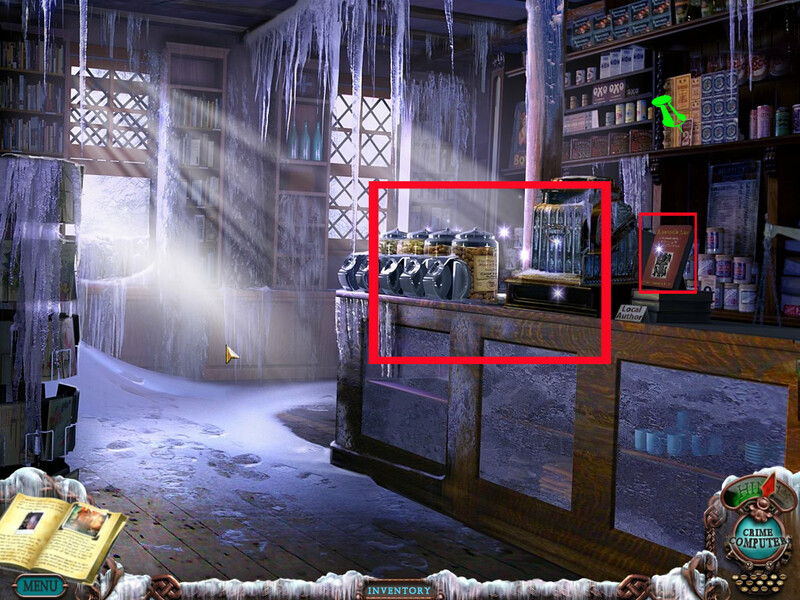 Go play Mystery Case Files: Dire Grove! A Collector's Edition is also available. 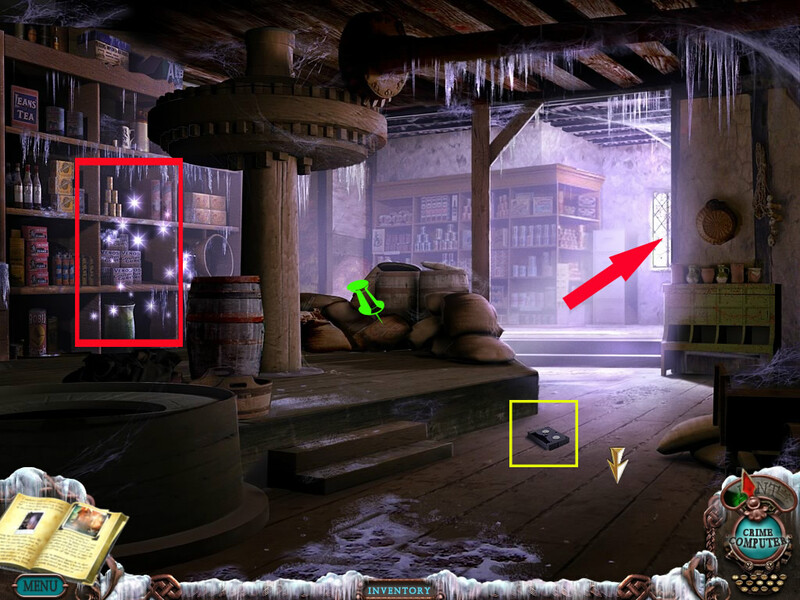 It contains bonus gameplay, more hidden objects to find throughout the game, strategy guide, and more. Remember that Big Fish Game Club Members pay only $13.99 for Collector's Editions (or 2 club credits), and collector's editions count 3 card punches of 6 total needed for a free game. 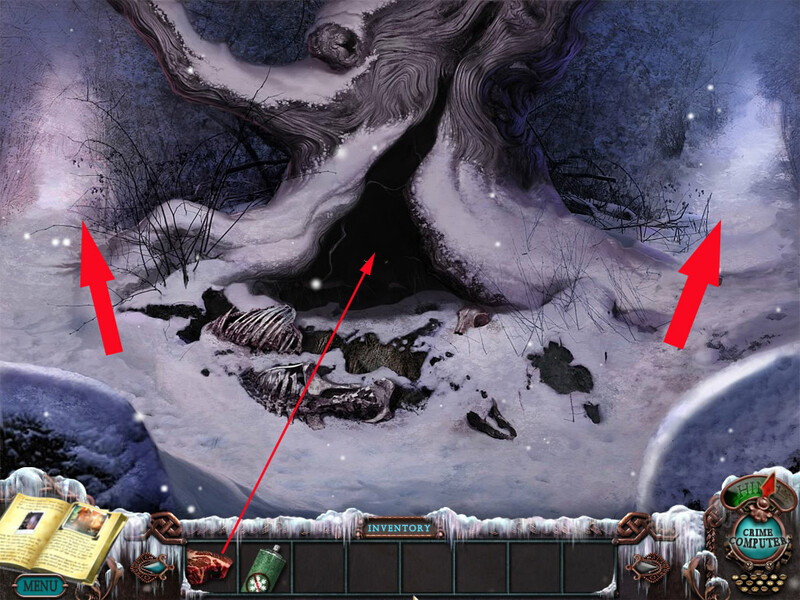 Mystery Case Files: Dire Grove Walkthrough now available! Hovering over a scene with the mouse will let yellow arrows appear in the directions you can go to. Ho-scenes are random - the objects from our lists are marked in the screen shots. Inventory objects are not random - they are of course also marked. An inventory item will only go into your inventory when you find all listed objects. Not everything you can look at or use will be needed for the story, but as you never know click everything that might be of any interest. 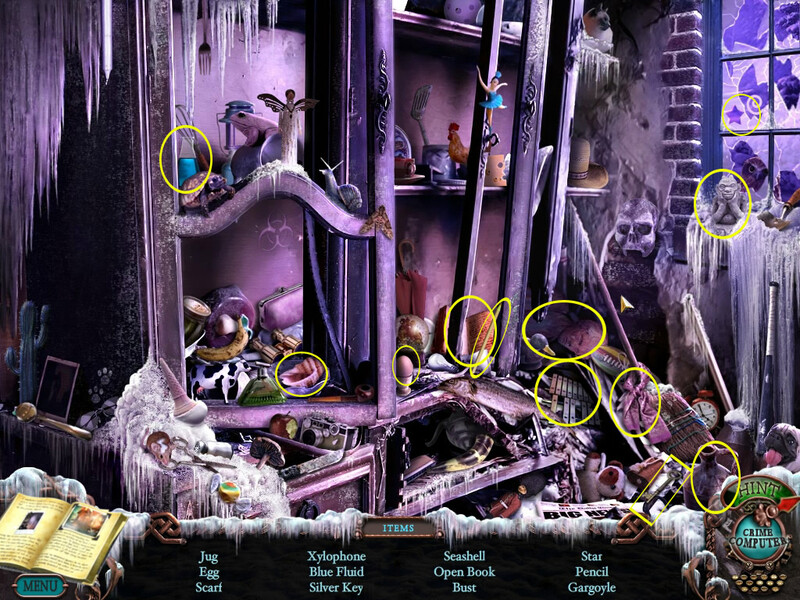 You will also have to find 50 morphing objects (Collectors Edition only) - objects that change for example color or a face goes from sad to happy or a sign changes what it says. You will also have to find 16 video tapes, you can watch by opening the crime computer - Watch them closely as some of them give you needed information. 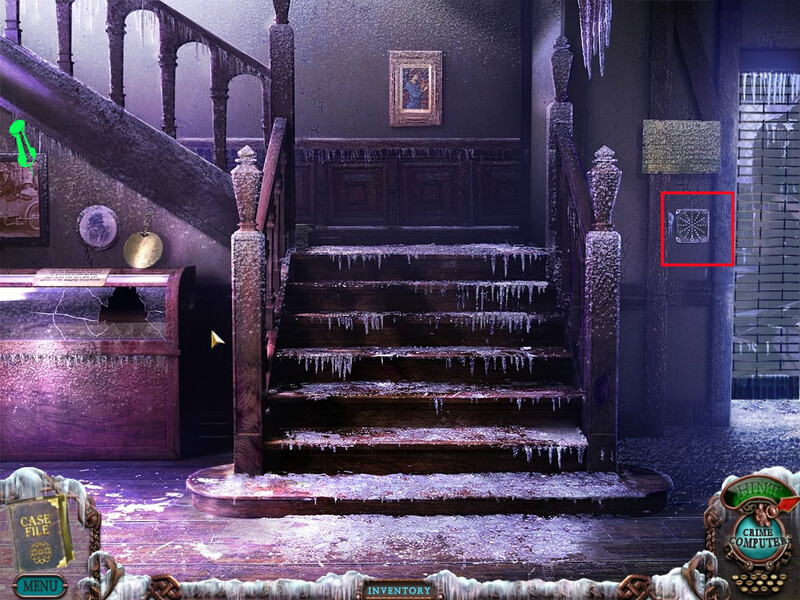 You will need to find them all, otherwise you won't be able to get access to the last puzzle. Frantic clicking in ho-scenes will make your cursor freeze for a moment. 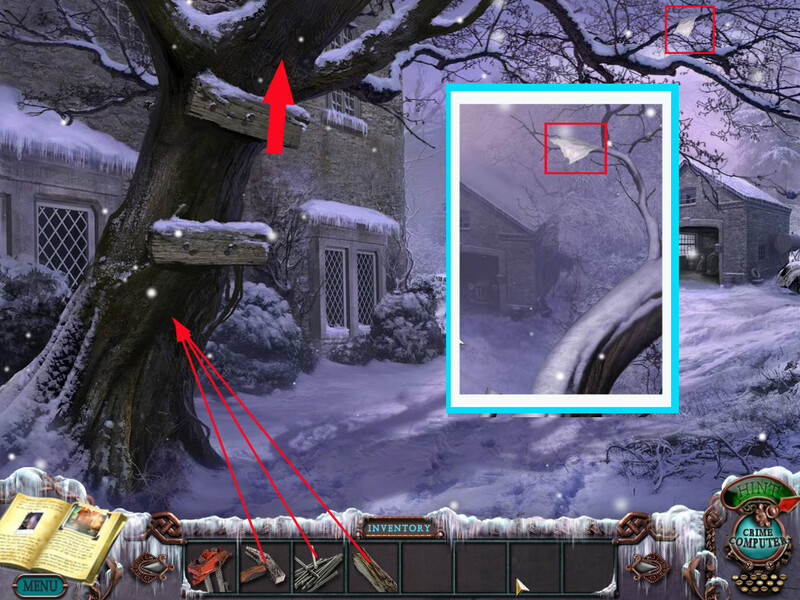 The hint needs time to reload, but will also reload outside the ho-scenes. 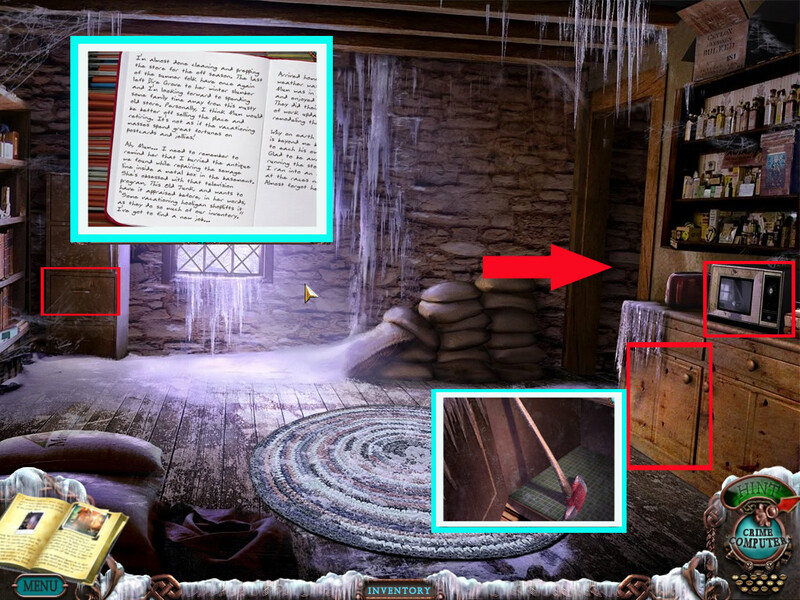 The journal in the left low corner will copy all information you find and may need during the game. You do not need to go the ways as the walkthrough does - just be aware that somethings described in the spoiler might not work if you you haven't done something else yet. A lot of puzzles are random - . Same for telephone numbers and codes. It is possible that you will have different solutions than I have. Go to the car and click the trunk - it's locked. Click the street sign right in front of the car. It is your first morphing object. 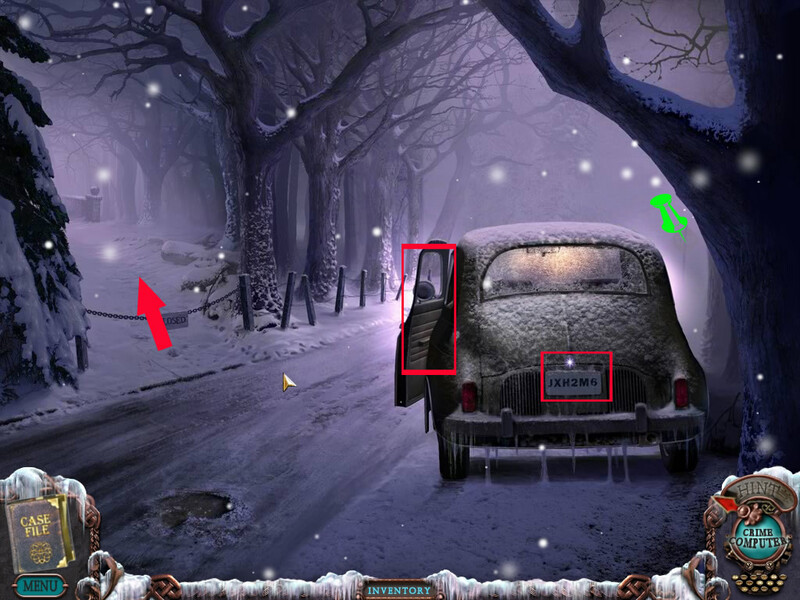 Click the door of the car to get inside. Get the note from the seat and read it. The note will be copied to your journal. Get the video camera from the other seat - a short video cut shows you, what happened. Click the top of the gearshift. The image belongs to the morphing objects. Click the glove compartment left side - you see four empty spots. See the engraved M6 at the end. You have seen this before. Right, the license place, it ended in M6. So click the black buttons below the spots till you have JXH2 M6. Click the silver button above the letters and the compartments opens. Get the key out and leave the car. 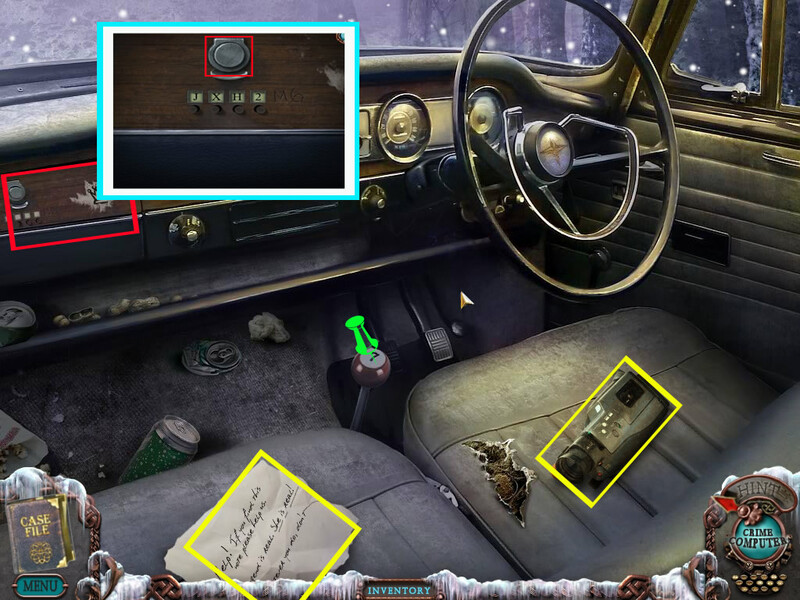 Click the trunk to get a nearby view and open it with the key. The car jack goes into your Inventory. On the way have a look at the sneaker and the fire wood. At the left side you can see a video tape in the snow. You can have a look at it at the crime computer, if you want. Your possibilities here are: back to the car, to the right, to the left or further on to the hotel. Have a look at the id card left in front of the stairs. 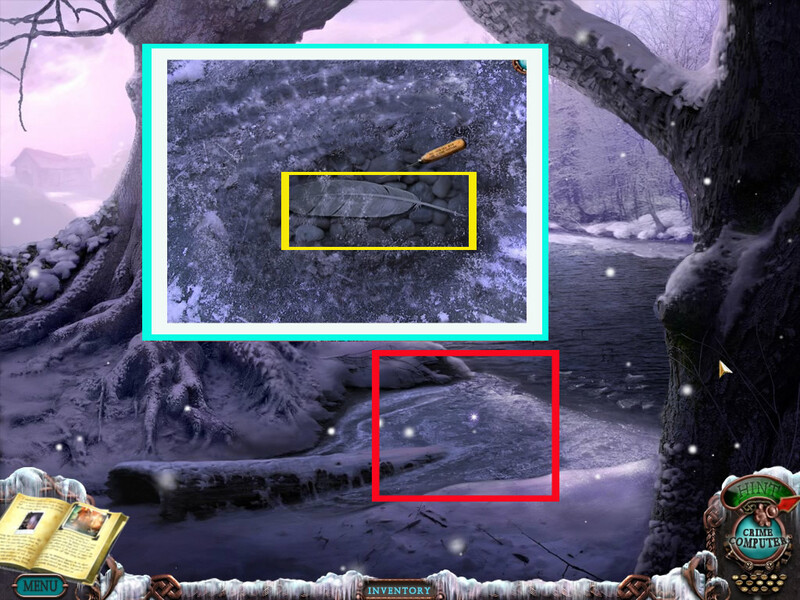 The stone face right side belongs to your morphing objects. 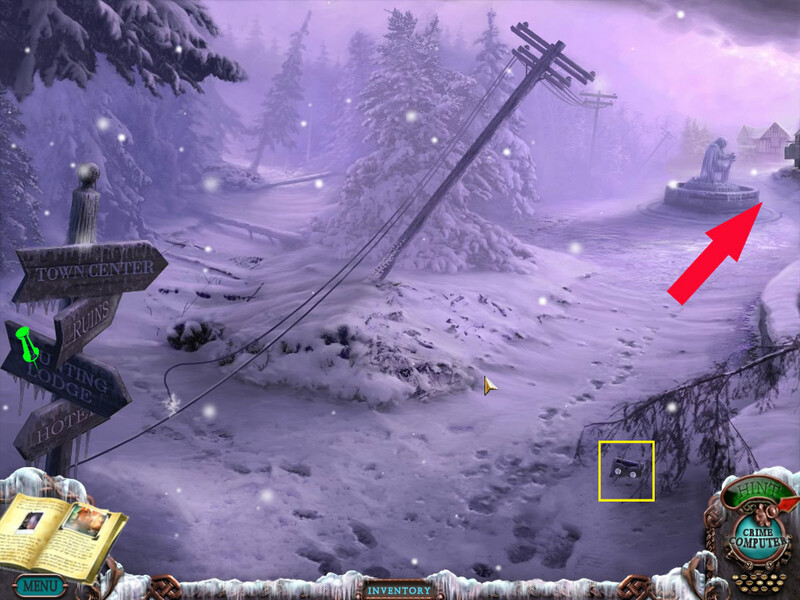 You can also look at the Dire Grove sign on the top and the thermometer at the right. The reception is a ho-scene - the room key goes into your inventory. The sign above "VACANCIES" right at the reception is a morphing object. Click the guest book left side of the reception counter. Most of the entries are as usual, but you also see a note saying the same as the one in the car. The clock above the reception is running backwards. The brochure stand left side let's look you at the first two brochures more closely. Click the right low corner to turn the front page. The manager office is locked. You can leave the house here, or left to the reception to the left or the right. The walkthrough goes left first. The backpack left is a ho-scene - the hammer will go into your inventory. 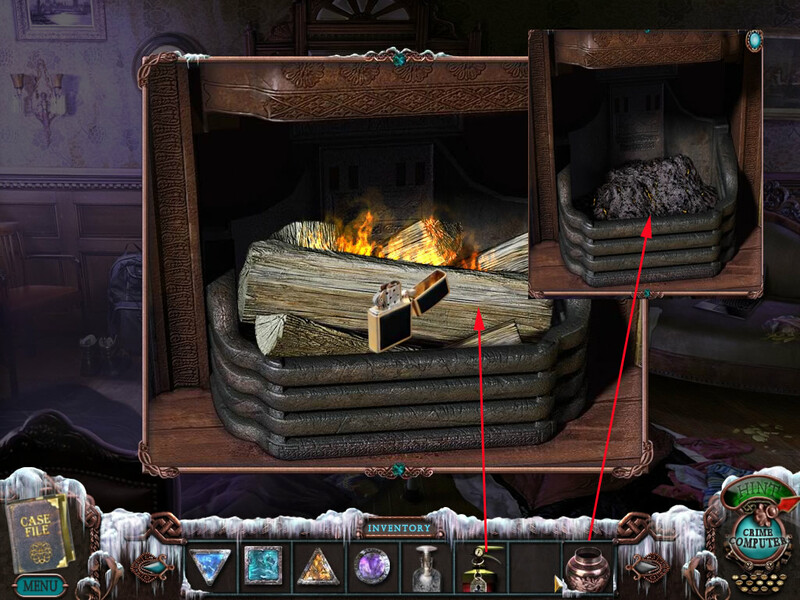 The picture left next to the fire place is a morphing object. Click the fireplace to learn that there is no air to feel. Click the sleeping bags on the floor and the sock on the couch right side. Click the laptop, its running low on batteries and shows strange symbols. Click the note on the floor, its an article about a found Celtic relic and has handwritten notes. It will be copied to your journal. It is also the lobby but the right side of the room - you can reach this part also from the reception going right. This is the same room as the one you can enter from the reception going right, just the other side of it. Going left will bring you to the left side of the lobby. The book right side on the chair goes about Celtic mysteries. On the table left next to it, the third picture from the left is a morphing object. On the stairs you will find a note with tasks for the winter season and information how to get water, energy and a door opener. To the left there is a bathroom to the right a hallway. 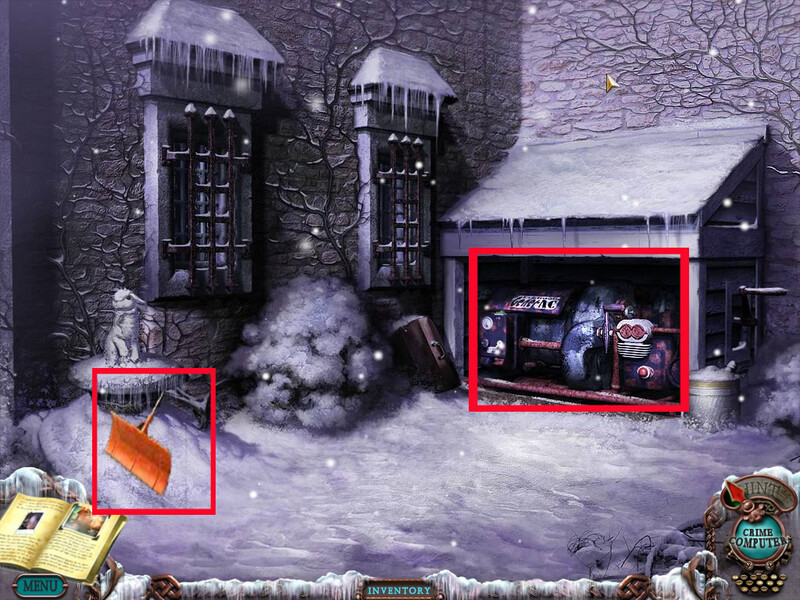 The table in front of you contains a ho-scene, the snow shovel is your inventory object. On the floor left a tablet is standing - the glass on it is a morphing object. 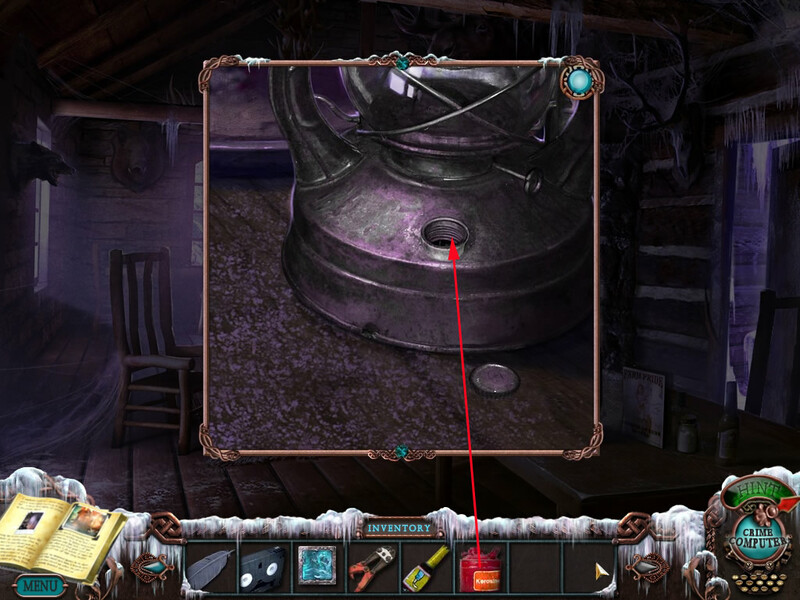 The jar on the lower shelf right side is also a morphing object. Get the video tape, right side on the floor. The door to your right is locked. Straight ahead you come to the back part of the hallway. Enter the room to your left. The lamp at the wall left side of the bed is a morphing object. The laying books on the lower shelf left to the bed is a morphing object. Click the oars above the bed - they are tightly knotted. For using the outlet, you will first need to get the power back. 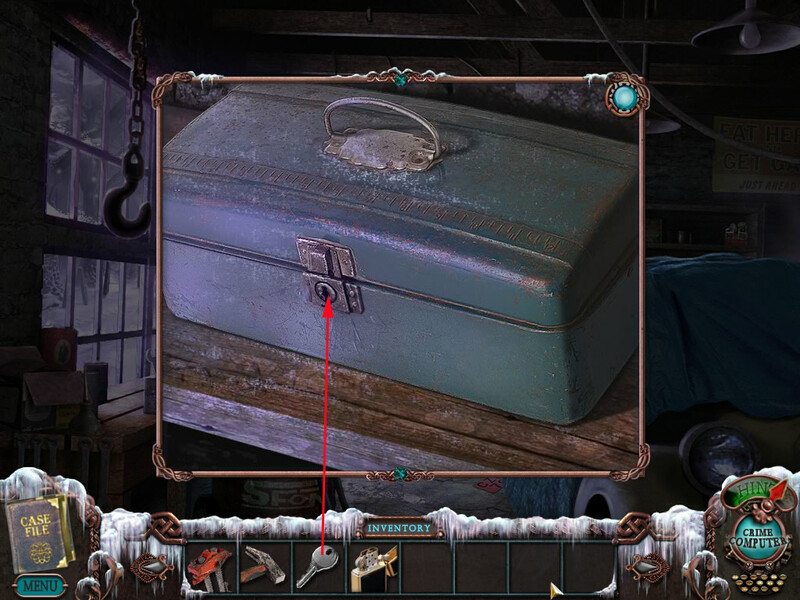 Click the trunk in front of the bed and a puzzle opens. You will need to arrange the hands so that all lights are on. No hand should lay on another one. You can turn the hands by clicking them. I numbered the hands from low left to low right from 1 to 7. The head on the painting right side is a morphing object. Go back and in the back part of the hallway. The vase on the table in front of you is a morphing object. The first picture on the left side is a morphing object. Enter the library to your left. The pattern on the right couch pillow is a morphing object. 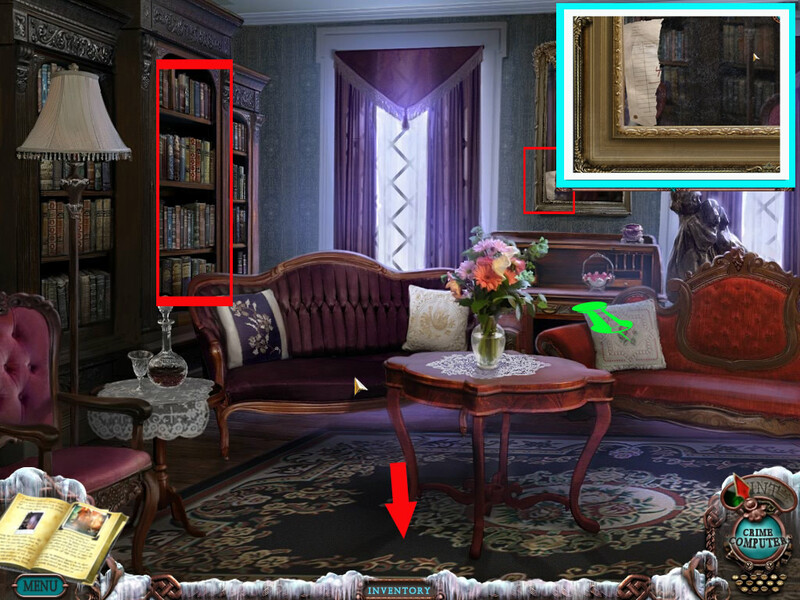 Click the mirror - a paper scrap is stuck in the frame. Click the bookshelf left side - two of the books art interesting and you can read in them. Top shelf Celtic History of Medieval Britain and upper shelf Folklore: Fact & Fiction. Go down to the reception, there appears another ho-scene. The nails are going into your inventory. Leave the house and go to the right and then to the left. When you stand outside you need to go right. Again right would bring you to the garage, left you will come to the generator. Click the generator - you will learn that a spark plug is needed. Get the snow shovel out of your inventory and remove the snow at the bottom of the statue. You will have to click a view times, than you can pick up a garage opener. Click the thing, standing on the laying tire right next to the garage - its a morphing object. 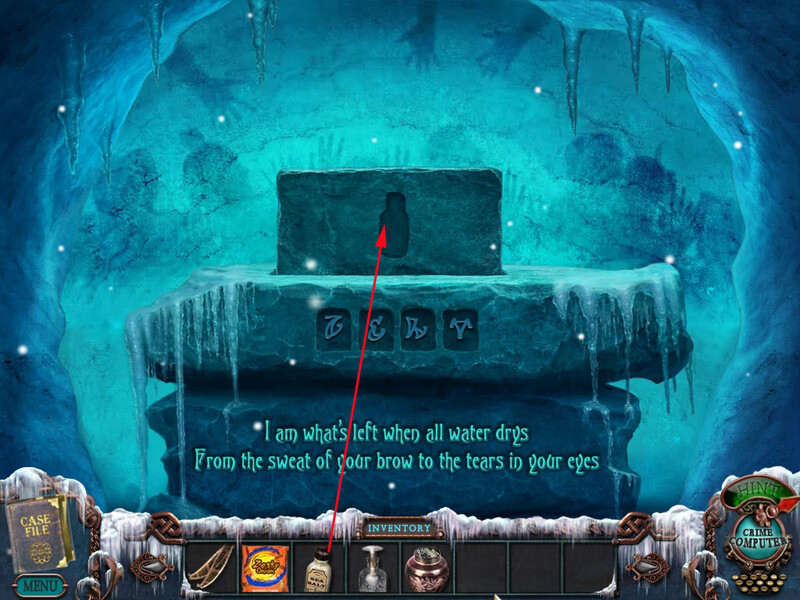 Left side you see a circle lid under the snow - click it to learn that you can't move it and there is not the right tool in your inventory yet either. Open the garage door with the garage opener from your inventory and enter. There is a ho-scene - find all items. The sledgehammer will go into your inventory. 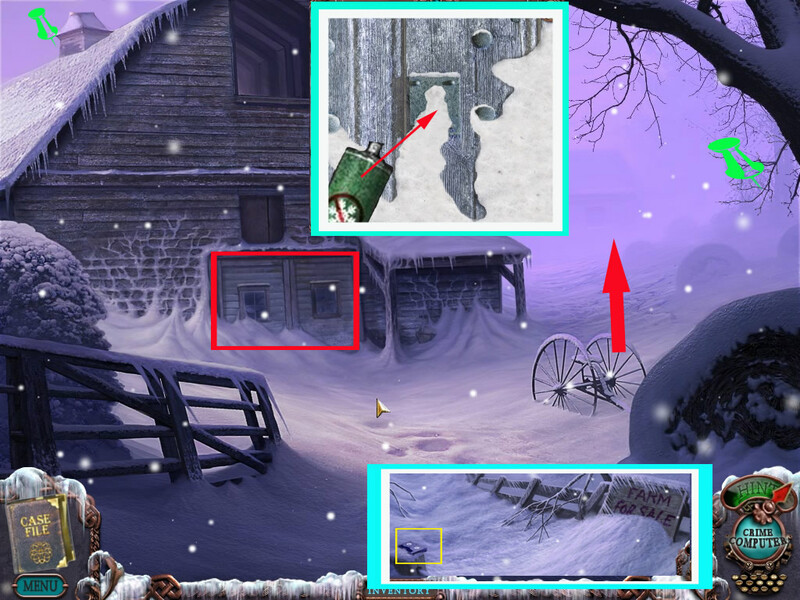 Click the hook at the chain upper left till the wheel at the wall above the ladder falls on the ground - pick it up. The red sign right next to the ladder - the word "Kerosene/Gasoline" is a morphing object. The green box on the shelf needs a key. Go back to the hotel and into the bathroom. The soap right side at the tub is a morphing object. Use the sledgehammer from your inventory and smash the ground, till you can see the managers office below. Unfortunately you also hit the water pipe. 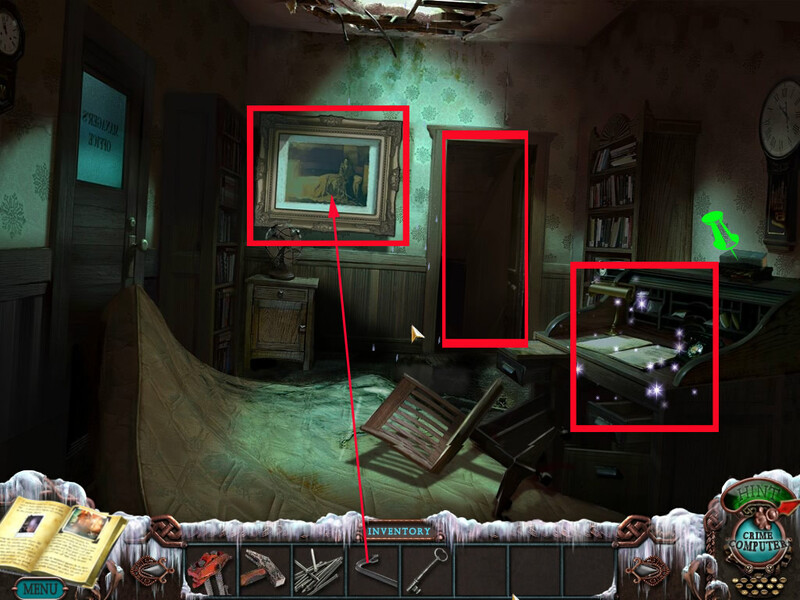 Find the objects, the crowbar will go into your inventory. 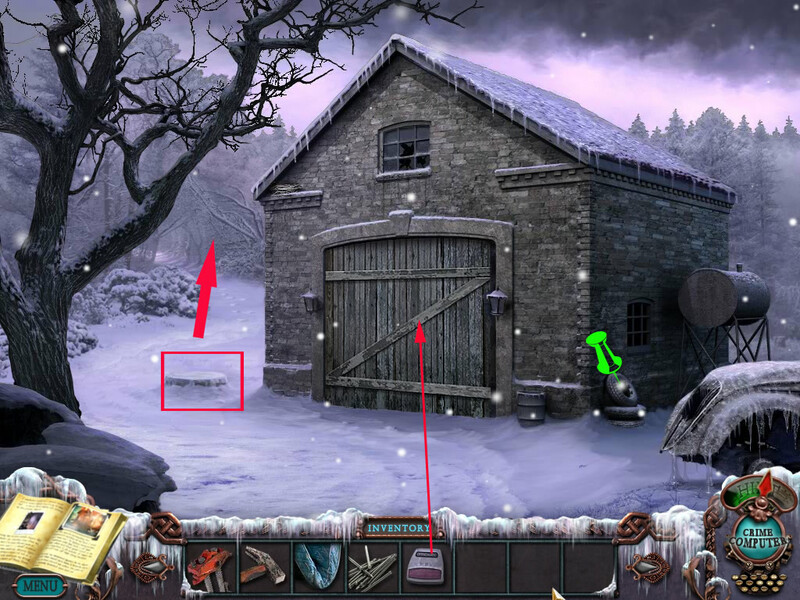 Leave the garage and click the cover right side in the snow. Use the crowbar and click it a few times in the middle of the cover to move it. Get the wheel out of your inventory and place it right at the main out. Click a few time to shut the water off. The water stopped - get the mattress out of your inventory and place it on the hole. You will have to click a few times, till it falls down. Click again to jump down. Click the ho-scene and find all listed items - the iron key goes into your inventory. The books on the desk are morphing. Click the painting at the wall, you need to pry it. Use the crowbar from your inventory. You need a code for it, but you do not have on yet. Go to the garage and there top right. On your way, you will find an video tape. Go further - the symbol above the door is a morphing object. Click the door and open the lock with the iron key. Play the ho-scene - the small board will go into your inventory. Go back to the hotel, but stop at the tree right after the garage. Look up and see a paper scrap at one of the branches. There are already two steps nailed at the tree, but this is not enough. Place first your small board at under the other ones, then the nails onto it and use the hammer. Now you can climb up - click the paper to learn that you still can't reach it. Climb down, go into the hotel and up into the bedroom front hallway left side. Play the ho-scene, the handsaw will go into your inventory. Go back to the tree. Climb up again and use the saw at the middle of the branch. You will need to click three times till the branch will fall down. Climb down and garb the paper. Click the mirror with the piece of paper. Place your paper next to it and you will see four numbers. The numbers are random, I had 4554, 5774, 6335, you might have a complete different one. Go down to the manager's office. 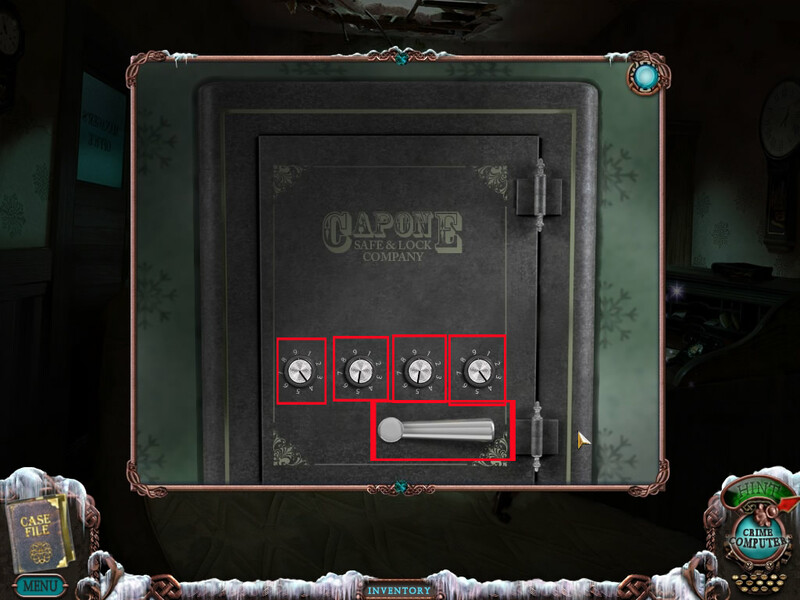 Click the safe and change the knobs according to the numbers you found at the mirror note - it is also copied in your journal. Click the handle below and the safe opens. Play the ho-scene, the small little key will go into your inventory. Leave the office and go to the garage. Click the green box on the shelf and open it with the small key. Go to the bedroom right side, hallway front. 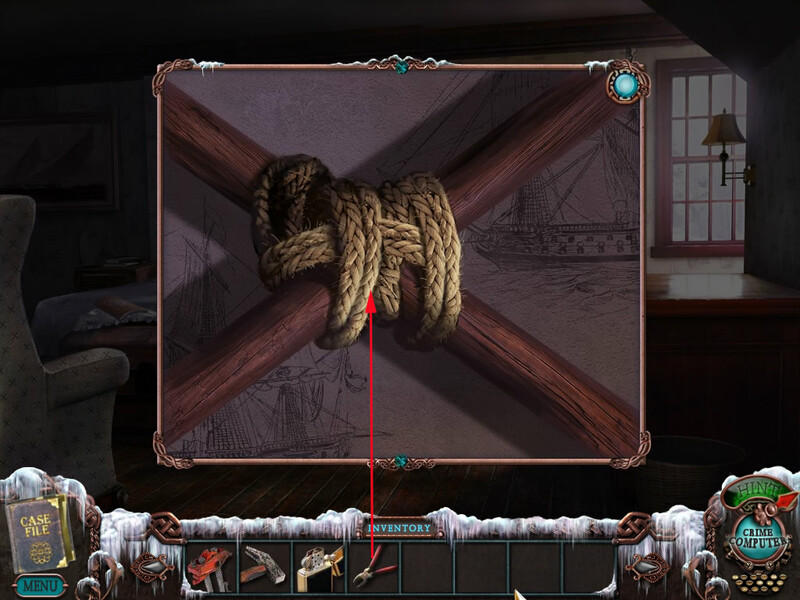 Click the oars at the wall and use the pliers to remove the rope. The oars will go into your inventory automatically. Play the ho-scene - the urn will go into your inventory. 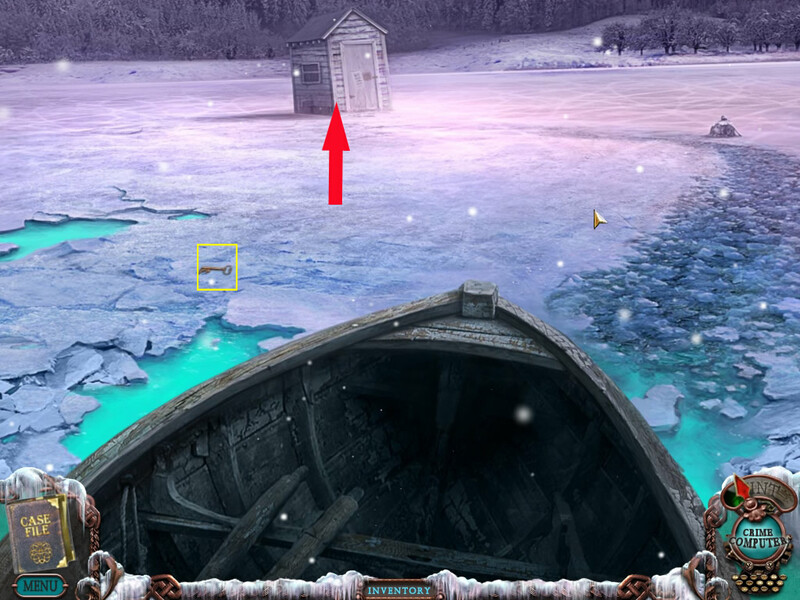 Place the oars from your inventory on the boat and click the boat to enter. 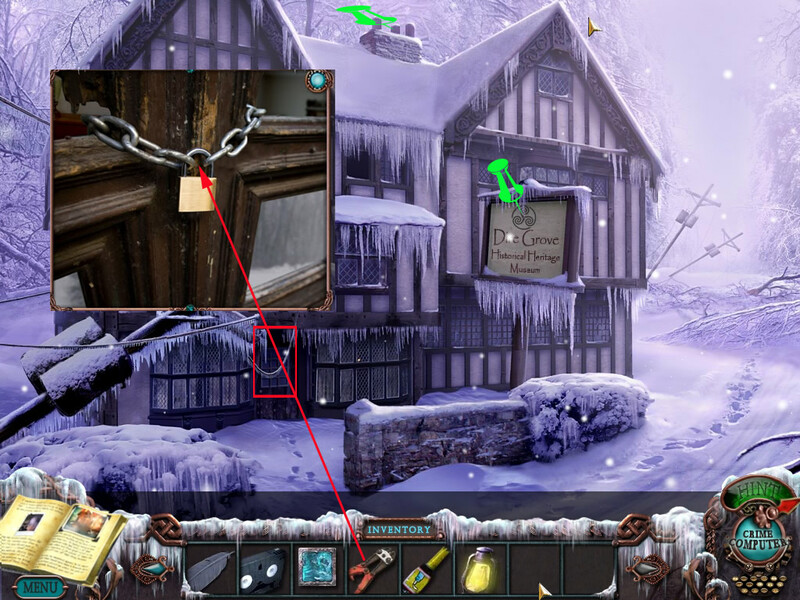 Grab the hotel room key on the ice left side and click the shanty to reach it. Congratulations, you found your first student. Click the big amulet the student is holding. Your goal is it, to reassemble the picture by clicking the circles to move them to their proper positions. You can move a circle only onto a free spot along the shown line. The starting positions of the puzzle is random, so that I can only provide the solution. Grab the turquoise shape, that appears, it goes into your inventory. Go back to the hotel and there upstairs to the back hallway. Use the hotel room key to open the door and enter. Pick up the video tape on the floor and read the note, laying on the floor behind the tape. The pattern of the right pillow is an morphing object. Click the suitcase to learn that you need a combination code for it. Watch and listen to this video as it provides needed informations about the code for the suitcase. Leave the room and go downstairs to the left part of the lobby. The backpack contains another ho-scene. The telephone charger will go into your inventory. Go upstairs, right bedroom, hallway front. Click the outlet at the wall right next to the bed and drag the telephone charger to it. Nothing happens as we do not have power yet. Go back to the bedroom right, hallway back and click the window to come into the backyard. Click the trash container to play the ho-scene. The rope will go into your inventory. Use the arrow at the window, to go back and leave the hotel. When you face the hotel go to the top left. The sign above the bridge is a morphing object. Click the bridge to enter. Above you there is a beam with a kind of metal band. Click your rope there - you have now a way over the abyss. To the right sparking cables are laying - you can't go there. Pick up the video tape right side of the way. Click the Word "Lodge" at the wooden sign, it is a morphing object. Go straight ahead and click the grocery one time to come more near. Click the symbol on the grocery sign - it is a morphing object. Click the vendor right side, but you need coins for it. Enter the grocery through the broken window. Pick up the video tape. Click the sack with the red print, it is a morphing object. The ice pick will go into your inventory. Use the way left to the back room. Click the counter door left and get the axe out. It goes into your inventory. Click the lower drawer of the file cabinet to find a diary. Read it then go to right in the basement. 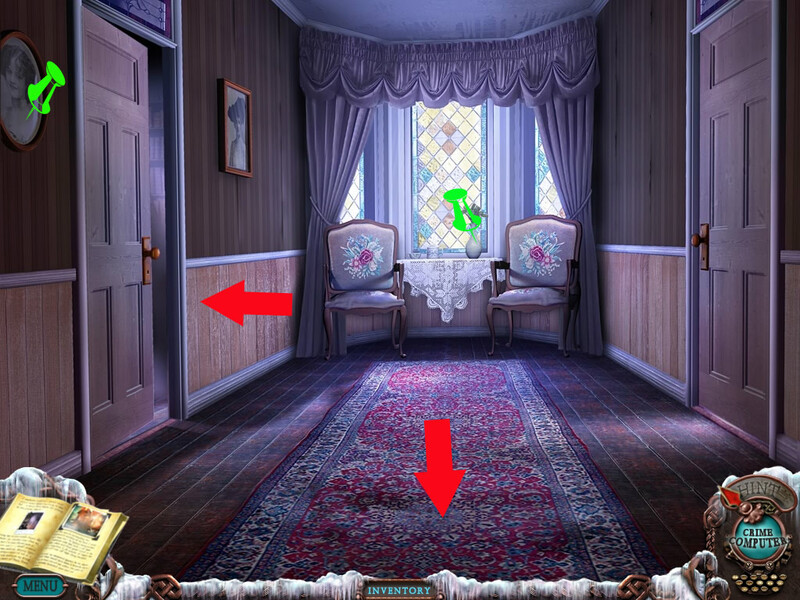 In this room you can also click the carpet and it will move beside, revealing a trapdoor - this door is part of the Extra-Content, which is not included in this walkthrough. Get the car jack out of your inventory and place it at the grate left to the freezer. 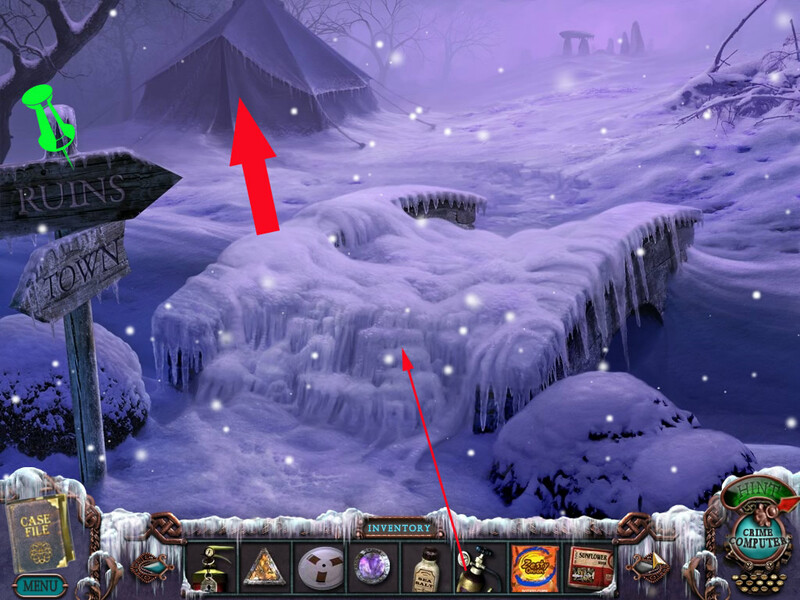 Click it a few times and the grate will let you get the snowshoes - they go into your inventory. 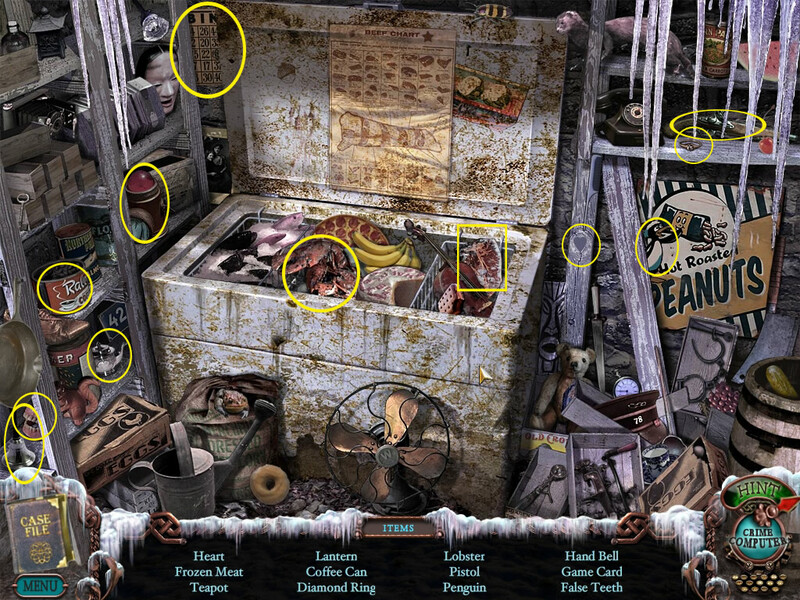 The jar on the second shelf from top left side is an morphing object. Play the ho-scene. The frozen meat will go into your inventory. Click the micro wave and click again the door, when you have the nearby view. Place the frozen meat into it, close the door and press the green button. Wait till the micro wave stops flashing, open the door and get the defrosted meat. It will go into your inventory. Leave the grocery and go back to the hotel, into the backyard. The trash container is again a ho-scene. The lock defrost will go into your inventory. Right side a coin is laying, but you can't reach it yet. 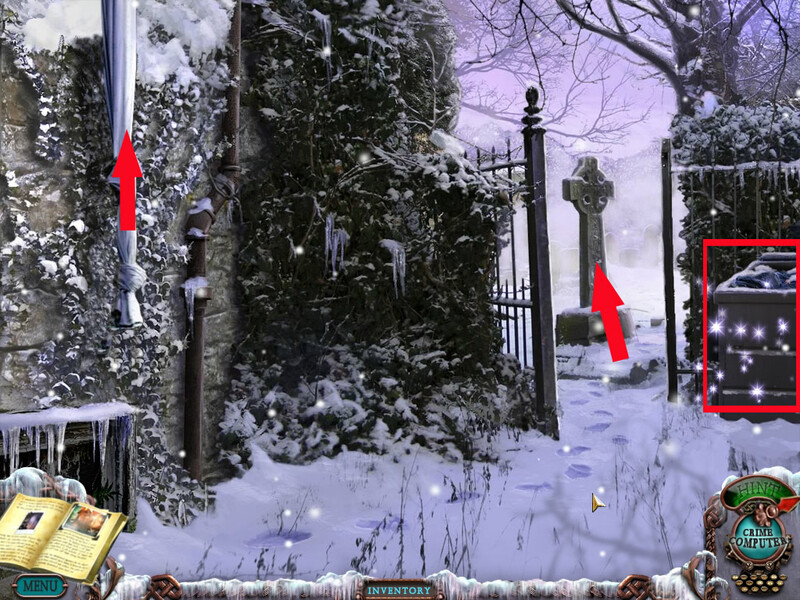 The F or H on the left grave stone is a morphing object. Place the meat in front of the beast and you can move on. Click the ice on the ground. There is a feather underneath. 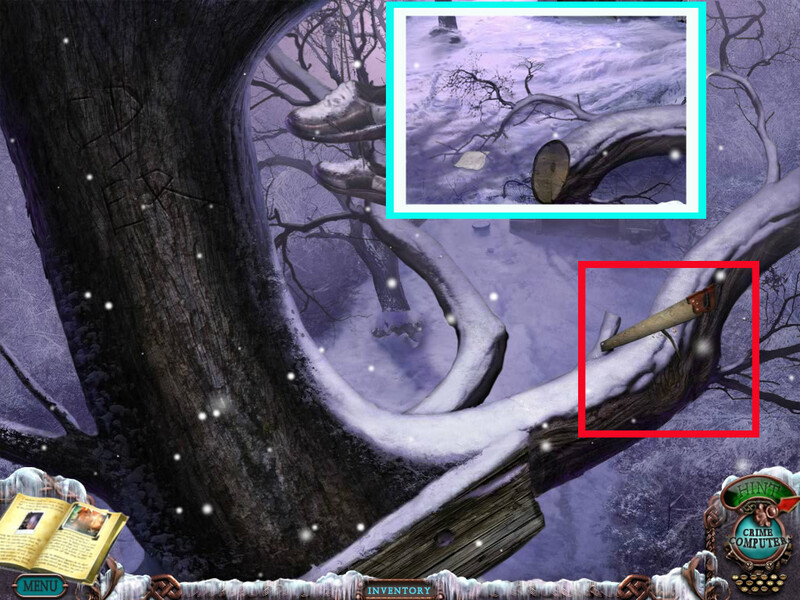 Get the icepick out of your inventory and use it to get the feather. Go back at right at the crossing. Pick up the video in front of the logde and enter. The deer had left above the fire place is a morphing object. Click the oil lamp on the table, it will need oil. Play the ho-scene - the bolt cutter will go into your inventory. 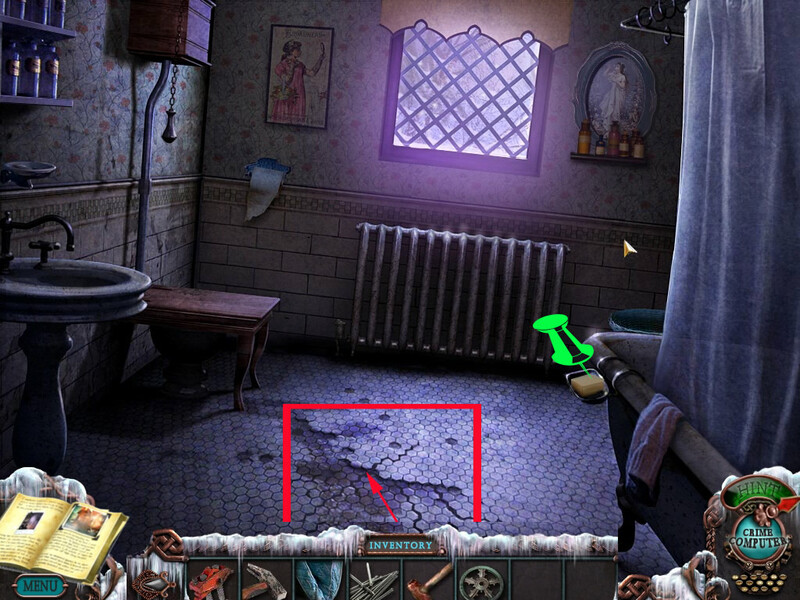 Click right from the table and remove the ice on the door knob with the ice pick. Congratulation, you found the 2nd student. 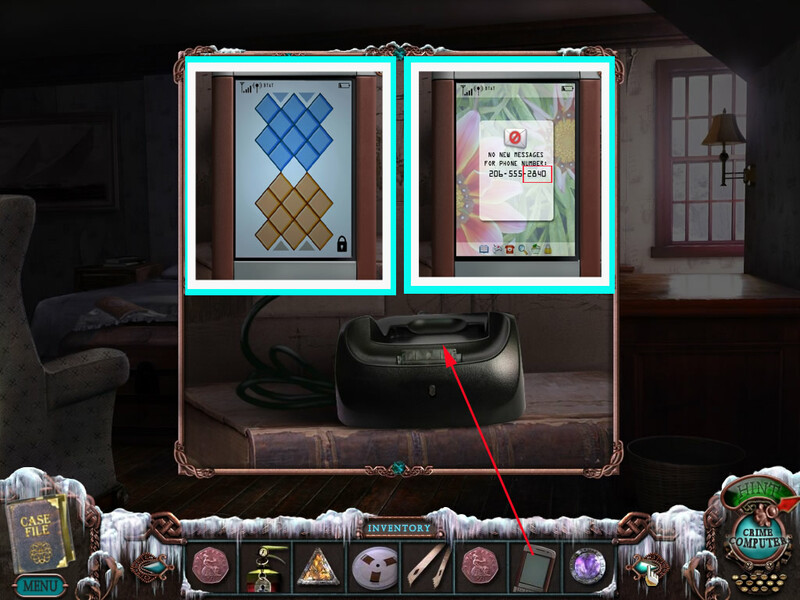 Click the amulet in her hand - a puzzle opens. You will need to place the big circles in the same order as seen on the outside of the two inside circles. Clicking a big circle first and then a free slot next to it, will make it move to this slot. To move the big circles around, click the inner circle. The slots at the figurines you can use to park circles. The start positions are random again, so I can only provide the solution. Leave the hut and go back to the grocery. The shelf contains a new ho-scene - a kerosene can goes into your inventory. Go down to the basement - this ho-scene will give a super glue. Return to the hunting lodge. Click the oil lamp on the table right side and place the kerosene at the opening. Go back to the grocery and there top left to the museum. The symbol on the museum sign is a morphing object. The middle chimney on the roof is also an morphing object. Click the door and open the lock with the bolt cutter. Right side on the piano, you can pick up a video tape. The bust in the far left top is a morphing object. Far left you see sparkles, when you click, you might see an exhibition, but its not working properly. But there is a fire extinguisher - use the hammer from your inventory to smash the glass and get the fire extinguisher out. To the down left, you reach the gift shop, go there. You can click the book and read a bit more about the Dire Grove legend. Above the book, the number sign is a morphing object. Play the ho-scene - a coin will go into your inventory. Leave the gift shop and go in direction of the stairs. Left to the stairs, the painting most left is a morphing object. Right side you see something sparkling. Click it, it is a puzzle. You need to press the letters from A - Z in the right order, but the next to press letter has to be connected with a green line. You will start by pressing the letter A first. This puzzle is NOT random, so that the solution should be helpful for everyone. A door right side opens - enter. Congratulation, you found your third student. Pick up the video tape on the floor. 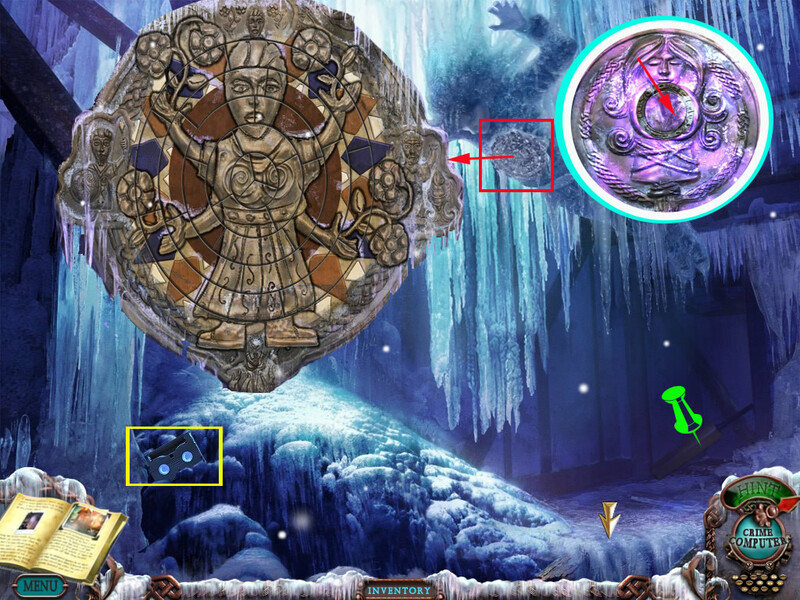 Then click the student and the amulet he is holding. 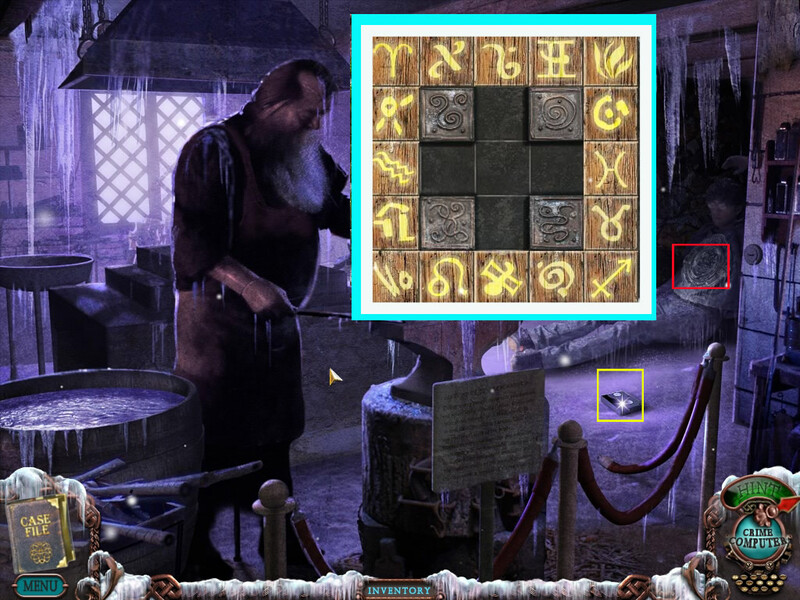 It is a slider puzzle - underneath the symbol tiles you will also see symbols. Slide the tiles, till everyone is laying on it right place. A tile on its right place will be shown in red. The solution is NOT random. Leave the room and back to the crossing with the sparking cables. The ho-scene will give you an ice scraper for your inventory. You can read the letter on the table. The lamp on the desk is a morphing object. Play the ho-scene to get a tape reel. 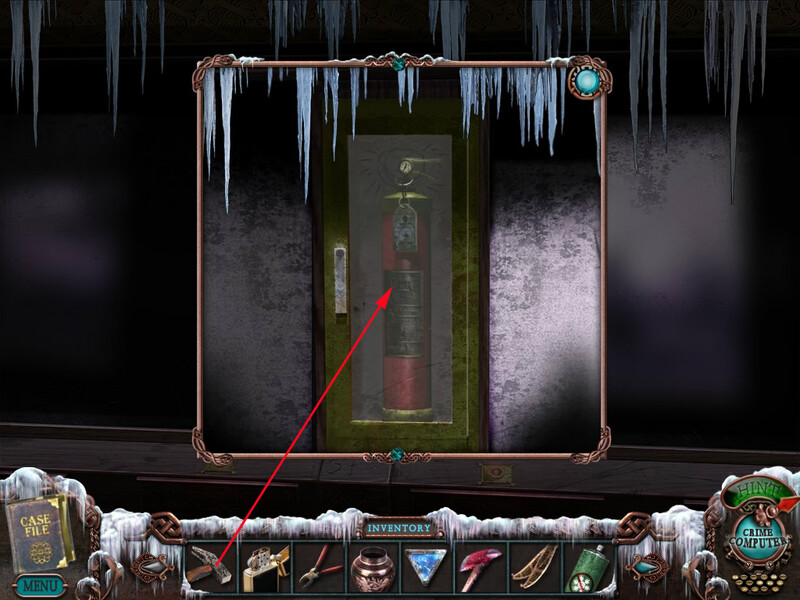 Click the fuse case and then the lever right next to it. Your goal is it to connect the fuses, so that all cables are connected with the right color. If you do it well, the power meter top right will go to zero. To swap fuses click the two you want to change places. 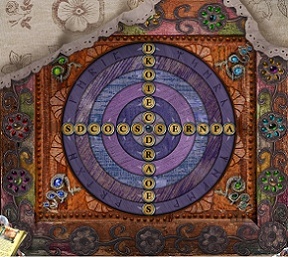 As far as I can tell, this puzzle is NOT random, so that the screen shot shows the solution for everyone. Go inside, leave the office and play the second ho-scene at the showcase. The metal tongs will go into your inventory. Leave the museum and go to the crossing. The cables are no longer sparkling, so go left. On your way pick up the video tape to your left. The chimney on top of the barn is a morphing object. One of the tree branches right side is a morphing object. Click the barn door and use the lock defrost. You will need a key so go right next to barn. The chimney is a morphing object. Click the lawn mower - there is a plug, but you can't use it yet. Play the ho-scene right sight. The silver key will go into your inventory. Open the barn with the silver key. The left beam is a morphing object. 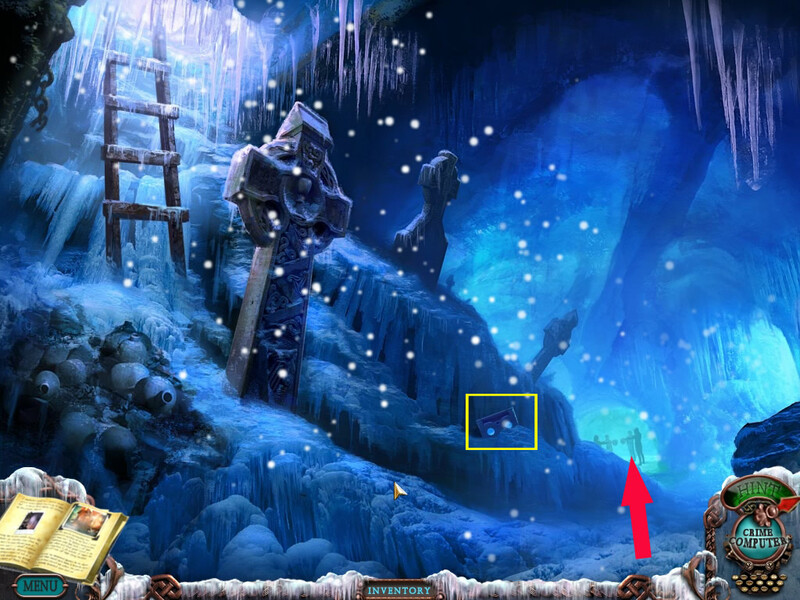 Place the beam above the abyss as shown on the screen shot and play the second ho-scene. The coin will go into your inventory. Go far right into the dining room. Pick up the video tape left side on the floor. Click the hole on the floor left side. As you can't see any, place the oil lamp from your inventory there. Click on the top - you need a ladder. Go back into the barn and grab the ladder. Go back and place it to reach the upper floor. Go up - Congratulations: You found the 4th student. Pick up the video tape left side. There is an object far right that appears and disappears - it is a morphing object. 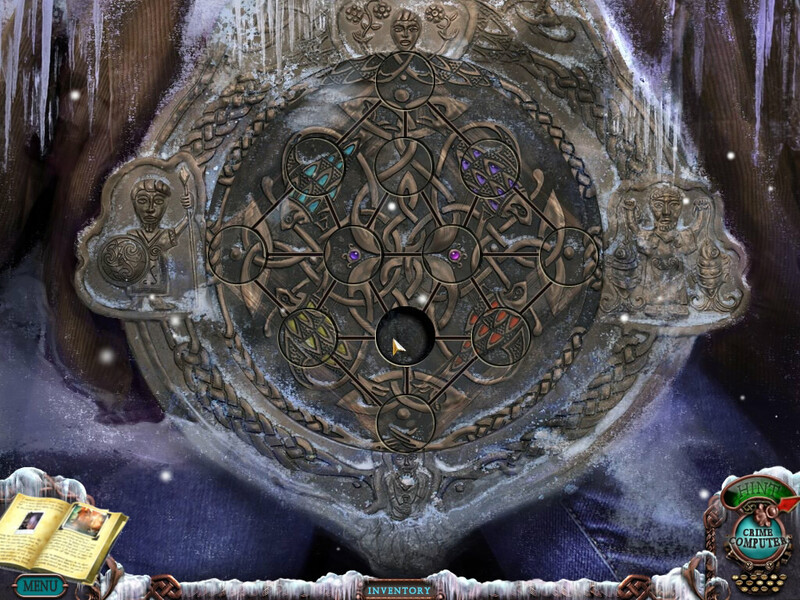 Click the amulet on the students chest, a puzzle appears. You will want to drag the parts for the circles to reassemble the picture. Please see screen shot for the the solution. Click the lawn mower and use the wrench to get the fuse. Go to the hotel generator. Place the fuse at the yellow cable. 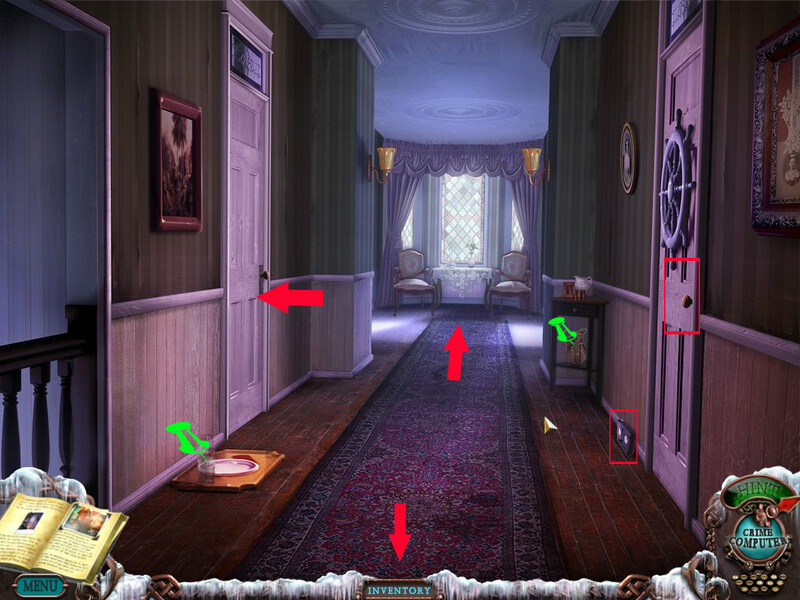 Latest now you should solve the trunk puzzle, bedroom right hallway front. Inside you will find the manual for the generator. It was copied to your journal, page 6. Read the manual - you will need to click the switches left side. Press after the red button left side 4x. Click the upper handle 2x, the lower 3 times. For me it never worked out the first time, I always had to redo my steps here twice or three times. So don't you worry, it works, just keep trying. Enter the hotel, go into the manager office and go downstairs. Far right - the print on the wooden crate is a morphing object. Click the shelf and pick up the bottle with sea salt. Click the green hose and use the clipper from your inventory to cut of a piece of it. Click the acetylene torch on the ground in front of the shelf. There is a hole - fix it with super glue and place the part of the hose onto it after. Click it to get it into your inventory. Go upstairs into the bedroom right, front hall. Place the telephone charger at the outlet right next to the bed, when you haven't already done this before. Place the cellphone into the charger. The following puzzle is a slider puzzle. Just move the orange tiles into the top field and blue ones at the bottom. To move the tiles click it. It will go onto the next free field or jump over the one in front of it, when there is a free field behind. You can jump and move forwards and backwards, you can jump over tiles of the same color. You will see, that there are no new messages for xxxxxx a telephone number follows, it will be copied into your inventory. This telephone number, especially the last four digits, are random. Watch (LISTEN) to the second video to find out, what these numbers are for. You need these four digits to open the suitcase in the bedroom right, hall back. Enter the bedroom with the suitcase. Click the suitcase and change the number lock according to the last four numbers of Allison's telephone number. It is copied page 22 in your journal. 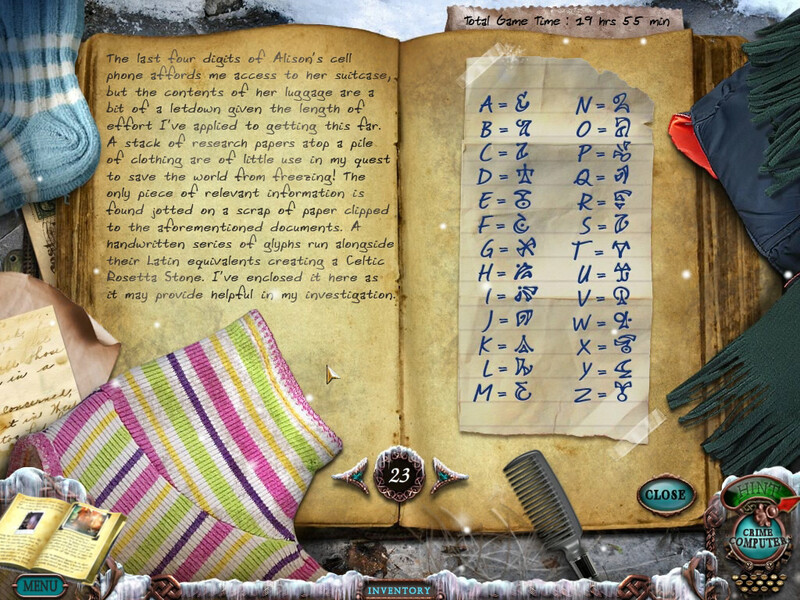 The suitcase opens and you will find a list with letters according to symbols. The list will be copied into your journal. Use the metal tongs to get the coin. When you haven't already done it, go to the hunting lodge. Play the 2nd ho scene. A bag of potato chips will go into your inventory. You will need it for the extra content, which is NOT part of this walkthrough. 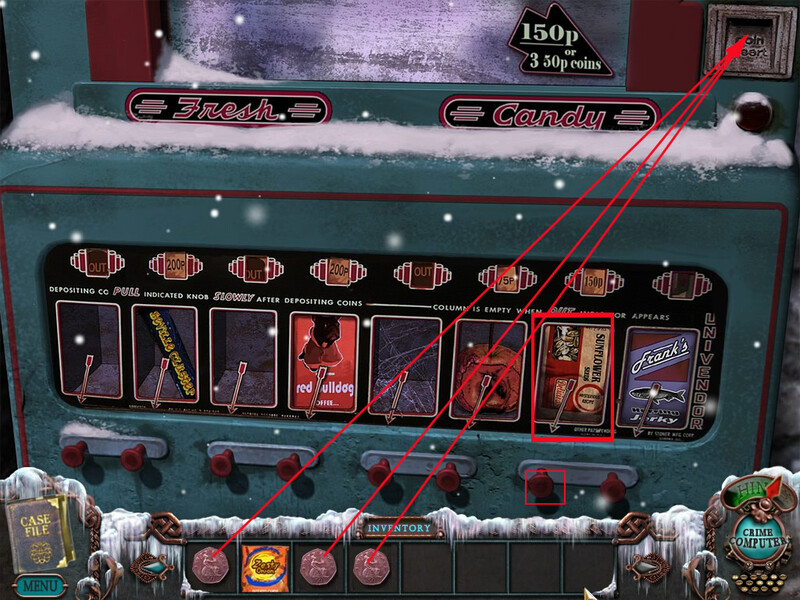 Click the vendor right side of the grocery and place all coins at the coin slot top right. Click the button for sunflower seeds, a packet will go into your inventory. Now go the farm house and follow the way there up left. 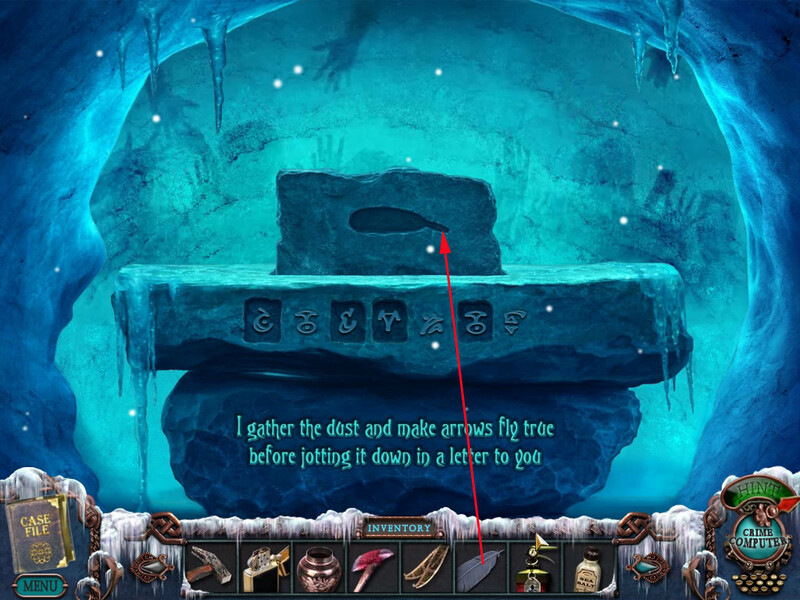 The word Runes/Ruins on the wooden sign is a morphing object. 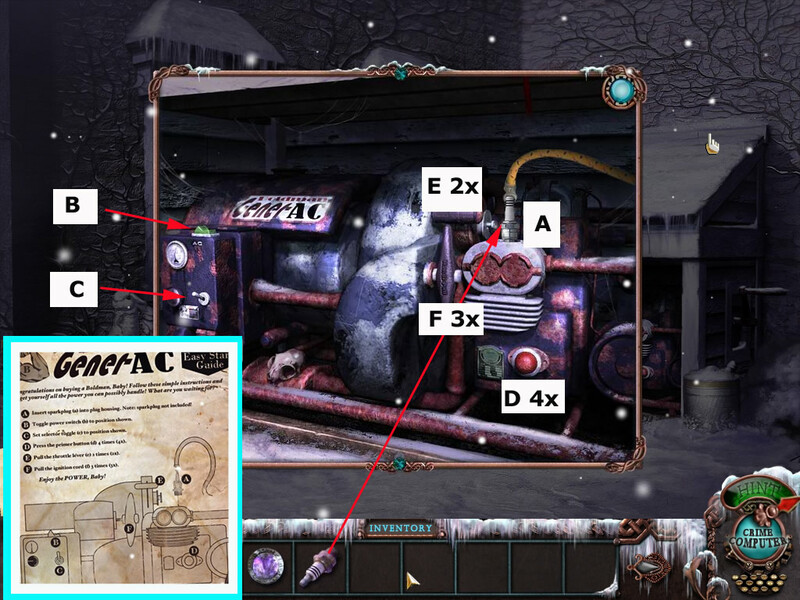 Get the Acetylene-torch out of your inventory and move it with pressed mouse button a few times over the bridge to remove the ice. When you do not have the snow shoes yet, then you have to go back to the grocery. There you will find them in the basement. (See for this also spoiler "2. Student"
You do not need to "wear" them, having them in the inventory is enough. The bowl on the table left side is a morphing object. The shoes under the bed are morphing as well. 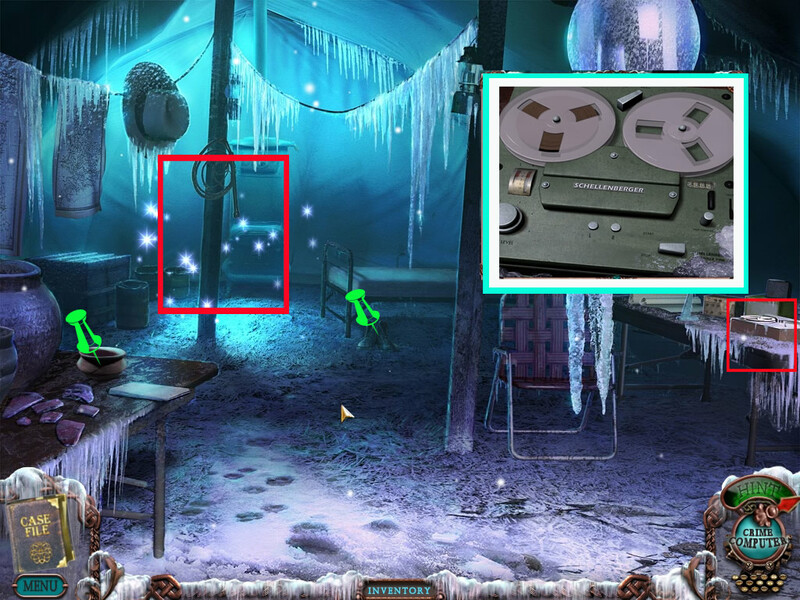 Click the tape recorder right side on the table and place the tape reel. You will hear a woman talking about, that maybe the legend is real. Leave the tent and go back to the hotel. Go back on the way to the car. Use the axe to cut fire wood from the logs on the way. Go back to the hotel entrance and click the thermometer at right side. Use the hammer to smash the thermometer. Place the glass vial underneath to catch the drops of mercury. Go inside the hotel, lobby left side. Place the fire wood into the fire place. Extinguish the fire with the fire extinguisher. Place the urn at the ashes. Feather = Crossing with the wolf left side. Seeds = Candy vendor right side of grocery. Pick up the video tape to your left. Click the ruins to get a nearby view. 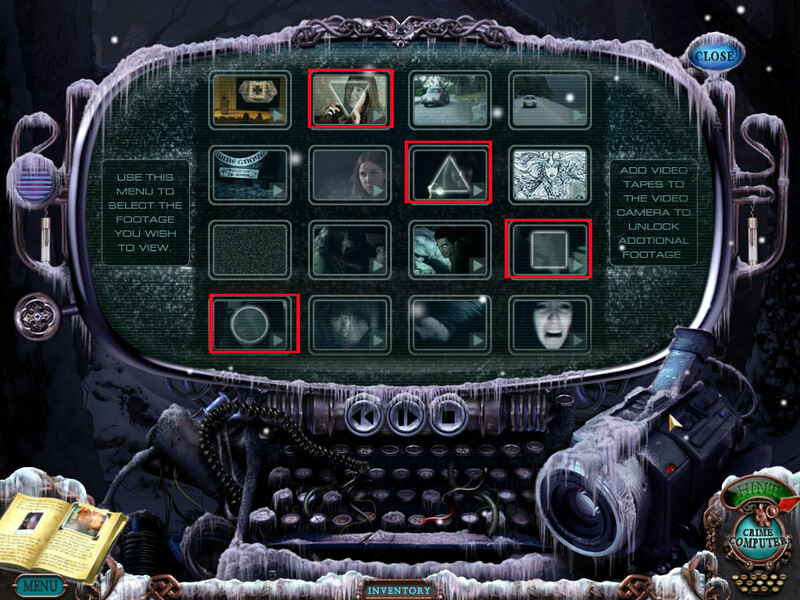 For the now following puzzle you need to have 15 video tapes. When you are still missing a tape go back and see, where you might have missed on. See also the spoiler below the walkthrough "Locations of all video tapes"
Open up your crime computer as if you were going to watch one of the videos. Look closely at the video screens, they are in the same 4 x 4 grid pattern as the puzzle. 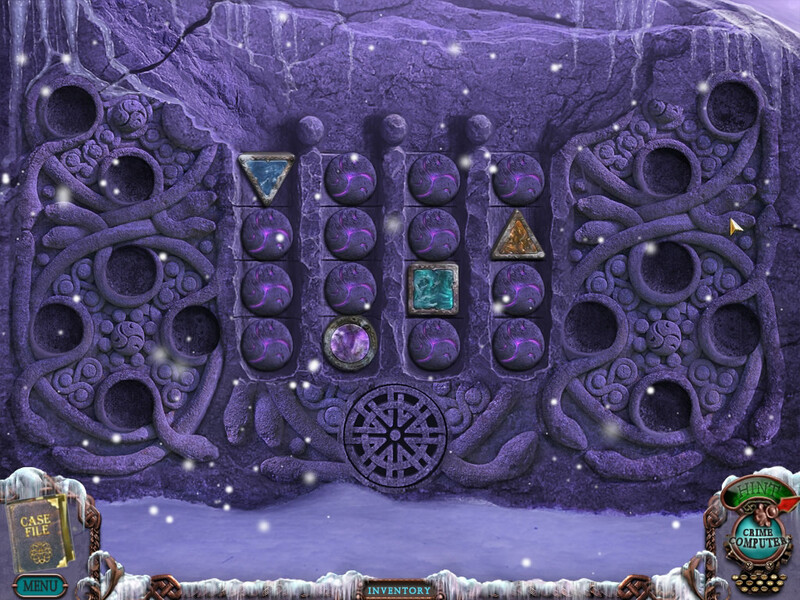 Keep watching and the shapes will flash over the screens in the positions that they need to go in the puzzle. 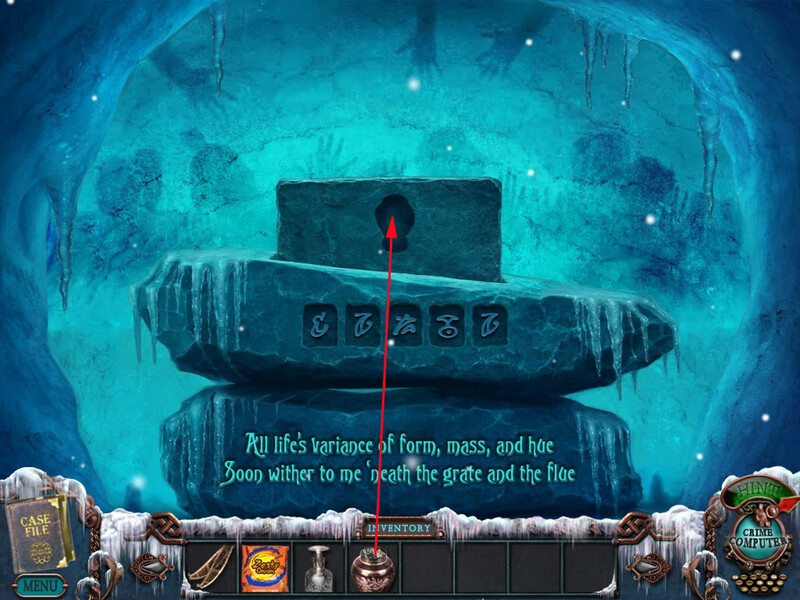 To move the stones click first a stone and click then the row you want to place it. If you have it right, then the ground will open up. Incidentally, this solution is random, so I cannot tell you exactly what it will look like. WARNING: Before you enter the ruins, make sure, that you have in your inventory: A feather, a package of seeds, a urn with ashes, a glass vial with mercury. 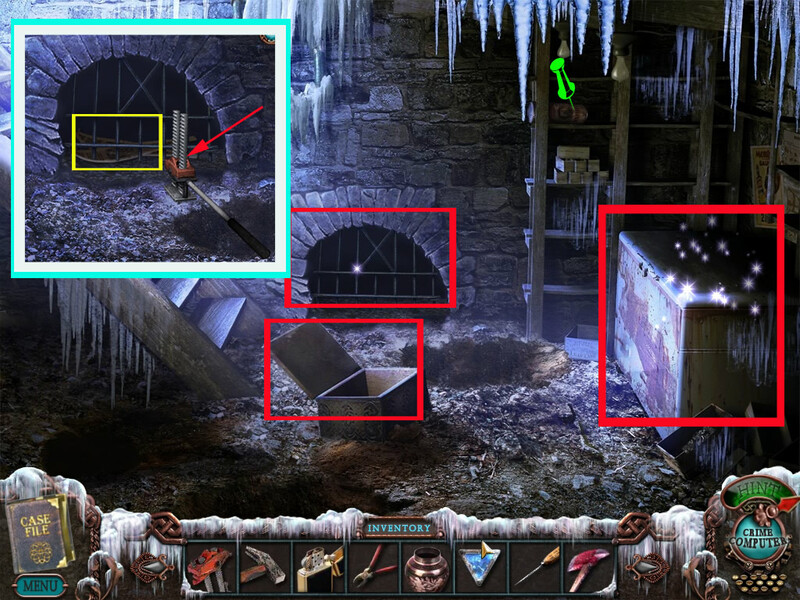 Starting the final puzzle without one or more of this objects can ensure a serious bug, which will NOT LET YOU FINISH THE GAME! You will have to start all over in this case. You will come to a hole, to deep to jump, you will need the ladder. Go back to the farmhouse to learn that it is missing. Allison must have awaken and climb down. Go back to the ruins - the ladder is there now. Pick up the last video tape and go over to the four students. Watch the cut scene and click on the huge white sparkle. 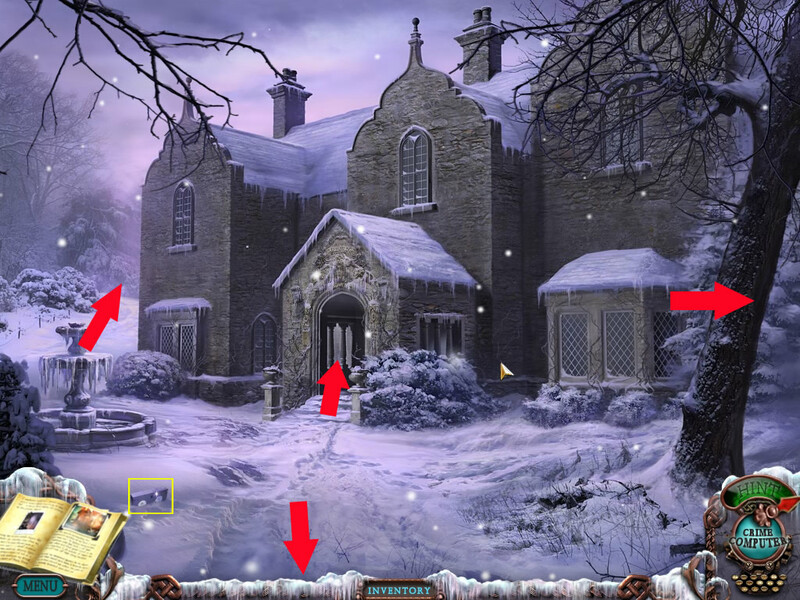 Click the four niches and learn that you will have to solve five riddles. 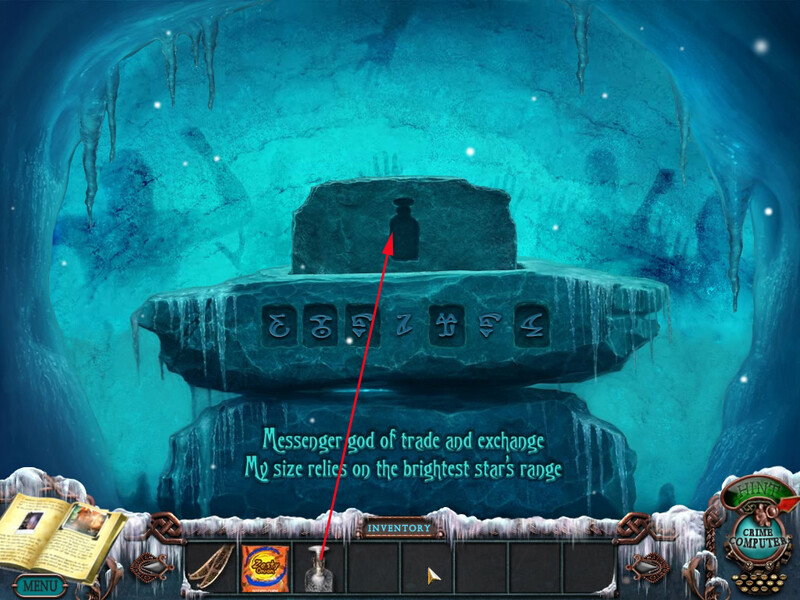 Above the riddles, you see symbols. First you need to find out the meaning of the riddle. 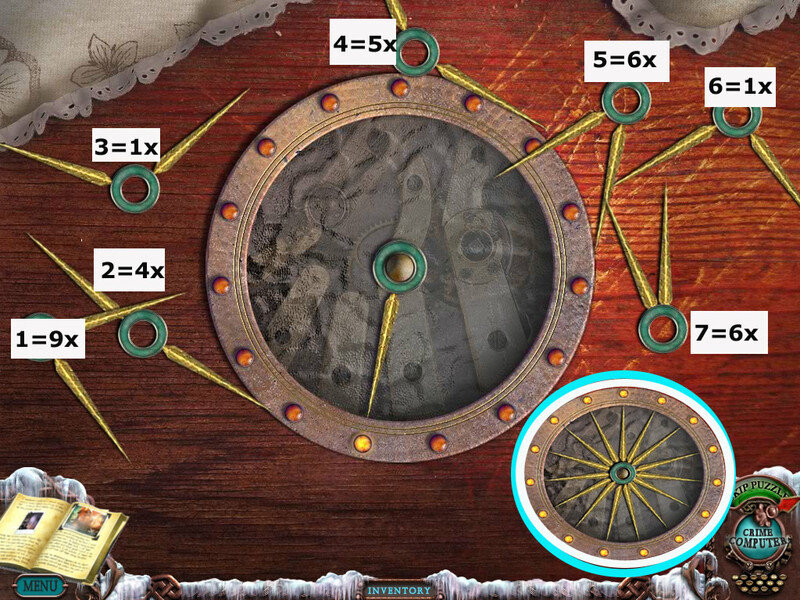 After you know, change the symbols by clicking, so that they do spell the riddle-solution. To do so, you will need to look at the list from Allison's suitcase. The easiest way: Print out this screen shot - so you will have the list next to you and do not have to change between scene and journal all the time. 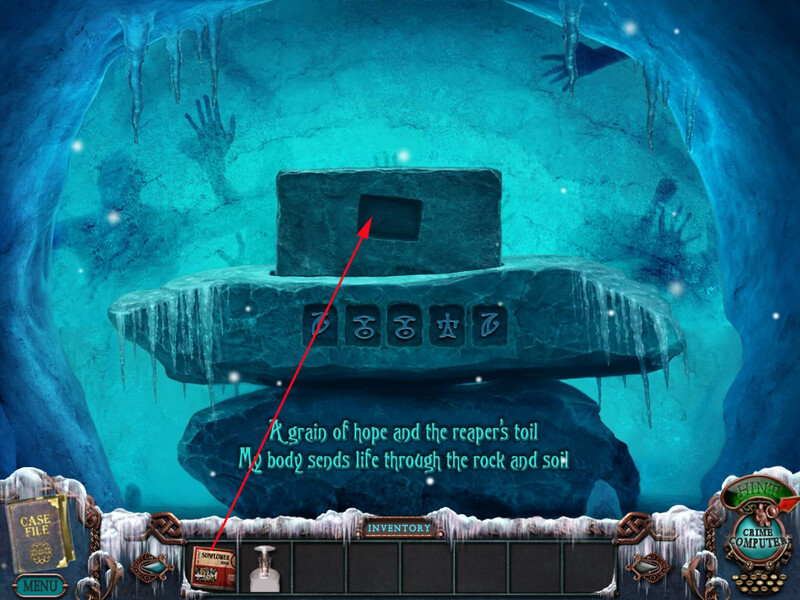 When you spell it right, a stone board will come up - get the object out of your inventory and place it at the space shaped as the object. Go to the next niche. Leave the niche and enjoy the end. Key - glove compartment car on the street - to use: opens trunk. Telephone charger - 2nd ho-scene backpack lobby left - to use: bedroom right, hallway front. Rope - ho-scene backyard - to use: bridge to town. Snow shoes - grate, basement grocery - to use: Without them in your inventory you can't make it to the ruins, you will be told the snow is too deep. You do not have to wear them, it is enough to just have them in your inventory. Part of a hose - hotel basement - to use: at acetylene torch hotel basement. Sign at reception above "Vacancies"
Sign - above bridge to town. Object - top shelf grocery basement. First: The second time you are in an HOG scene in the hunting lodge you will get a bag of onion flavored potato chips (yummy!) as your inventory item. When you go back towards the cemetery you feed them to the wolf, this opens an extra HOG scene in the tree above the wolf. The inventory item you get from the scene is a golden felix (bigfish symbol). 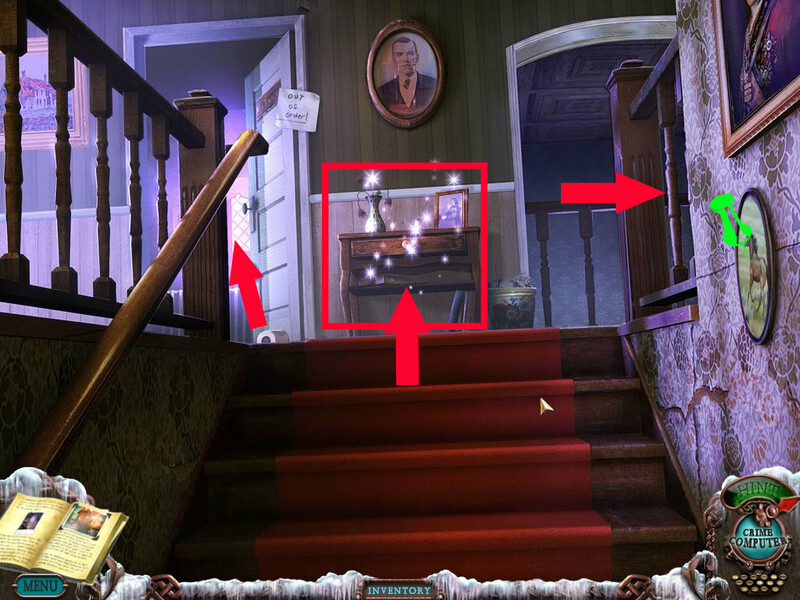 Second: When you are in the museum there is a little card you can find in that upper room that has a little rebus explaining how to get the second golden felix. You have to hit the ornamental rabbit back at the house (next to the generator) 10 times with a hammer, which removes his head. You then take the head to the grocery store and put it in the microwave. This opens another extra HOG scene above the microwave, and the inventory item is a golden felix. Third: In the same back room of the grocery store where the microwave is there is a large rag rug on the floor. If you click on it to move it it reveals a trap-door with two felix shaped indentations. Place the two golden felixes (felices?) in the indentations and it opens the door. This is the "extra content" for the collector's edition. Go down into the secret basement and there's some stuff down there. You'll find a box of laundry soap to take, there's a phone there with no receiver, the word puzzle that was in the nautical room is there on a barrel, and there's a strange picture of a kid on the wall. 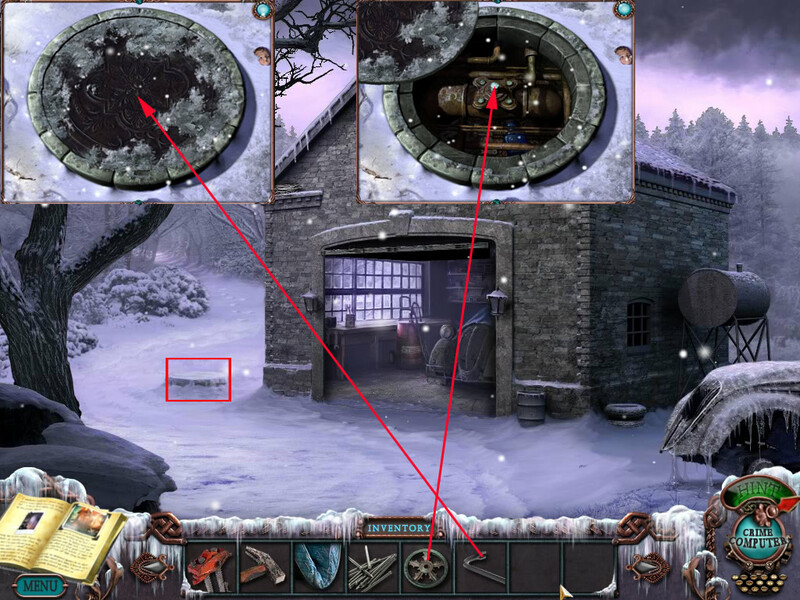 Solve the puzzle to open the barrel and there's some stuff in there that are probably clues to the next MCF game, looks like Victor will be back for revenge. Fourth: In the basement of the hotel (once you get the generator going and the lights on) you do the regular stuff with the hose, acetylene torch and getting the salt. But you can also click on the washing machine down there. When you do and you open the door, there's dirty clothes inside, so add the laundry detergent, close the door, and turn it on. Rather amusingly the machine goes into overdrive and spills suds all over the basement, and opens yet another extra HOG scene. The found object this time is a phone receiver. Presidentsaddress x squareroot9 + yardsinmile + yearthekingleftthebuilding - pacmanghosts + decimal(101011101011) x felixaddress - californiapolicepenalcodemurder + columbussailedtheoceanblue x lettersracheaelraymiddlename - spaceneedleheightinfeet + shaqshoesize - allisonareacode / atomicnumbersilicon. Special thanks to Kayleigh for writing up this massive walkthrough! \o/ And GrinnyP for the guide to the Bonus Content Guide! Wooty tooty! Downloading it now. This is several gigs in size, isn't it. I love MCF games, always so classy. It's very classy with high production values as we have come to expect from the series. 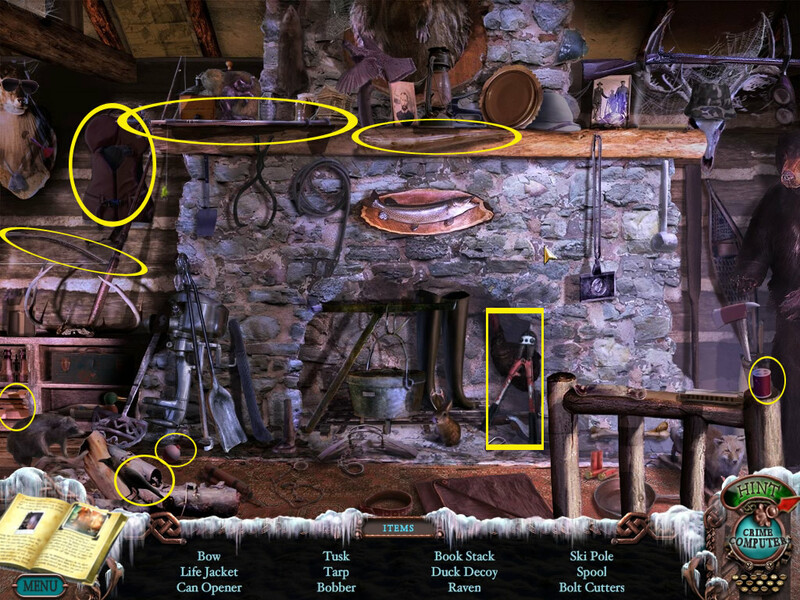 the MCF games are without a doubt the best in this genre (hidden object), whilst incorporating my old favourite - the adventure game. there's not been a single game of theirs i haven't loved. 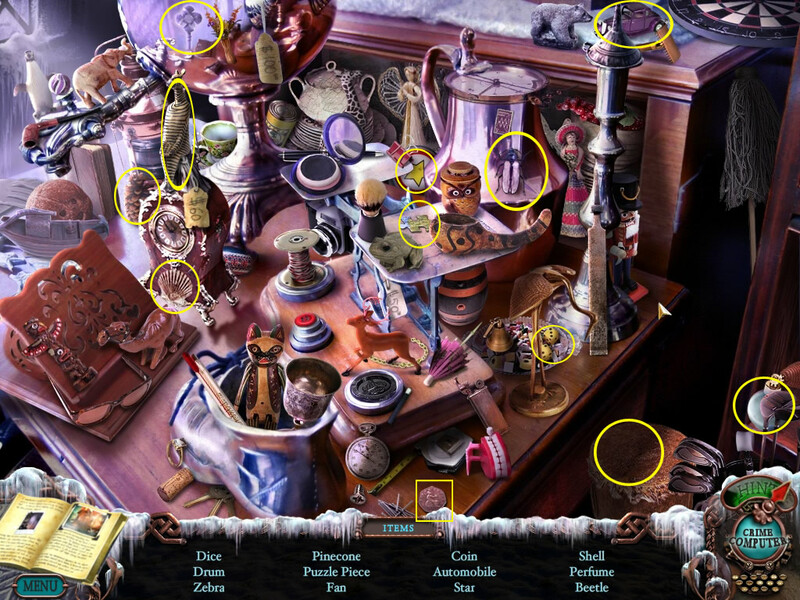 I didn't even LIKE hidden object games until I met the Mystery Case Files. Our eyes locked across the room, and magic happened. Dire Grove is pretty awesome. I would totally have a Madame Fate bobblehead in MY car, too. Also, have I mentioned I'm continually impressed by people with the patience and dedication to write walkthroughs for these games? 'Cuz I am. 5 hours later and I'm not halfway through yet. This thing is massive. I'm glad they included an in-game walkthrough. I plod along till I reach an impenetrable dead end, then I sneak a peek at what direction I should tackle. (Nudgingly of course.) This is an excellent follow-through in this series. The videos are pretty neat too. I forgot all about that 'changing object' trick. I love that! Is there any word on when this will be out for Mac? I'm dying here seeing at how pretty it looks, and not at all able to play it! This looks so cool. I do want to buy it, but I'm never sure how the Big Fish site works. If you buy a game, do you automatically sign up for a monthly membership? Cuz I'd much rather just buy a game every now and then. The word is that they are working on a Mac build, but no word yet on when it will be released. All they will say is "sometime after the regular edition goes on sale". To buy a game at Big Fish you do have to sign up to create an account. Here's a quote from the site: "If you don't wish to become a member of Big Fish Game Club, delete the free membership trial from your shopping cart while purchasing your game. You'll still get your game for the same low price, but won't receive membership benefits such as early access to all new games, Live Chat Customer Support, and ongoing member rewards." 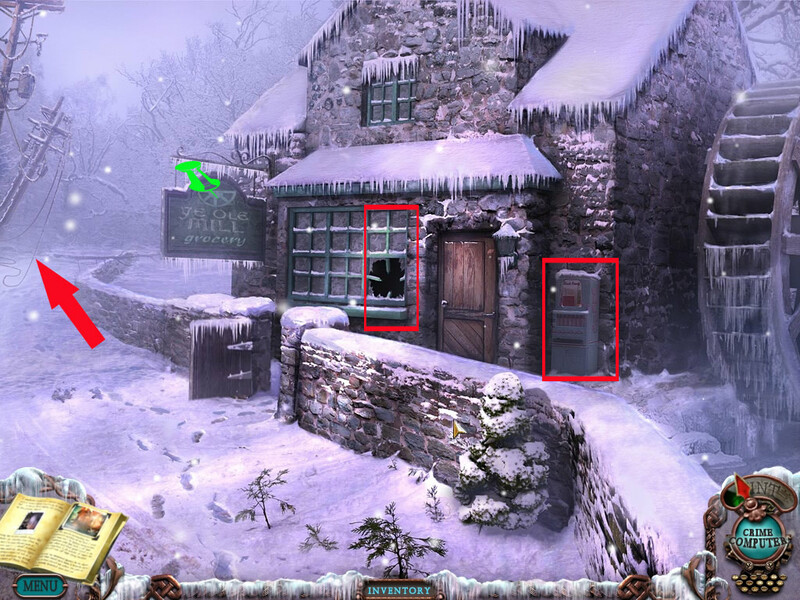 The Collector's Edition of Mystery Case Files: Dire Grove that is for sale now is for members only, the regular game will go on sale in early December for purchase by anyone. If you do sign up for the membership to buy the game, you can cancel it at any time. Yay! Thanks so much for clearing that up. I've been throwing longing glances at several games, but have been to worried about missing the fine print. Is this seriously $19.95? Seriously? The spoiler doesn't suggest that the bonus content is worth $13 extra--can someone comment? The game will be released to everyone for $6.99 in early December. The collector's edition available now includes early access to the game as well as a strategy guide and some extra exclusive content that won't be available elsewhere. If those things don't provide value to you, then I suggest you wait for the general release in December. It's more that I can't _tell_ whether it would provide value because I don't know what the "extra exclusive content" is. I understand your surprise, this is something new that Big Fish is doing with this high-profile release. It's highly unusual. 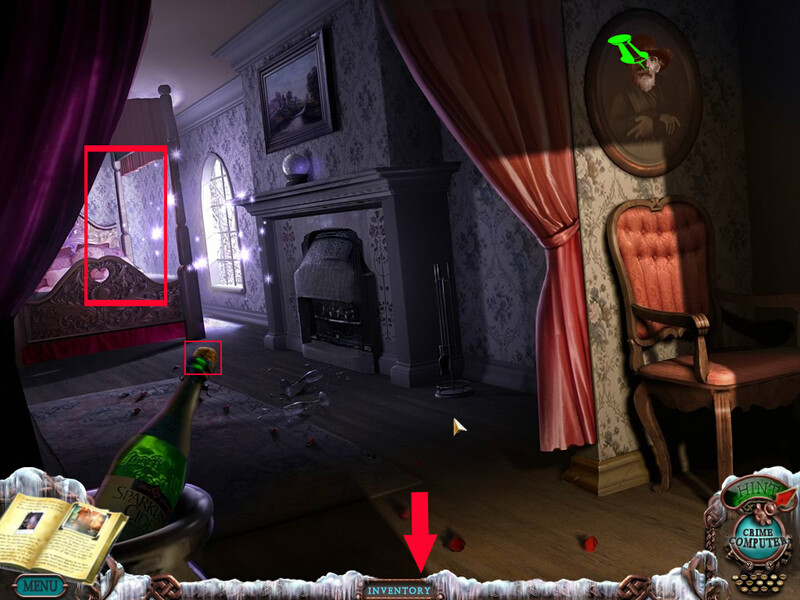 As for the bonus content, from what I can tell there is an extra hidden object scene to play, and an achievement system with several achievements to unlock (find all the students, play in under 8 hours, use no hints, etc.). I can't speak for the strategy guide or for the behind the scenes footage of Big Fish Game studios that I hear is also included as bonus extras. And, of course, you get to play the game now rather than waiting. That's about the best I can do to explain the advantages you'll receive by purchasing the game now. I can vouch for the quality of the game, though. 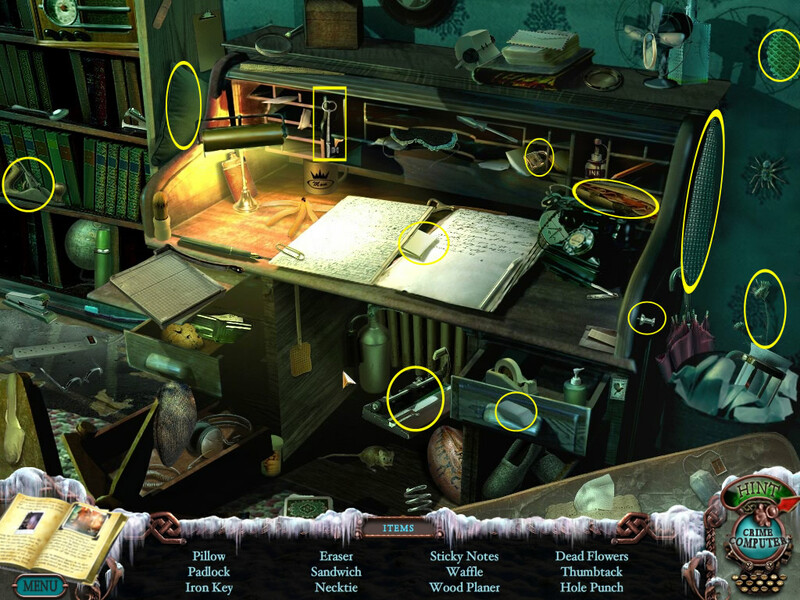 It's very good as we have come to expect from the Mystery Case Files series, and probably even worth a bit more than $6.99. It does. Thanks very much, and I appreciate your taking the time. I finished the game yesterday (with some help from the strategy guide when I got stuck), and had forgotten about the bonus features after getting caught up in the story! Now I can go back and replay with the bonus features and morphing collecting in mind! TO answer your question - no the extra features are not worth the extra $13 unless you REALLY like concept art and videos of the actors travelling. I wish I'd waited adn bought it in December for the $7 instead. 2156246 is definitely the phone number to dial. You hear Victor taunting you when you dial it. I made it all the way to what I assume to be the final puzzle, or very nearly the final puzzle, and I messed up. So I clicked the little reset button thing. And the game crashed. I WANTED TO SEE THE ENDING. I have a problem with finding the last morphing object. 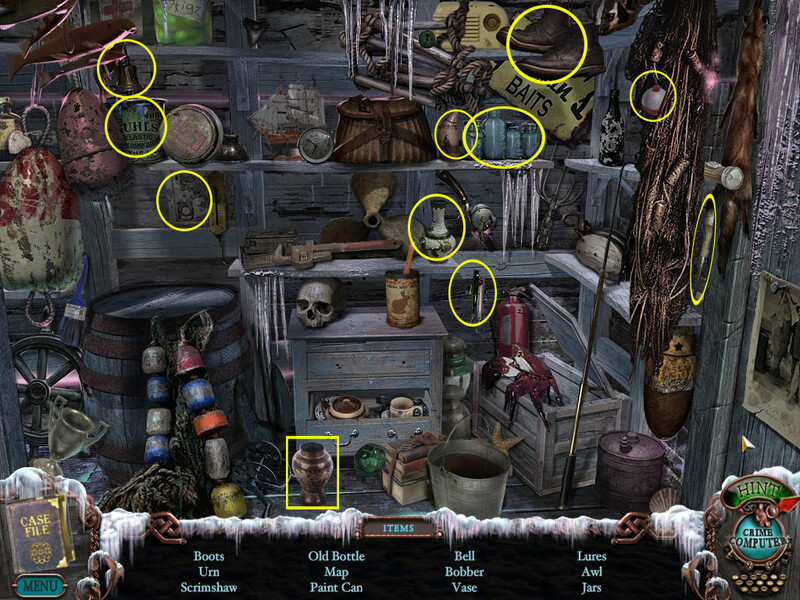 I checked all the places mentioned in morphing object list TWICE but the bonus scene map in the grocery basement: http://i16.photobucket.com/albums/b20/Edme/missingmorphingobject.png tells me that I'm still missing one in the tent/ruins area. 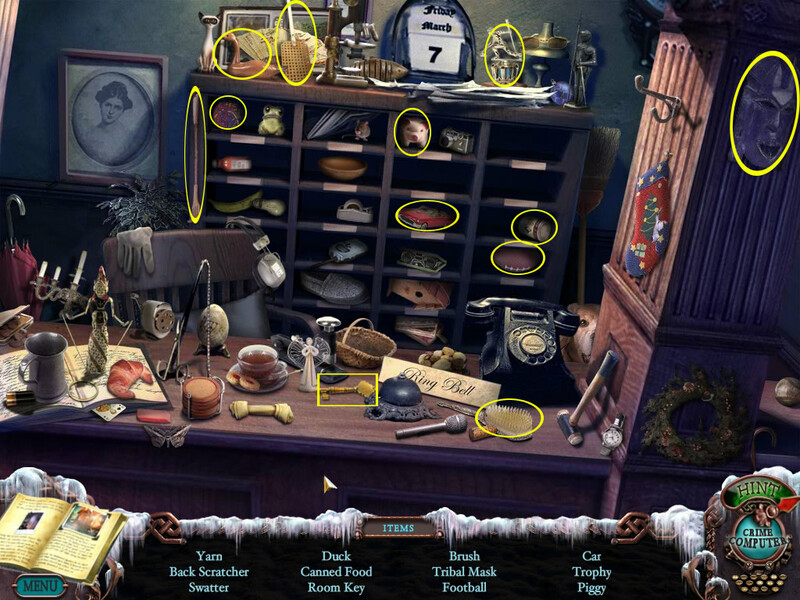 I found the boots, bowl and nail in the tent and I keep clicking around the area but I can't find it! Help me please! 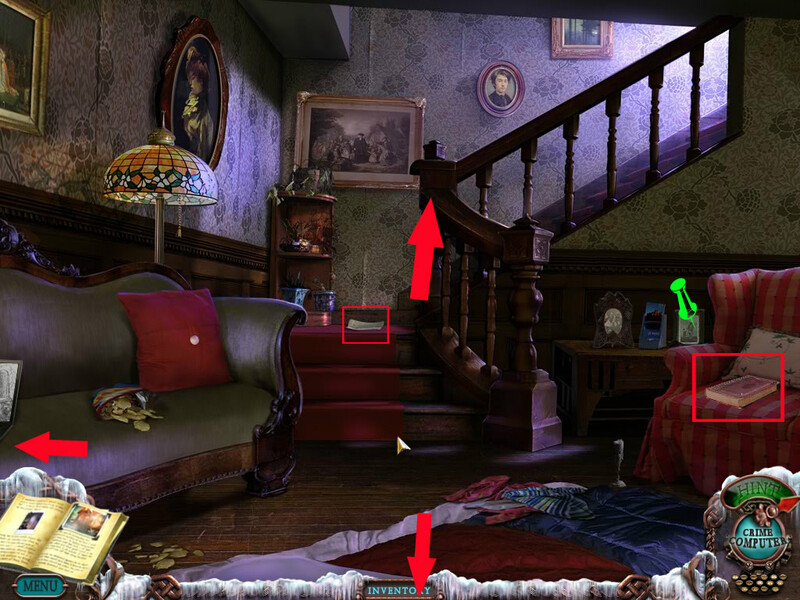 @Haludek - So the last 5 objects can be found in 4 scenes. 1. Morphing sign near the frozen bridge (not frozen after you've used the flamethrower on it). 2. Peg/nail outside the tent. 3. Boots in the tent. 4. Bowl in the tent. 5. Skull in the top right hand corner in the last scene with the banshee skeleton. I am at the part where you have to hit the rabbit on the head to knock it off. I think I have everything I need, but I've been trying and trying, to no avail. Anyone have any ideas? SVOIGHT - thanks for pointing out the higher price tag. I was literally reaching for the "buy" button (activating my BFG membership in the process) when I caught your blurb. Personally, I don't feel comfortable spending almost triple a game's cost for "extra content" - especially when I'm not sure what this content IS. For the truly curious, I'm sure the video vignettes will appear online soon enough. As for mini-games, I can buy two entire puzzle games for the extra price. (Of course, that's just one woman's opinion). "5. Skull in the top right hand corner in the last scene with the banshee skeleton." Grocery hidden room (where the telephone is). I can not figure out the word puzzle. Can anyone help me? I have been doing that and nothing seems to work. I even started the game over to see if it was something I did out of sequence. First time I started the generator before trying to get the rabbit. The second time, I waited to start the generator and am trying to get the rabbit. In the strategy guide it says to hit the rabbit on the left side, but it doesn't say where on the left side. I'm having the same problem as Morigale and Haludek. My game crashed on me three times while I was playing. It wasn't until the third time (when I was SO close to the end!) did it say "The profile Allie has been corrupted" etc. I started a new game about an hour ago and it just crashed on me a few minutes ago. I fear to go back to the game, because it may also have been corrupted! This time I'm just at the point of finding the third student. Could somebody please tell me what's going on and how I can fix it? Thanks. Are you using the regular hammer or the sledgehammer? You need to use the regular hammer. Click on the hammer, then click on the rabbit. If the hammer goes back into your inventory you are in the wrong place and need to try again. If the hammer stays in the scene then keep hitting until you hit it 10 times in a row. If the hammer is staying in the scene and you are hitting 10 times and it still doesn't work this may be a bug and you might want to contact BigFish technical support. This is most definitely a technical problem and you should contact BigFish technical support to see if they have a fix. I finshed the game and I still have snow shoes... anyone know where to use them? I also hooked up the phone in the hidden basement with the two fishes on top but I do not know what to do next... anyone know? I purchased the game because of the Ravenhearst games, of which I am completely enamored. I thought the music was haunting and memorable. The Dire Grove game came so highly recommended that I couldn't wait to try it. I've been playing all weekend, loving every puzzle (and for once I didn't cheat and skip the puzzles). I got to the last scenes where I am watching the scenario play itself out, and my game crashed. I had the "corrupt profile" message. I am so disappointed. I am not much for playing a game a second time, but I really want to see the end. Now, I wonder if that is possible because of the different posts here, where people have crashed multiple times. What can be done? If you didn't have the snowshoes in your inventory you would not have made it up the path to the farmhouse, the snow is too deep. You don't use them directly, so they are left in your inventory when you finish the game. 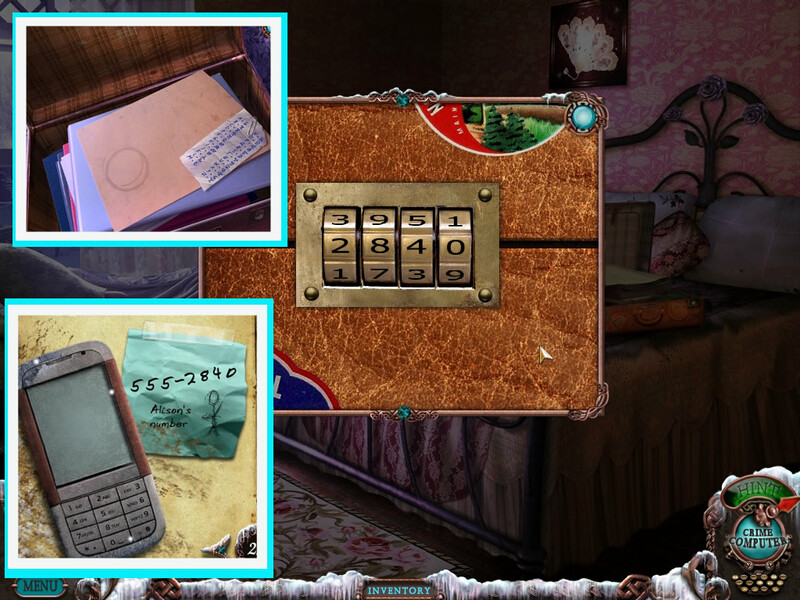 As for the phone, there is a puzzle at the end of the credits when you finish the game, solve it and you get the phone number to call. Technical problems like that should be addressed to BigFish's technical support, I'm sure they can help. That nearly got me too, but I finally figured out that I was aiming the end of the hammer on the bunny head. It turns out you place the handle of the hammer on the bunny head, then it works. Crazy! Thank so very much for your post. I've been trying for 2 days to knock that rabbit's head off. I even started another game, and followed the guide step by step to see if there was something I missed. I never would have thought of using the hammer handle, but when I did, it worked the first time. Lol! Thank you again and happy gaming. Help! I have unlocked the bonus content under the store and have a map in the barrel showing a lighthouse... What does this relate to??? I can't find anywhere in Dire Grove that this relates to... Any ideas??? 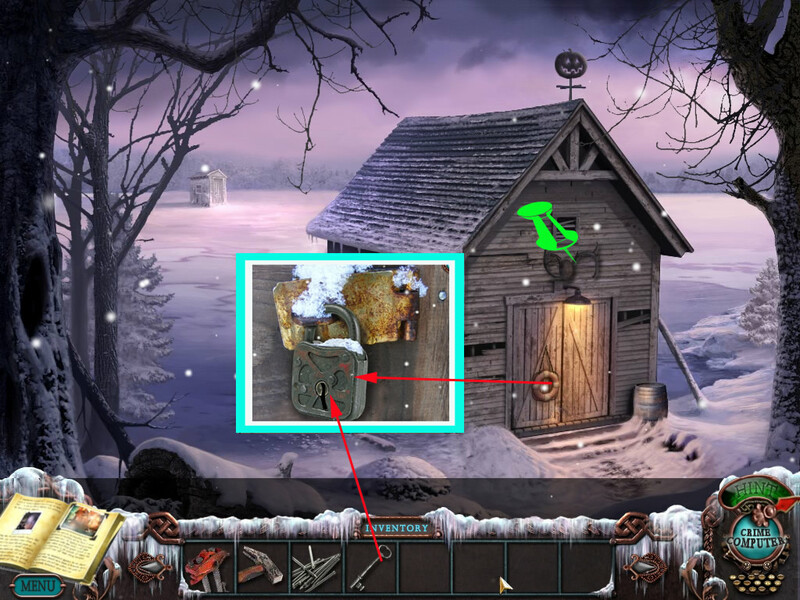 The stuff in the barrel is supposed to be hints for the next Mystery Case Files game. 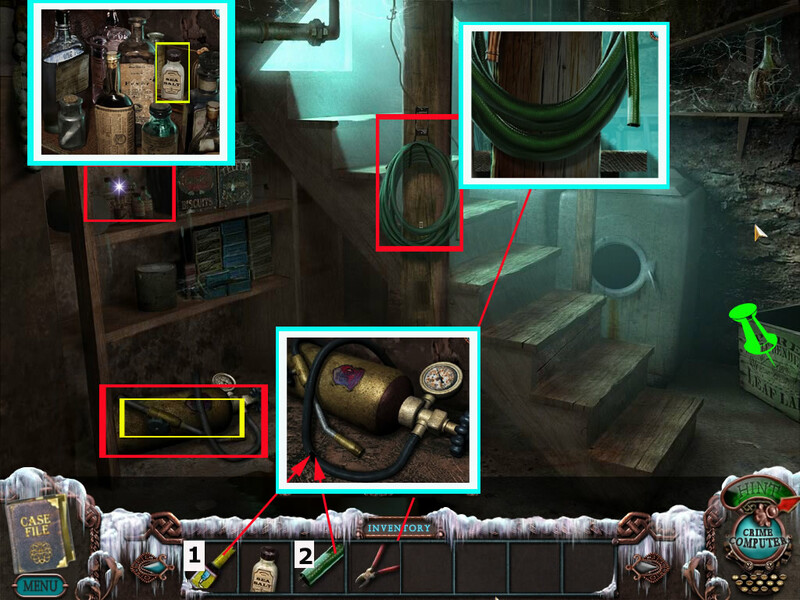 Judging by the stuff in the barrel and the phone call my suspicions are that it will involve Victor from Mystery Case Files: Return to Ravenhearst. Then again, maybe not. It's just a teaser. Arrrgh!!! I'm watching my bucks (and waiting to cash in on my BF game credit) but it sounds great and I'm so excited! Please keep the user reviews coming on this one! Thanks! It took me 4 hours to finish the game. The videos looked like a b-movie and actors were very unconvincing - at first I was sure it was the game programmers, designers etc. decided to save some money by not using professional actors. Now, already mentioned in other reviews numerous hammers, sledgehammers and crowbars that CAN'T break ice! The wolf that eats potato chips in sealed bag! 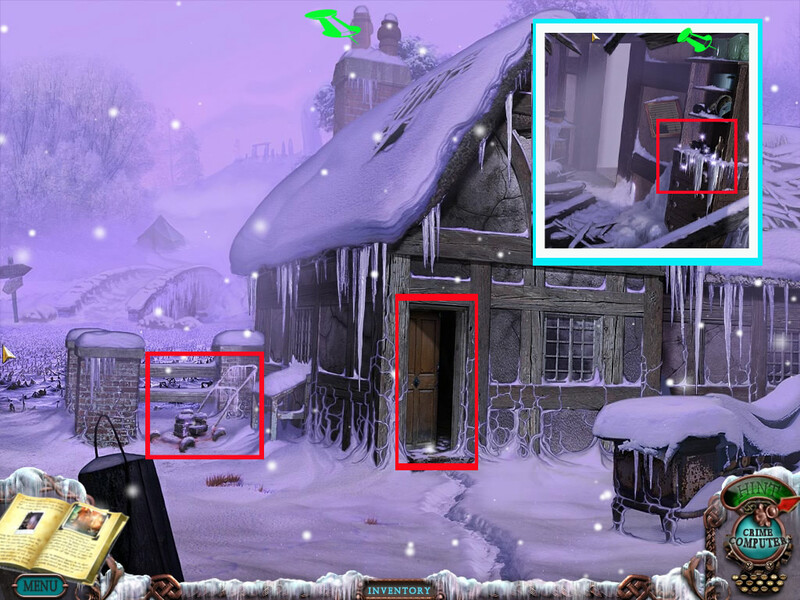 Hidden object locations appearing without any reason in places I've already looked... Hmm... at least there should be some hint on that, otherwise the game is a little annoying because of all walking back and forth. To add something to the beloved strong point of MCF series - visuals. 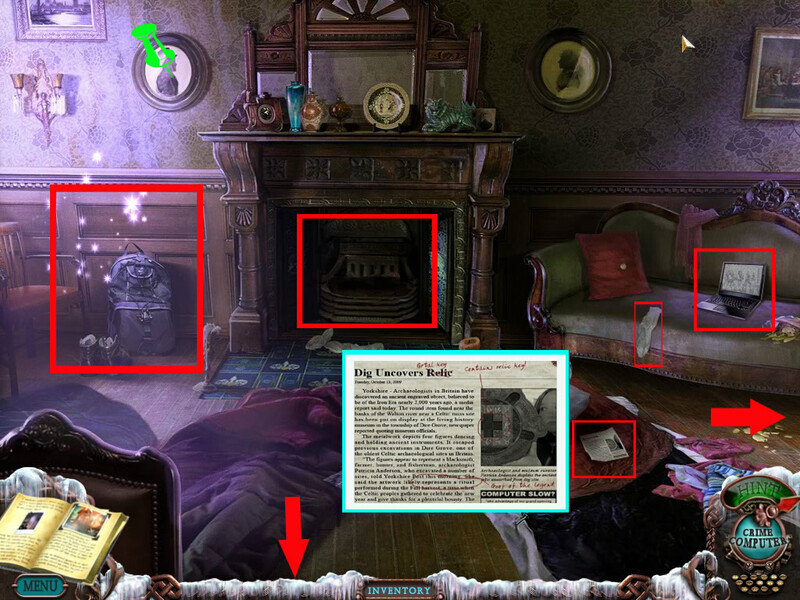 Have you seen the banshee screaming when you solve the riddles in the final scene? Do you need comments? And the final hit: the puzzles. Thanks for the skip button, guys, no, really, it's something the game would be better without. I kept asking myself - is it the same company that made "Madame Fate"? 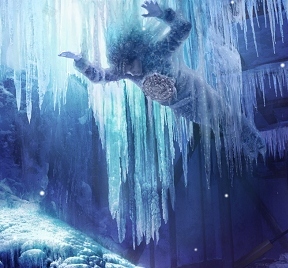 Now what I really loved about the game: its background art, which is so real that I naturally felt chilly. 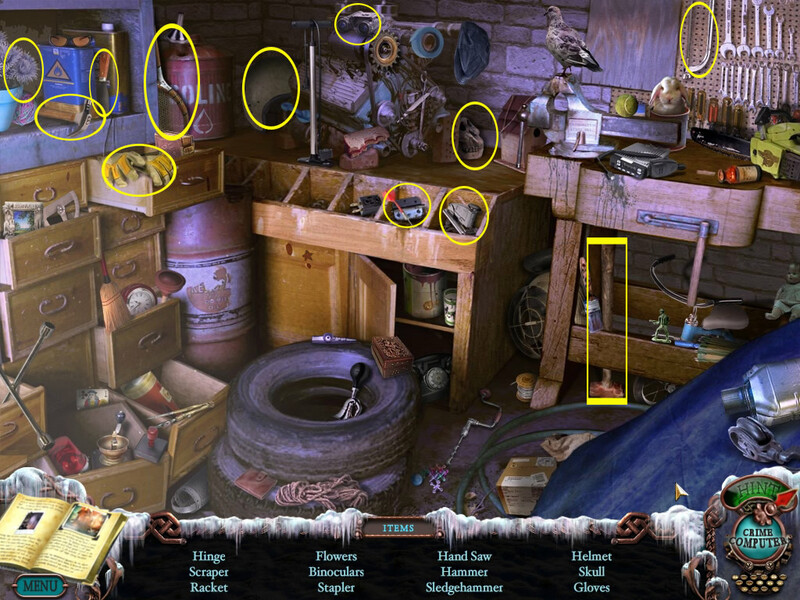 The hidden object locations are also very good this time, objects are clear and at the same time tricky to find. I could have done it without hints at all, though I've skipped all puzzles. And my beloved morphing objects. That's a great find and it still works very good. All in all, I think the game is worth its price, but I won't replay it. Ok, just so I understand...if I want to buy the collector's edition at Big Fish, I will have to drop $6.99 to reactivate my membership (which I can use to buy some other game) and then I can buy Dire Grove for $19.95? So basically I'm paying $27 for this game, with some random game to be chosen later thrown in? Or can the $6.99 apply toward the collector's edition? I can't say for sure about spending $27 on the game Amylu, but I've been a BF subscriber for over 2 years now and I have never had a problem. As for spending my monthly credit, Jay almost always recommends a game from them that I want to play beyond the demo and even if he/they don't, the large file downloads are well worth the $6.99 per month. These are usually games that you can only get elsewhere for $19.95 plus shipping. As near as I understand it, signing up for a Big Fish membership is free. You don't get billed for the $6.99 right away. I'm not sure I get your point regarding the puzzle in the nautical room - you describe it the same way as it is described in the walkthrough?!? click the manhole cover outside the garage and also click the valve itself (to know it's there)? If that doesn't help maybe you have to remove the manhole cover first in order to know that you need a valve. I caved it's downloading now. Be back soon I'm sure! To get the valve, hit the chain repeatedly at the top, not the end with the hook. You want it so that the chain keeps swinging up until it reaches and knocks the valve off. student number three, the one in the museum. I'm just not sure if its a bug in the game I have or something else. If there's something I'm missing could someone please help? Power of Posting. Got it. Thanks anyway! What you should do is finding out first, which symbols do goes in which at the top row and second row. 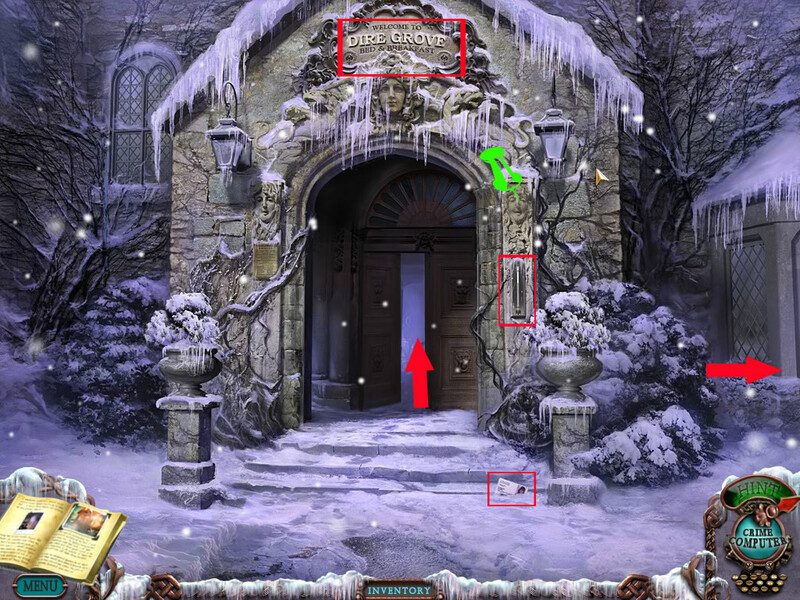 (Please have a look at the walkthrough to see the solution of the puzzle, which should be not random). When you know, get the symbols in the right order, one after each other, starting with the one second row right side. Now start bringing them into their position - You will want to place by going the way from left to right. Now do the same with the bottom row and second row seem from the bottom but other way around. Here your first tile has to be the one left side, second row and the last one second row right side. At the end, you will have to place the two tiles in the middle row. An amazing game!! I loved playing it and its really good and beats it predecessors ang I loved the story as well. I loved this game! The story line and scenes were incredibly absorbing with just the right amount of "creep factor" to keep you on the edge. I jumped several times! I haven't had this much fun with a game in a while. Well worth it! I believe Jay commented way up there somewhere about, "turning up the heat". True that! the barrel puzzle in the secret room? I've played through the game twice & I still have no idea what I'm supposed to be trying to spell with those letters. avenge. Also, one of the words is murder, I think the left one in the horizontal line. I neglected to thaw the meat and when I went to give the frozen meat to the wolf, he didn't want it and it did not return to my inventory, what do I do now? 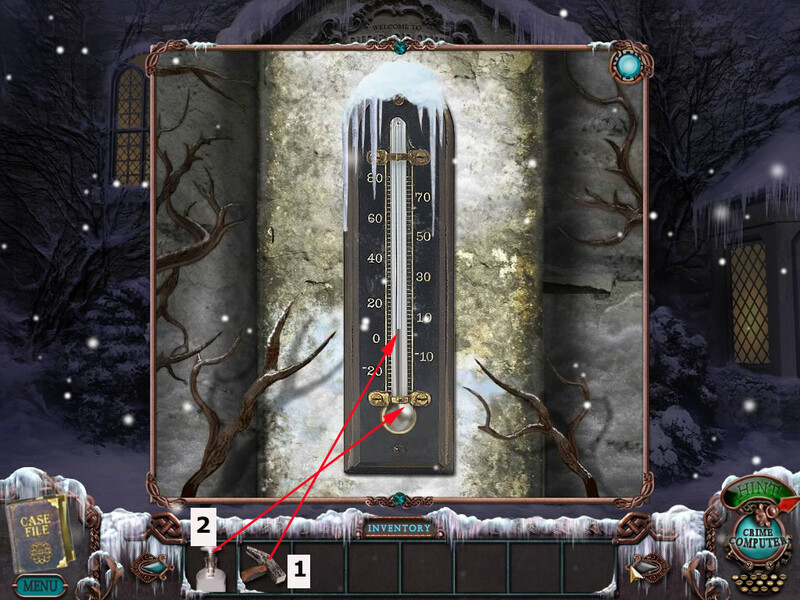 I have finished the game already and I am now trying to gain the achievement of not using the hint or freezing the screen. 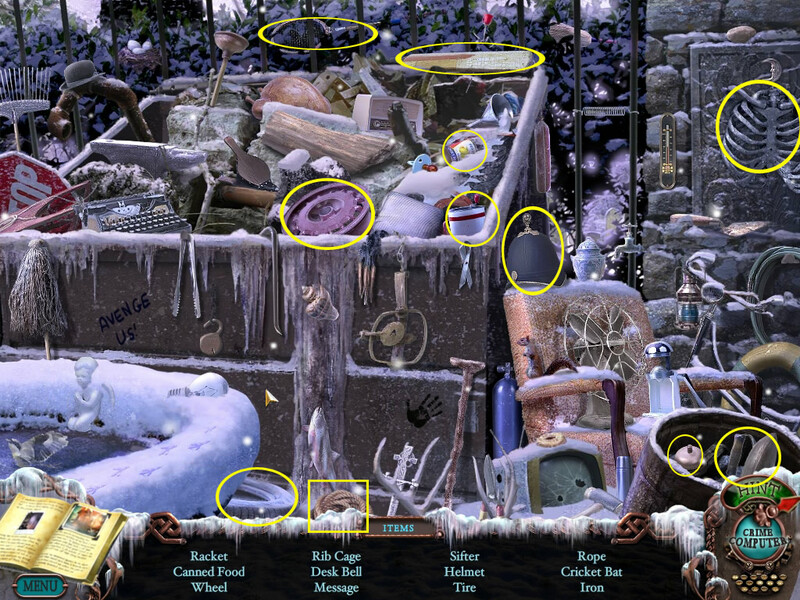 I am stuck at the dumpster hidden object scene before the graveyard. I can't find the broom in there. I need this in order to get the rope and move on. I'm stuck and I can't do a thing, and I'm still at the beginning!!! I cracked the rabbits head and I broke the bathrooms floor, and now there's a closed safe that I can't figure its combination and I can't do a thing! I mean I can't believe (donna) you finished the game!!!! just can anybody hint me for the next step !!! help! Nice game but does not function on my 10.1" netbook. I played for a while before realizing that on my small screen, the inventory items are not visible or accessible, and the option to change the screen size has been "disabled". It seems the game manufacturers think they know better than I do how do display a program on my screen. amal mj - to get the combination you have to get the piece of paper from the tree, and put it in the picture in the library. You need the hammer, nails, the small board and the saw. Use them to nail another board on the tree and then go up it and then use the saw to cut off the branch. I'm missing the one of the videos! The.. 9th one! Can anyone tell me where exactly the 9th video in the computer is? Please have a look at the top of the comments, there you will find a list with the locations of all videos. Unfortunenally I can't recall, which position which video had in the computer, but the list might help you to remember, which one you did not find. I have the one from the cemetery so it must be either one from the ho-scenes mentioned in the walkthrough. 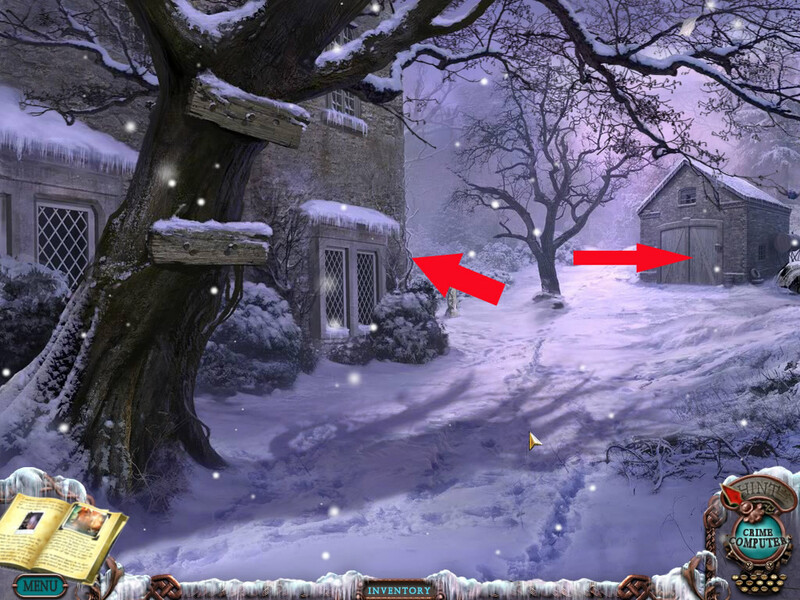 problem is i've checked back at both places and no more ho-scenes appear. i have four stones, i have the urn with ashes, i've got the mercury, i've got the feather. anything i need to do to trigger the missing ho-scene? What's with the radio? It seems overly complicated to have no use. CD + ER on the tree? Wait never mind, I just got that. Allusion to Ravenhearst. 37 carved into the museum display. Hmm... It looks like the standard version does NOT include the morphing (or morphine -- hee hee!) objects. Also, smackin' that rabbit does nothing. All of which, I suppose, is to be expected, based on comments and on the simple fact that there IS a "collector's edition". Still, even though I felt no need to spend money on behind-the-scenes video clips, I *had* hoped to see some of the extra gameplay. I dunno; maybe I'm just cheap. Even though the extras are supposed to be the little bit that bring Dire Grove up to a $20 level, I feel a little like the basic game has been deliberately robbed of content in an attempt to forcibly extract extra cash from my wallet. Ironically, by finding a place in this game to wedge a gameplay element from Madame Fate -- which I WOULD have paid $20 for even without the bonus content -- Big Fish has created a game that I DON'T think is worth $20, even WITH the extra content. Look at it this way: Dire Grove, on my first run through, with a fussy newborn distracting me and costing me time, I ripped through in 4:01:11. By comparison, in Madame Fate after 10 or more plays (during which some scenes I've almost completely memorized) my *best* time is 6:32. For some reason I don't see any morphing objects. I even cracked open the walkthrough and am not seeing any of the ones that were mentioned... is it me? I have clicked on that rug/carpet in the back of the grocery 900 times and it doesn't move. Is that bonus play included in the standard version? I think the morphing object are in the deluxe version. when I get to the ruins, even with all of the necessary items - mercury vial, feather, ashes, seeds... - there is no big hole, only a puzzle with four columns and purple glowy things...where did I go wrong and how ca I fix it!?!?!?!? Andrea, you have to solve the puzzle to get the hole ;) - Please have a look at the walkthrough above the comments - there you will find help. I'm stuck at the Celtic Ruin Site. 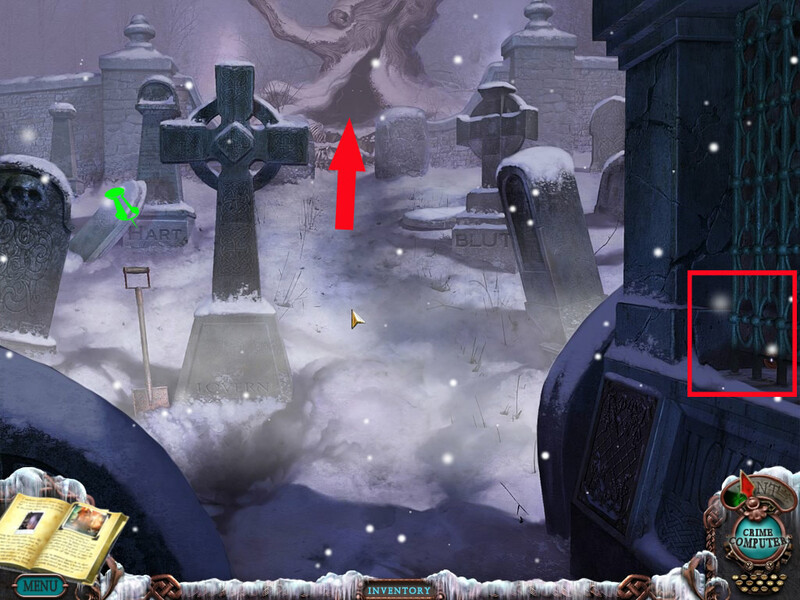 I have all the jewels to use on the headstone puzzle, but can not seem to find the correct sequence for placing them. Can anyone help me out. I am at the ruin site and went down the hole, but I need a ladder. I think I had one and used it somewhere else in the game. Is there a location that I can get another? cemetery with the tongs, but I don't remember if I retrieved the second one from the museum or the farmhouse as it states in the walkthrough. Somehow I missed the third one, and it seems like a game glitch to me? Anyone have any ideas? I have tried everything and I still can't get the bunny's head. 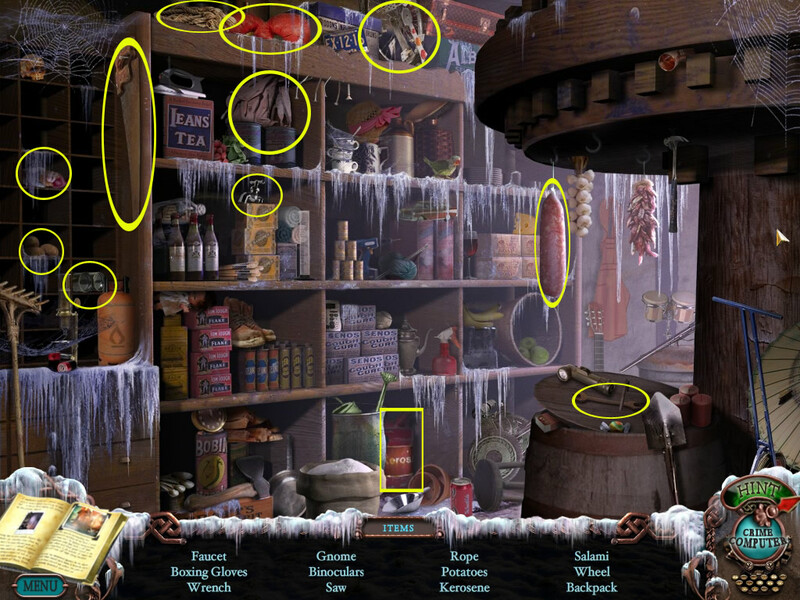 Also, I couldn't get the bag of potato chips because there was no "hidden object" scene after I poured kerosene into the lantern. It sounds, like you play the $6,99 version :). 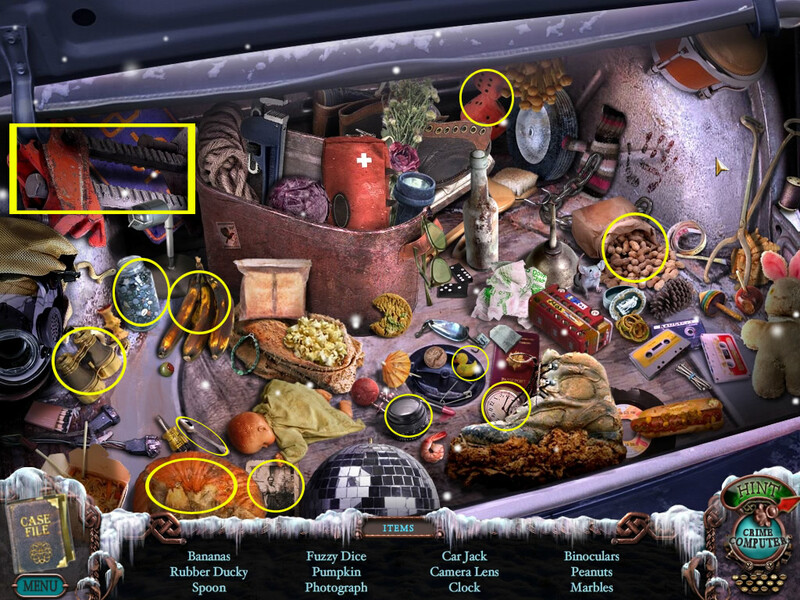 Potato-chips and bunny head (same as morphine objects) do only belong to the Gold-Edition from this game. So when you play the normal version, there is no need for this things, you can just go on. Just a suggestion (as it happend to me): Did you maybe already placed one coin in the vendor right in front of the grocery? Try to place the two other ones and see if you can get the needed seeds. Thanks for the tip, but no, I only have 2 coins total. I have put them both in the machine and pushed the seed button, but nothing happens. Obviously, because I only have 2 instead of 3! Ok, the bad news: I had the problem, that I could not finish the game once, because the ho-scene in the museum did not work properly. I had to start all over with another profile and then it worked. So if you already checked (and I'm sure you did) that there is no ho-scene in the farm house and the museum anymore, then you should give it a try with a second profile. After playing it once, it shouldn't take you more than an hour to come back to that point again. 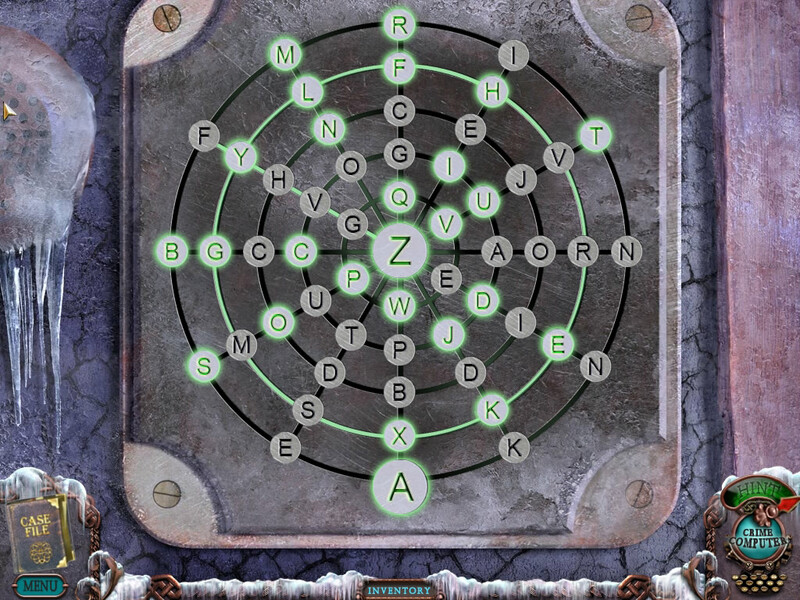 I'm confused with regards to the alphabet puzzle outside the blacksmith shop. I have the solution in front of me, but I don't understand how you can click on the letter Q then the letter U when the two don't connect by the green bars. Can anyone help with this?? Thanks! Before Q, you will have to click a P and from this place a Q that will be connected with the P by a green line. The correct choosen Q will then give you a green line connection for an R.
Green lines will only show up, when you click one of the letters and you only see the actual lines. The green line, you see in the screenshot belongs to the last connection I made. The highlighted letters are the ones have to be choosen, as there is only one solution possible. Even though I cannot finish. I have the same problem as Ales. I missed the third coin somehow. So I guess I have to start over! But still, they have really outdone themselves with this game. Really great. I have entered into this latest MCF game and love it. I need to know what to do. I opened the microwave before I was supposed to and it won't close. I put the frozen meat on the far away and the close up and neither will work. Rug won't move on the floor either. I jumped without thinking into this action. Can it be fixed? The carpet only moves in the gold-collection-version, so when you bought your game now for $6,99, it is ok, that it does not move. The microwave - you can't put the meat in? Or the door does not close? If last, try to press the green button, maybe this will work. If first - it sounds like a glitch - you should try to start over with a new profile - After playing it once, it shouldn't take you more than an hour to come back to that point again. im not getting the morphing objects either, judging by the comments left, im taking this as ok??? The morphin objects only morph in the Collector's Edition - so when you bought your game fo $6,99 it is correct, that you do not have them :). The answer to the riddle is: a seed. You need the seeds from the vending machine near the store. On top of these comments you will find the walkthrough and also a list with all inventory objects, where you find them and where you use them you might find handy. Can someone please tell me what you are supposed to do with the morphing objects, like how do you make them change or are they just supposed to change on their own? Please, please, please help me. 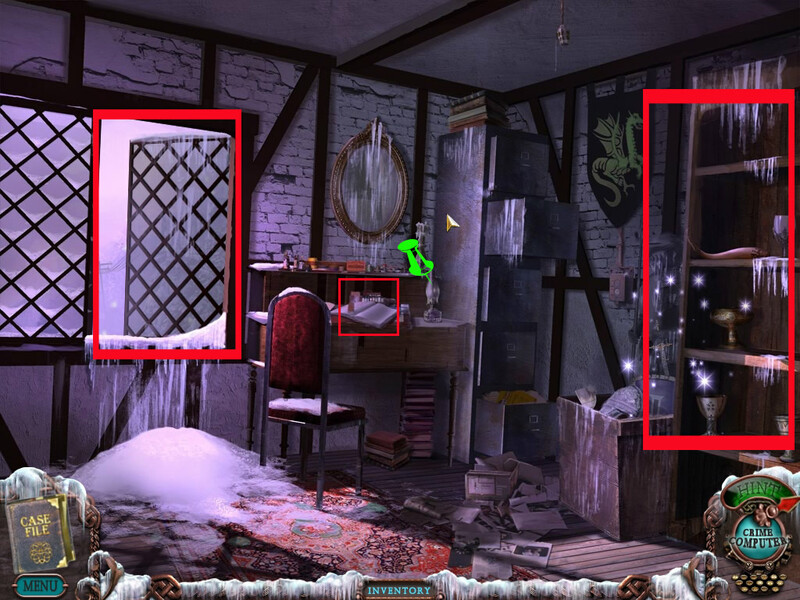 Sarah - the morphing objects appear only in the Collectors edition of the game. If you purchased the game for $6.99 or a game club coupon, then you will not see the morphing objects. i just fished the game and the game was great! :) although it was confusing me..
what will happen if you try the number?? and how do you get that number?? Hmm....I think I'm missing something. I've played the game through twice, now. Great game,as I expected from MCF, but either I have a bugged copy or I'm just not too bright, because one of the tapes just...isn't. I finally gave up and went through the above walkthrough (the "location of all tapes" part). The location of the one marked #3 has nothing there. At first I thought it was just because I didn't have the "collector's" edition - same reason I don't have "morphing objects" - but there's an empty slot in my list of videos, so I'm *guessing* it's supposed to be filled. After all, this is just the one "without extras" rather than a full game with parts taken out. hey it's me again. Ive picked up 15 of the 16 videotapes, but i cant find the last one and I have looked all over for it. can someone please, please, tell me where it is. I have used the walkthrough but to no avail. do the changing objects only appear in the special edition version of the game? ive watched some for ages and nothing happens. Sarah - you found the 16th? I posted the same problem, and no one answered. I still haven't found it. Any hints? Love this game, as I have all the other MCFs. Took me a while to realize I didn't have the collector edition and so didn't have any morphing items or that silly bag of chips. Once I realized you didn't need that to continue, it was fine. Got a trivia niggle that's making me nuts. You certainly don't need to know this to finish the game, and that sure is a cute little rental car in the videos. But what the heck make/model is it??? I can't ID it, so I'm asking if anyone knows. I did not buy the collector's edition so I miss out on the morphing objects ... Oh, well. I finished the game and waited and waited for some spectacular ending -- Something about a phone number? NOTHING HAPPENED. I had to click on the little (Main Menu) button and it returned me to the start of the game with 0 hours and 0 minutes of play time. What do I have to do to get the phone thing that everyone is talking about in addition to playing the game all over again? Someone please reply as soon as possible. 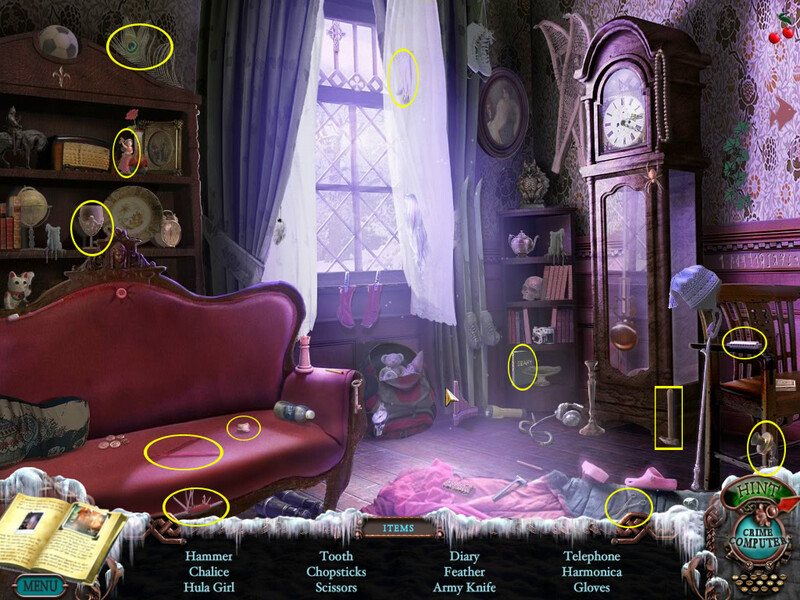 I need help...I am missing coin and can't buy the seeds, I don't see any more hidden object portals, please help! i was having an issue finding the 3rd coin as well. never noticed the gift shop in the museum was a place to go into...has a sign that says 'closed for the season' but i was able to enter and do the last puzzle for the 3rd coin. try that. I absolutely love this game, however, I am stuck only after searching a couple of rooms. I cannot find the key to the managers office, cannot find keys to the boathouse, or the other location that requires a key. I cannot find the sparkplug for the generator. I know this is a huge game, because I cannot hear the videos. The graphics are awesome though. Ok, so my question is this....What am I missing. 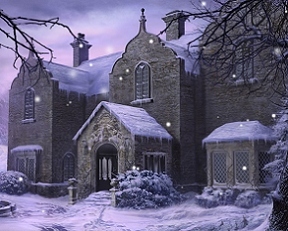 I have searched the rooms upstairs, I have gathered several items in my inventory, but nothing that I can use yet, and walked the grounds with no keys. What now? Somebody help! At the top of these comments you will find our walkthrough. All questions will be anwered there, I'm sure :). I think that the review should be edited to describe the two different versions of the game available now. I purchased and played the 6.99 version, but had I known there was a different version with more content from the beginning, I might have bought it. i have the urn but how do i get the ashes? I never got the third coin and still cannot find it. I have one from the graveyard and one from a HO but the other one eludes me and I have reached the end of the game. The coins should be: one ho-scene museum, one ho-scene farmhouse, one graveyard - maybe you should go back to museum and farmhouse to see if you maybe missed a second ho-scene. 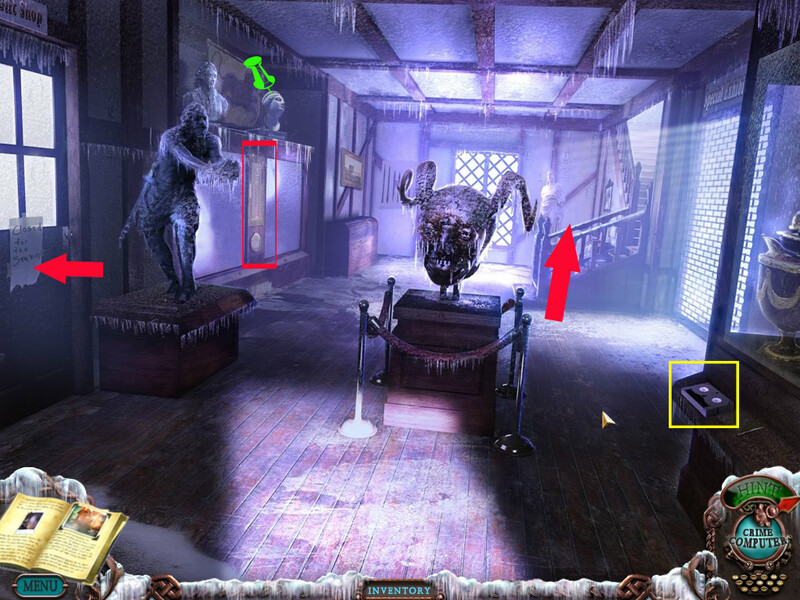 But there is also a glitch known for some players in one of the museum ho-scenes. Some players do not get the coin there - you might try to restart with another profile, as far as I heard (and had mysel) it is ok then. 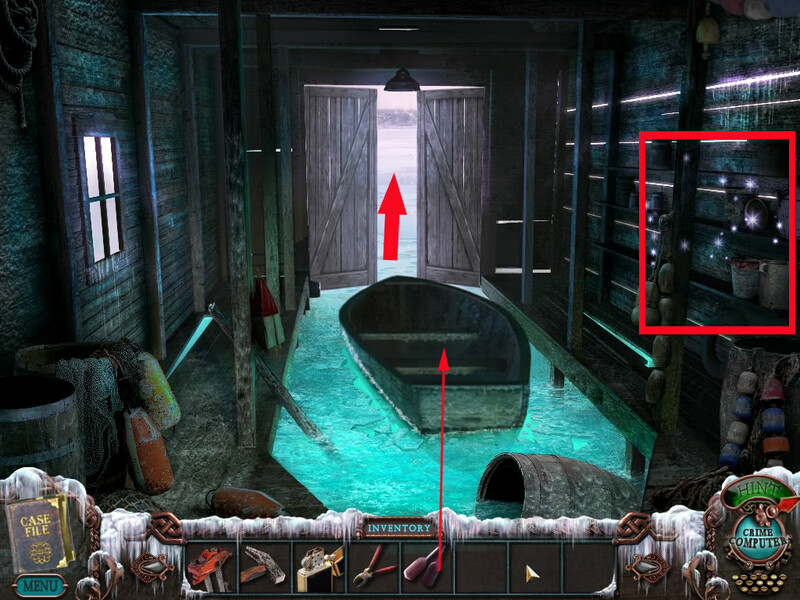 I can't figure out the sequence on the door puzzle in order to pick up the fisherman. trying to access walkthrough. I don't see any spoiler tag. Help pls. 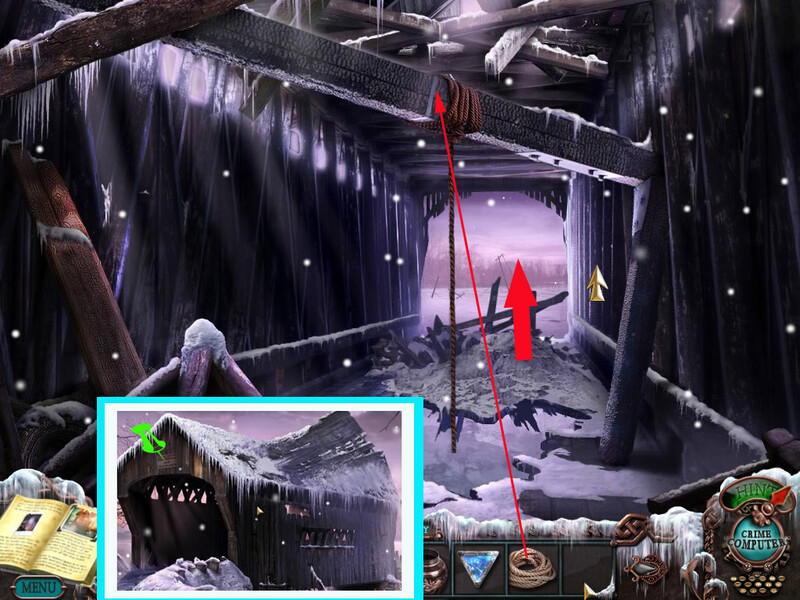 Trying to collect the videotape in Blacksmith but cursor changes to a down arrow and leads to exit of the scene. What am i missing? HELP!!!!! how do i get the wolf to take the meat, he doesnt seem to want it frozen???? You may also would like to have a look at our walkthrough on top of these comments to find additional help. ok, so, I'm almost done.. just got the plug for the generator, but.. eeep! the guide says to go back to the bedroom to do the trunk puzzle, but when I go there, I'm getting nothing with the trunk. No matter how much I click on it, it does nothin lol. I also don't have the manual in my journal, so I haven't already done it, I don't think? I got through the hole at the ruins and now I am stuck with the rocks with the celtic symbols and I don't know what to do, help! I too am missing a video tape. I got them all up to the last two listed. I see none on the way to the Ruins and there is one right inside the Ruins. Where is the one on the way to the Ruins? Would really like to finish the game. Please help. Where do you get the adhesive for the flamethrower to get to the ruins, i already have the piece of the hose though. Love this game but have had problems and I am using a walktrough. I downloaded the game but couldn't get to the phone charger. After several attempts with technical support someone emailed me and asked if I had the fireplace going yet. No, it wasn't in the walkthrough. I downloaded the Collector's Edition of the walkthrough and there were several pages that were missing from the first walk through that I downloaded. I don't have the Collector's Edition but everything is the same except for the Morphing Objects. I still need help. 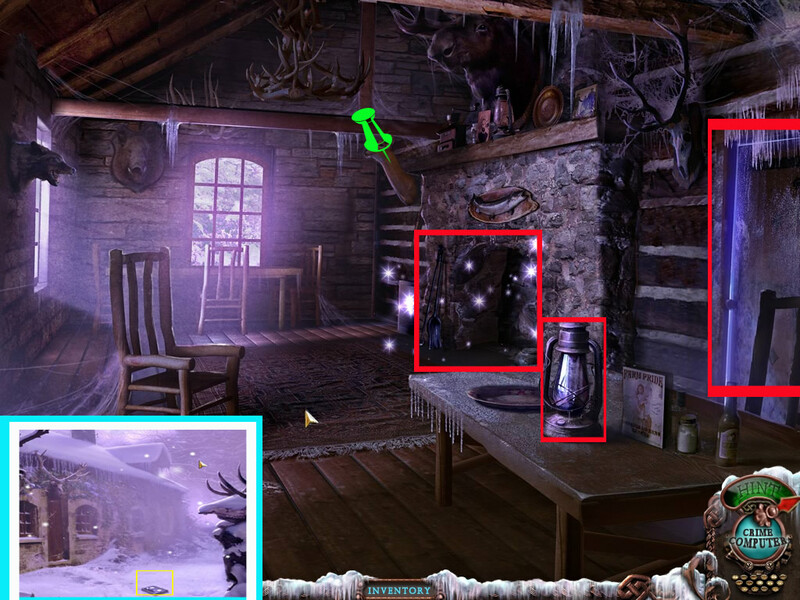 I got to the Hunter's Cabin, lit the lantern and there is no hidden objects for me to get the potato chips. I played past it and now am stuck because I have to feed the wolf. 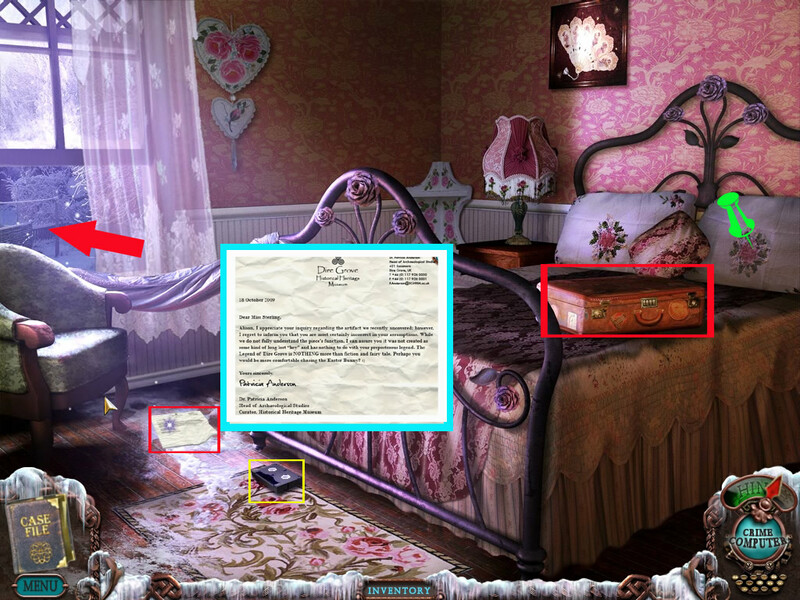 I have followed the walkthrough to the letter and as far as I can tell haven't missed anything. Can someone give me a tip on how to get the potato chips? I downloaded this, and I don't have the morphing objects and some things are missing from the game which are in the walkthrough, being described as "important to the game". Other than that, it's a really good game. I just hope I can actually finish it without those important clues. At the time the walkthrough was made, we didn't know exactly what would appear in the "basic" version and in the "Collector's" edition. We were told that only the additional content not be present in the "basic version". I'm enjoying Dire Grove but I'm in the basement of the inn and can't cut the hose for the patch. The only tool that can cut, in my invintory, is a pair of wire cutters and they won't work. Help! I was wondering the solution to the ruins puzzle? 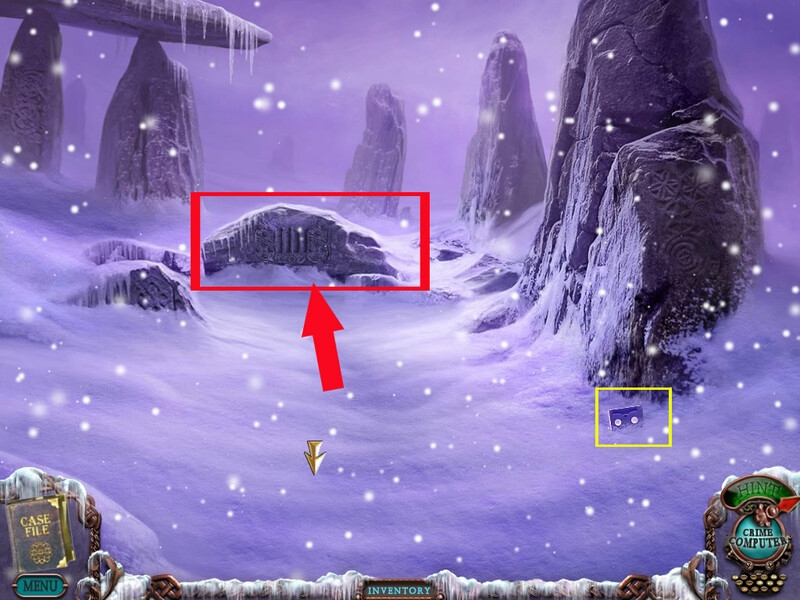 and whats weird is that the snow shoes wasnt used at all at last..
Oh, you used them - without them you would not have been able to go over the bridge to the tent or from there to the ruins. You do not have to perform any action to wear them, but when you do not have them you will be told that you need the right shoes to move on. 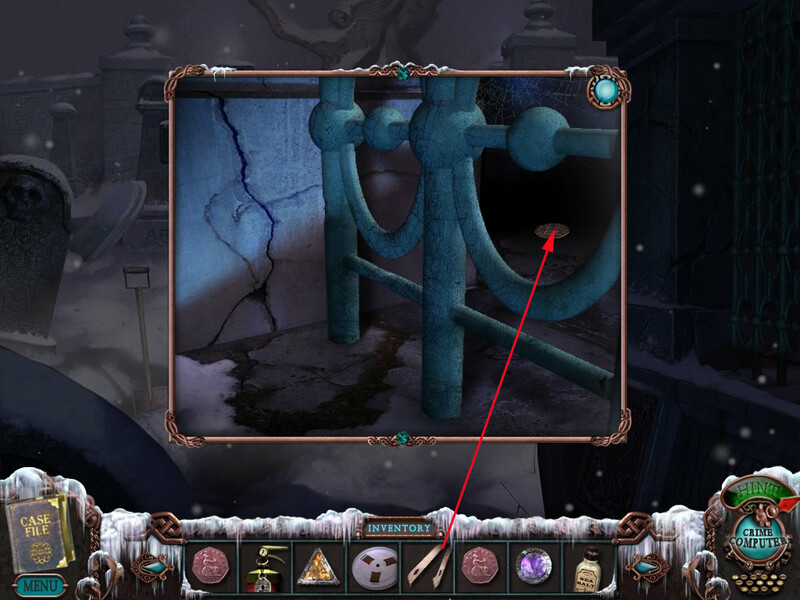 I am at the very end of the game and have made it through the ruins (solved the puzzle) the ground has shifted but in order to go down I must have a ladder. I can not find this ladder anywhere! After looking through the walk through and inventory list the only item I have missed is the bag of chips. I have gone to hunters lodge and there are no chips. Can somebody please help me figure out to get the ladder to finsh the game? 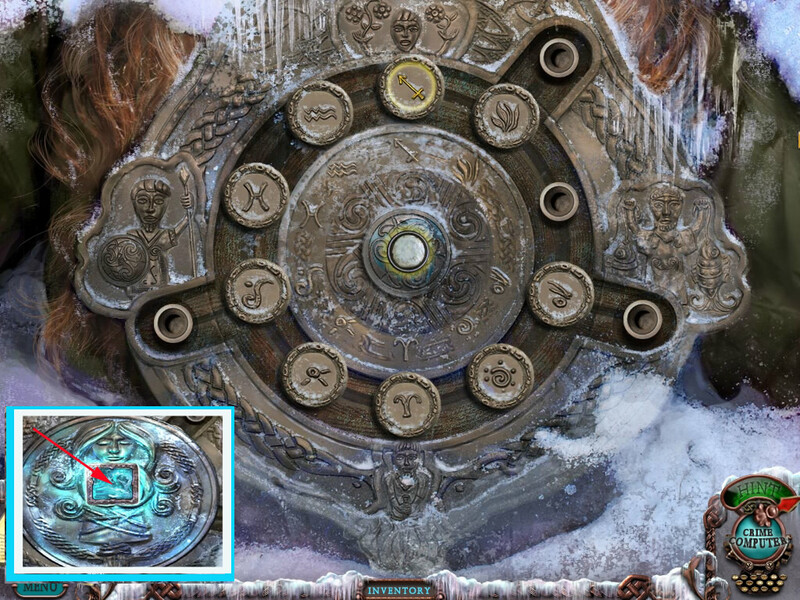 How did you solve the ruins puzzle??? At the ruins I put the special pieces collected from each student in the same order as displayed in the camcorder. 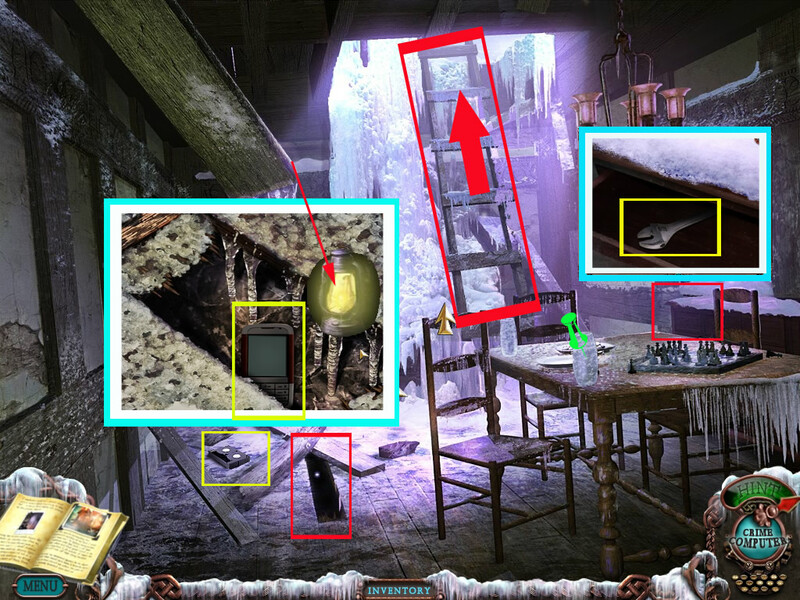 Once you have collected all the videos, open up the camcorder and you will see the sequence in which the pieces should be dropped into the ruins, hope this helps! I've gotten to the end of the game and am missing one of the video tapes. ( first column, third one down) Does anyone know which one i'm talking about and where i can find it. gone thru the walkthrough and cant find it at all. Please help. which is the "Main Room" that they're talking about in this game? and how do i get to it? 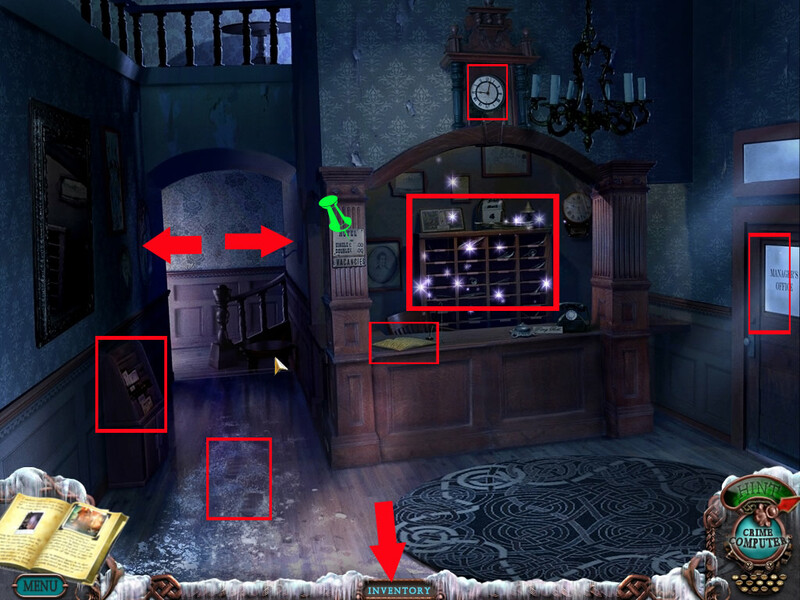 I am in the beginning of the game, I am leaving the managers office to go to main room..however there is no fireplace except in the lobby, and there is no sparkling area to access, to get to the phone charger...Help! In the museum, what does the broken exhibit with the arrow pointing to a button and the number 37 carved into the wood do? I got through game first go in five hours with no walkthrough guide and only using a couple of object hints to get over some of the Americanisms that don't translate over to UK. Really enjoyed it - despite it being a little short - and I actually thought the acting was pretty decent. Just finished the game. At least until the last few seconds where I put the last item in the proper stone. It will not fit. I have tried all different ways and looked on forums to see if others have had this problem. I have really enjoyed this game as it is the first one that I have purchased. But I do not know how to make the last item fit into the stone. HELP! 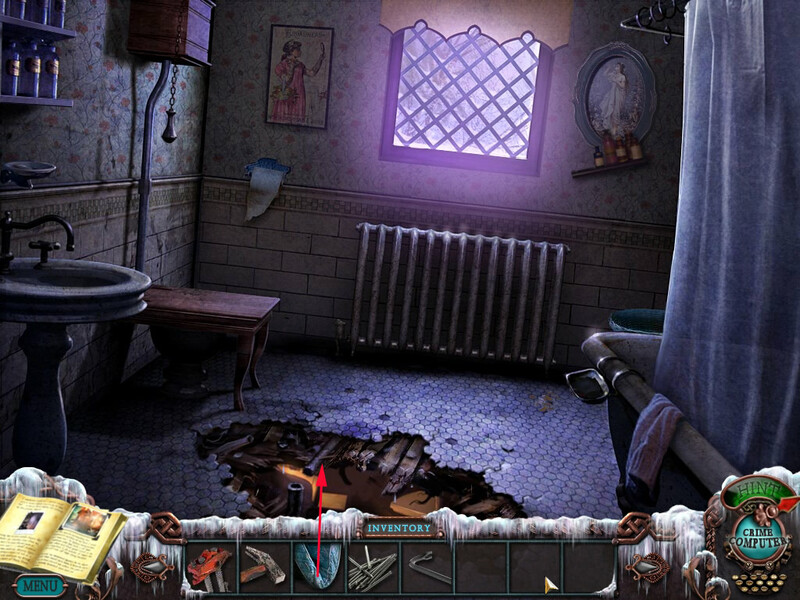 i began playing and after the first few video tapes and ghosts in the mirrors/windows i was too scared to continue. When will the next MCF come out like this one? By this I mean size and difficulty and puzzles that challenge. Liked the real actors also! hi everyone...i am stuck,i cannot find two of the videos.....9 and 13 can anyone help me please!! what an awesome game!! hello!could anyone tell me where the 9th tape is? 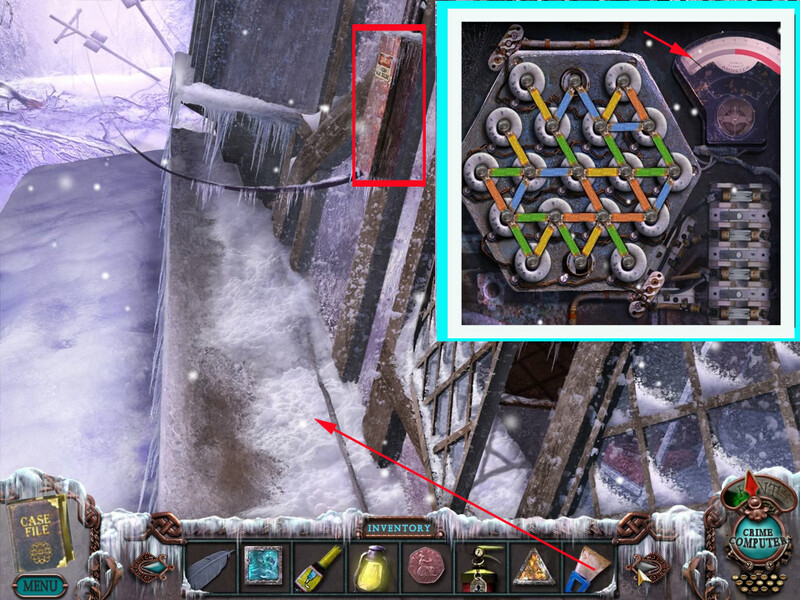 I am trying to put the relics in the puzzle by the runins so the tunnel will open up I believe I have the correct combination but the tunnel never opens up. I don't understand what I am doing wrong. where is the water main? i can't find it to use the crowbar? im missing the last video tape! i cant find it anywhere, help! megan: This question has been asked before. Search the 1st panel of comments for "last tape". There you will find the answer you seek. I got it in like 4.5 hours w/ help! More than half of it I got help... But I'm going to try it again w/o help... This is the only game I will be playing twice!!! So i looked at the first comment page and I still cannot find the last video tape! I tried to take the ladder back but it doesnt let me. Ok I have played to the cavern thing where you have to solve the 4 or 5 word puzzles and for the life of me I can not figure them out..Anyone know the answers? I figured out that I needed the meat to lure the wolf out but i accidentally fed it to him frozen and now i can't get it back to thaw it in the microwave! Is there any way to get it back without starting all over? I've already played the game once, so I know the clippers are supposed to work on the hose, but this time through, I am trying to use the clippers to cut the hose to use on the acetelyne torch and the clippers don't work. I get 15 different snide comments about why, but no action. i almost finished the game..
im having problem with the riddle on the last part,,the fifth one.the "silverstone thing".. I think the word you are looking for is mercury. Got all the way to the end where the riddles are, solved all the riddles but it won't let me place two of the objects in the stones. Is it because I still have the snowshoes in my inventory? If so, I didn't need them so why would that hold me up? Please help. The snowshoes you needed to walk in the snow, they won't go out of the inventory. So that can't be the problem. 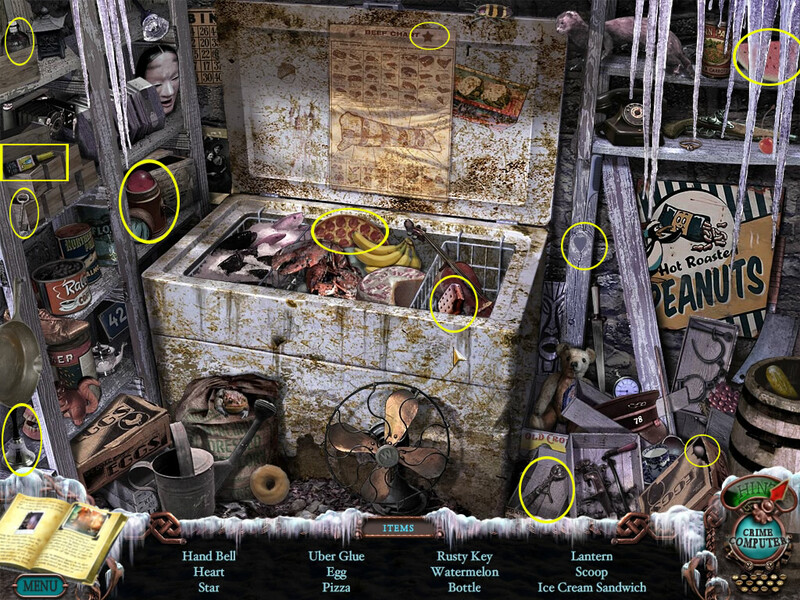 Which items can't you place? I so wish I had read that warning about the ruins before I tried to solve the puzzle there. I looked at the walkthrough a few times, but I really don't like using the walkthrough unless I'm REALLY stuck. So I didn't bother to look ahead and notice the warning. When I had gotten to the ruins, I thought I had everything, so I did the puzzle. Little did I know I had forgotten the sunflower seads. 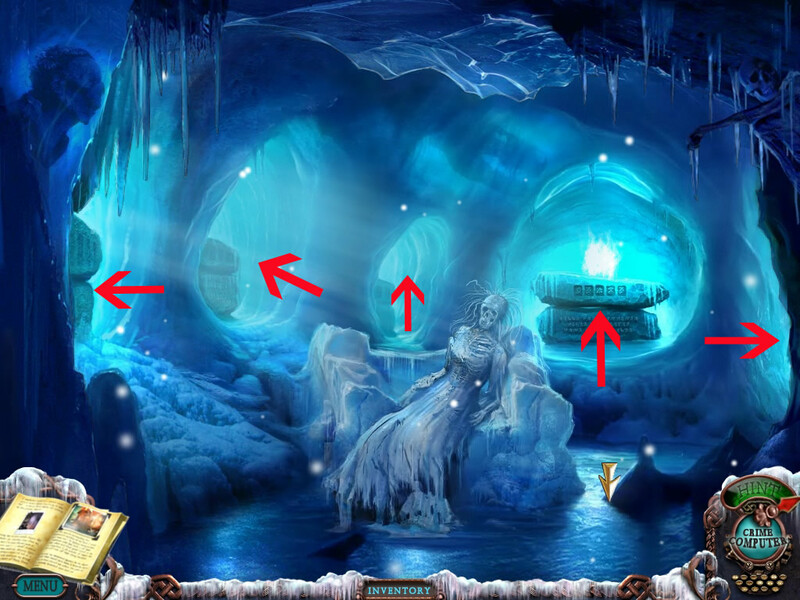 When the puzzle didn't work, I looked at the walkthrough to see what I was missing. I about cried when I finaly took notice of the warning. ;-; Is there any way to get around the bug? I love this game, but I don't have time to go threw this game again. Please, somebody have a solution! ainda estou com problemas com o quebra-cabeças do celular.o que é para fazer? como saber que estou fazendo certo? qual a solução? por favor ajudem-me. Hey all - I have played this before - when it was first released and thought I would go through it again. I am having trouble though - can't get the ho scene in the grocery to come up to get the kerosene. I have tried everything I can think of including closing and reopening the game. I have found all but the Hunter. Hi jay! i've played through this game 3 times now and i still cant figure out how to turn the washing machine on. How do I find all the coins? What use are the snowshoes. I have finished the game several times but have never had to use the snowshoes. Check the list of Inventory Items in the walkthrough above the comments. Can someone help please? I'm stuck for some reason I cant get the ice de-freezer bottle from the dumpster area. It will not show me a hidden object section. Does anyone else have this problem?